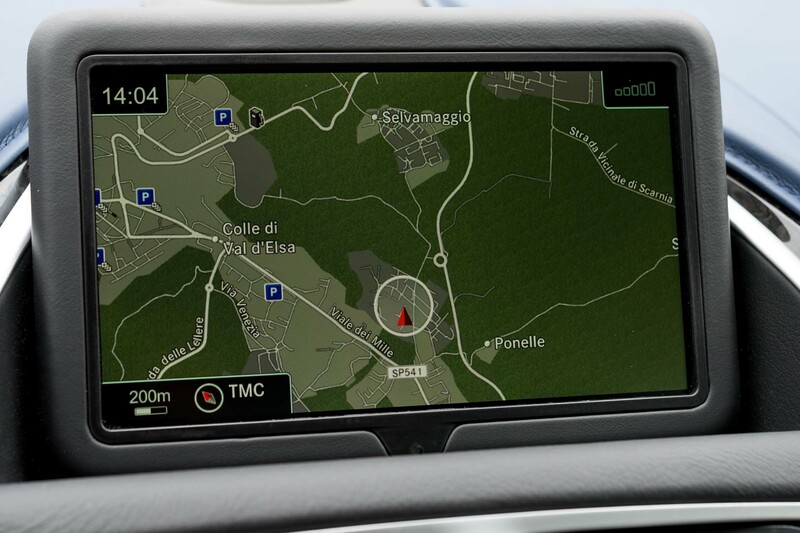 A face appears in the left-hand window, points inward toward the center stack, issues quick instructions to my co-driver, and boom: our route appears in digital form on the 8.0-inch LCD screen. 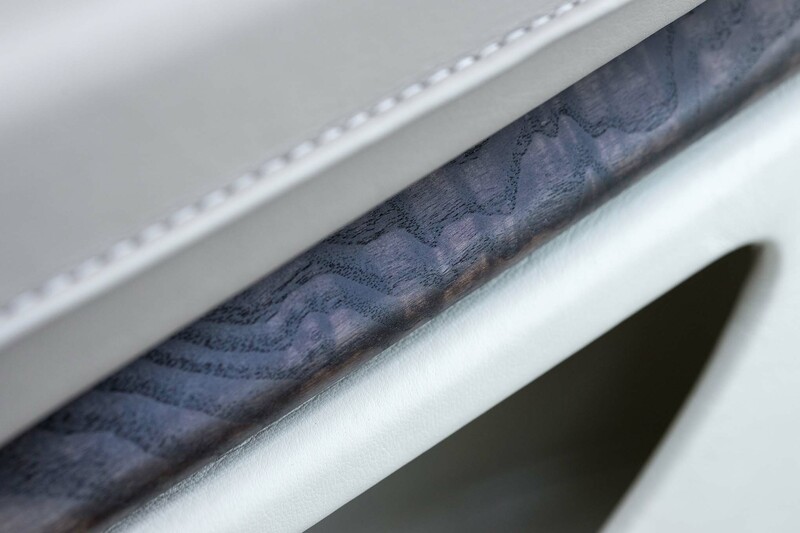 The printed map, it turns out, is merely an old-world backup. 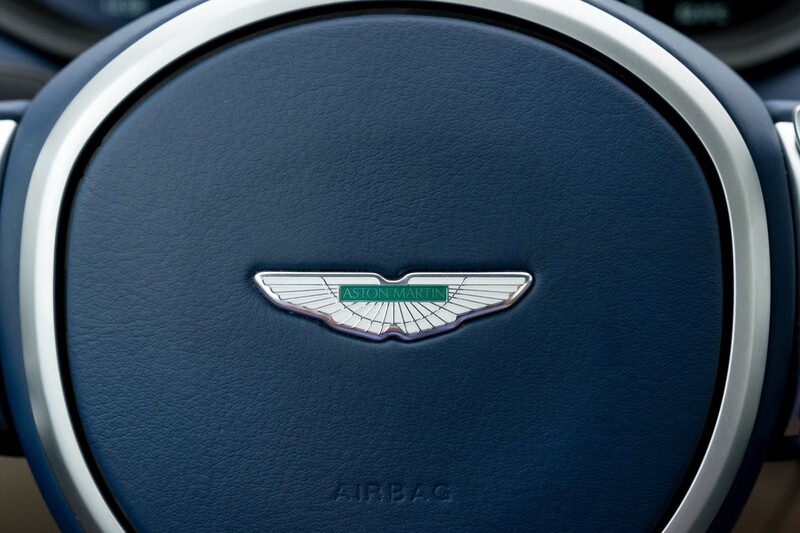 Smirks all around, then. 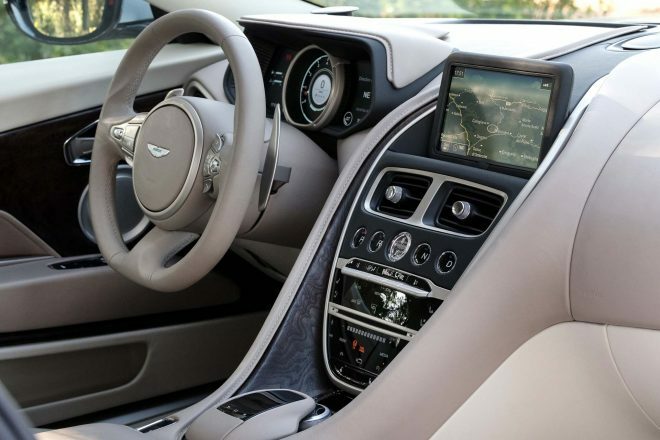 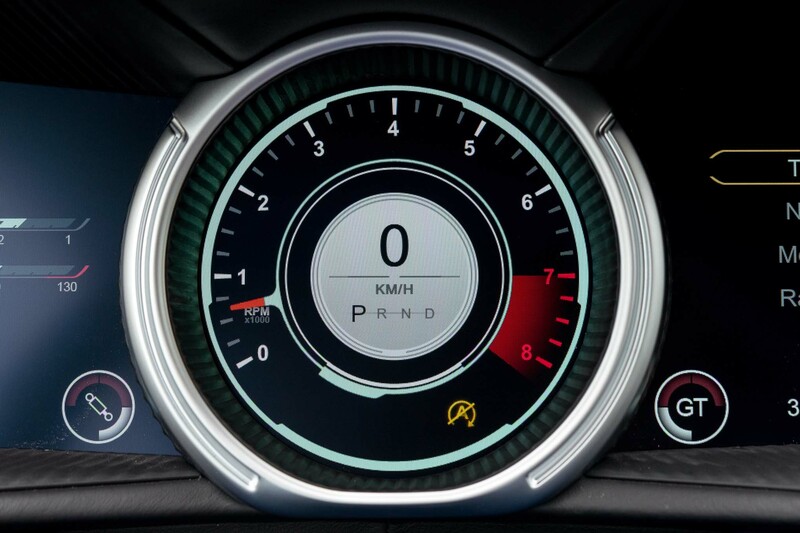 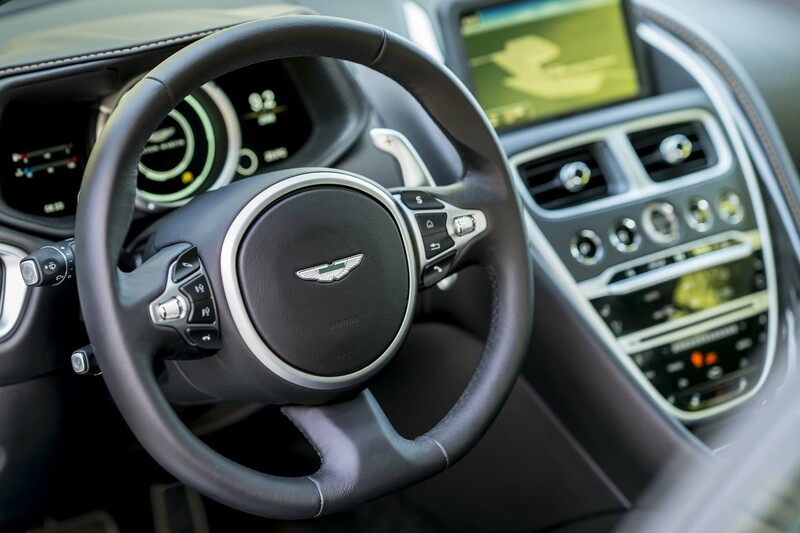 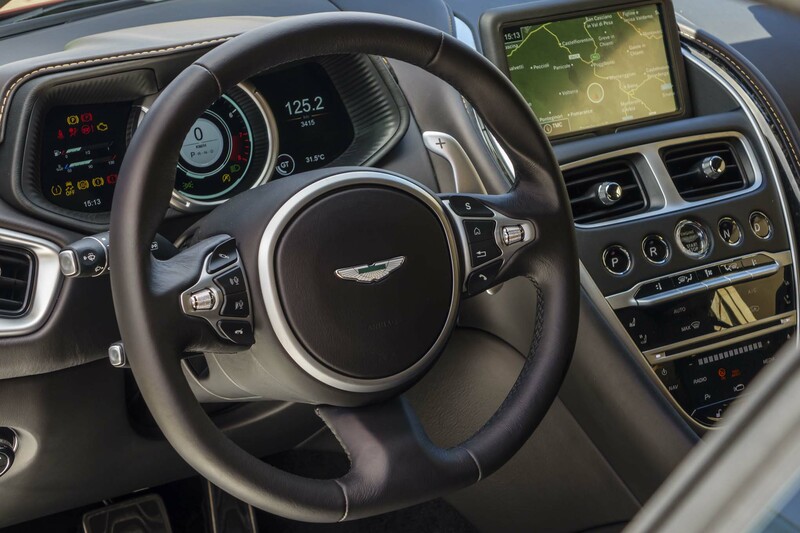 Mentioning the prowess of the new 2017 DB11’s Daimler-sourced navigation/infotainment right off the bat might seem a little odd — and “prowess” here simply means it all works as such 2016 technology should — but it’s perhaps the most elementary example of how Aston Martin is different these days. 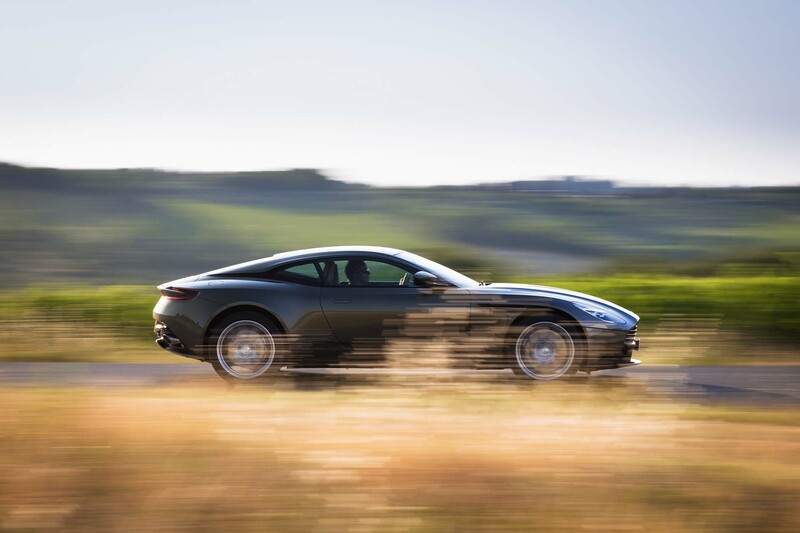 Far more important than infotainment, the Daimler deal will see Mercedes-AMG engines powering future Aston creations. 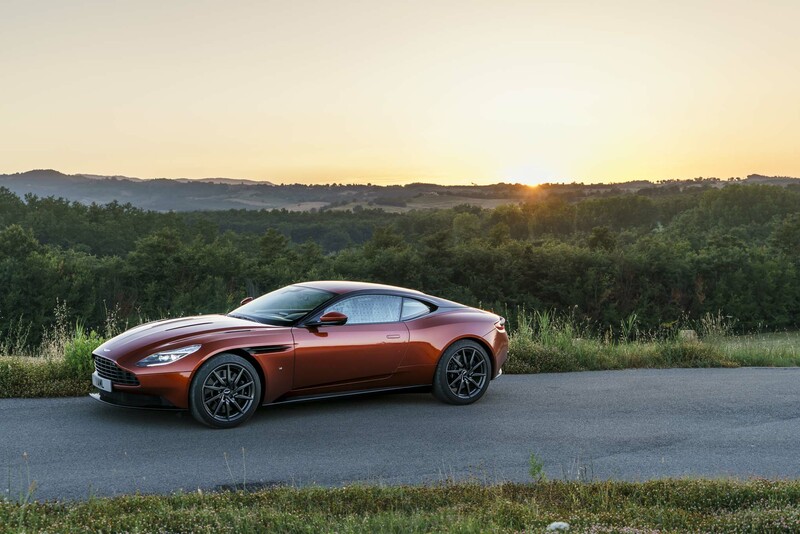 The change starts at the top with CEO Andy Palmer, who two years ago joined the marque from Nissan. 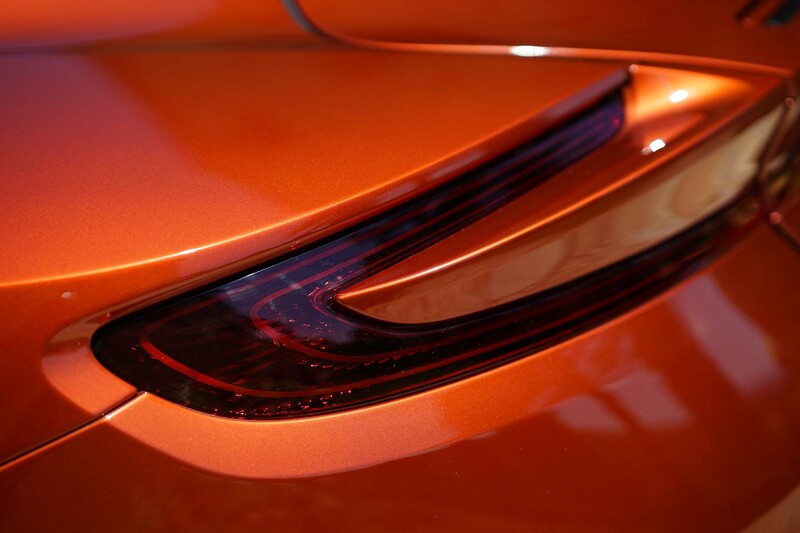 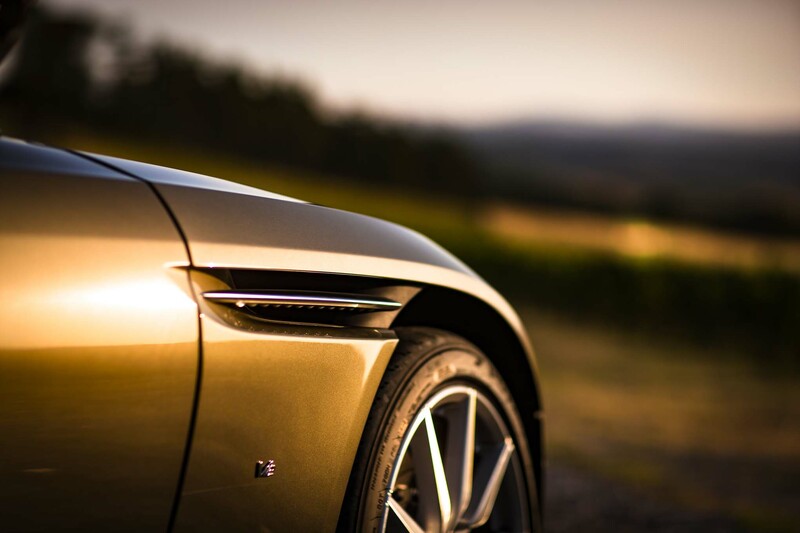 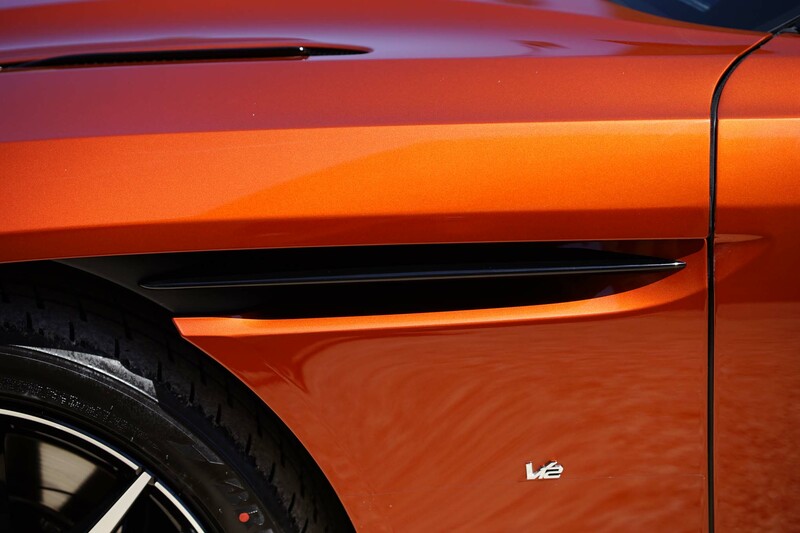 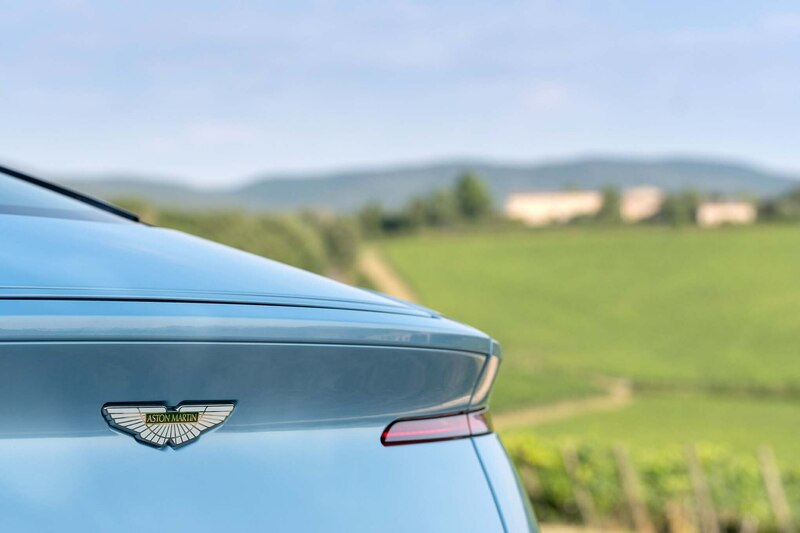 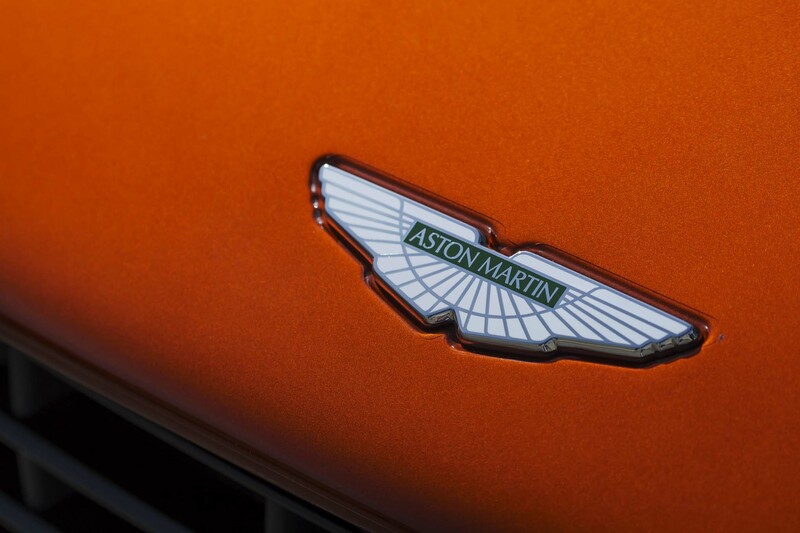 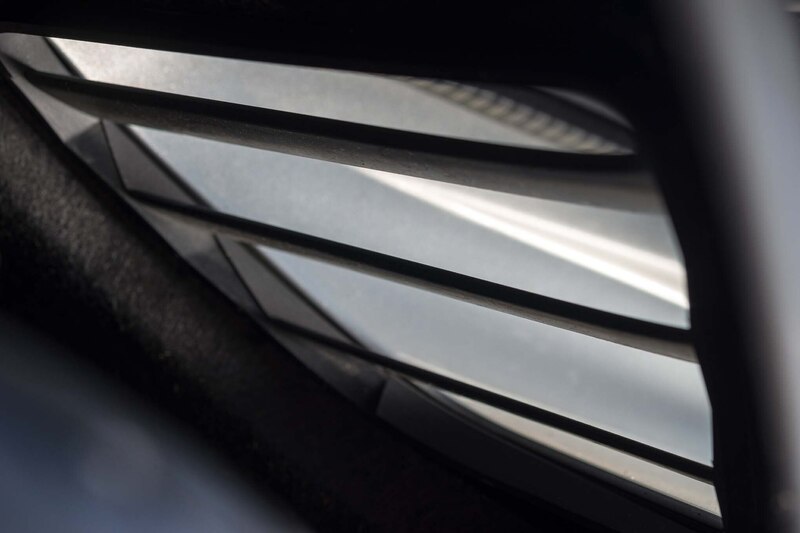 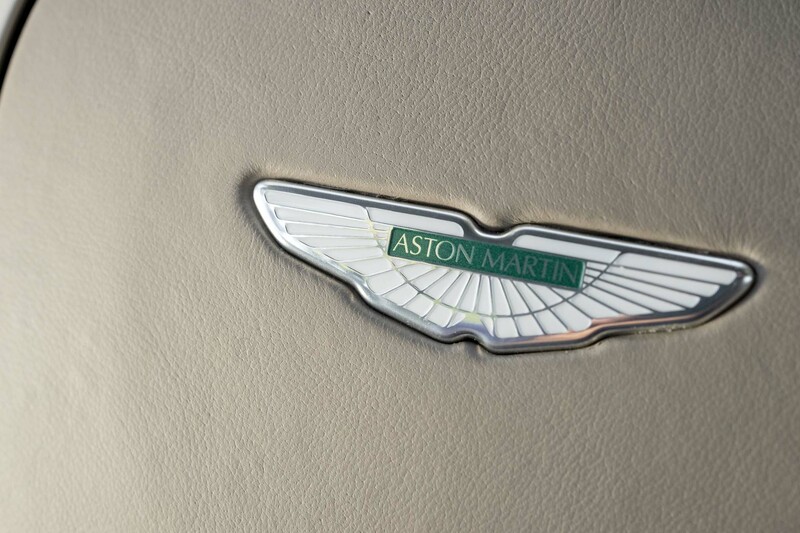 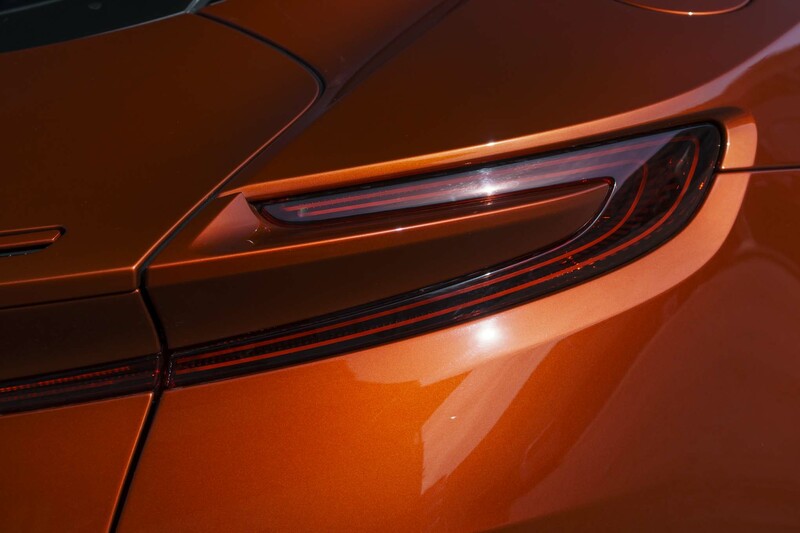 From Palmer to design boss Marek Reichman to product development director Ian Minards to vehicle attribute chief Matt Becker and everyone else plotting the course, there is unified understanding of what Aston Martin, without a deep-pocketed autopoiesis at its back, must be. 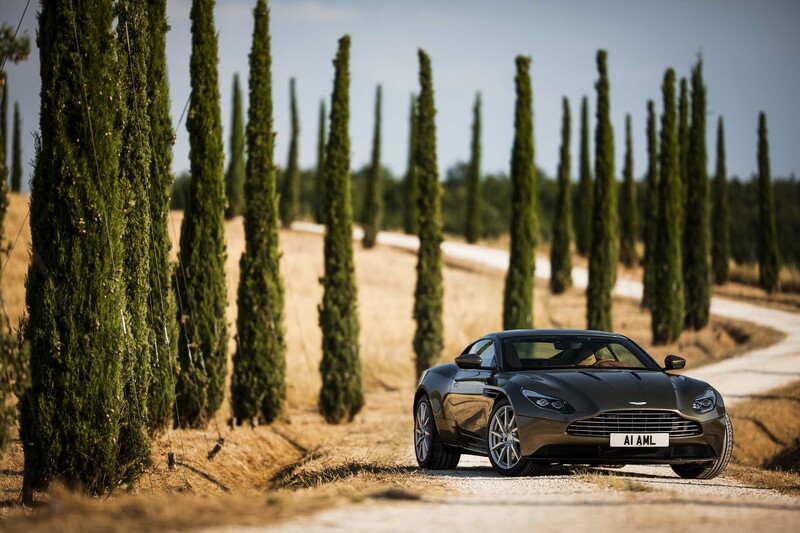 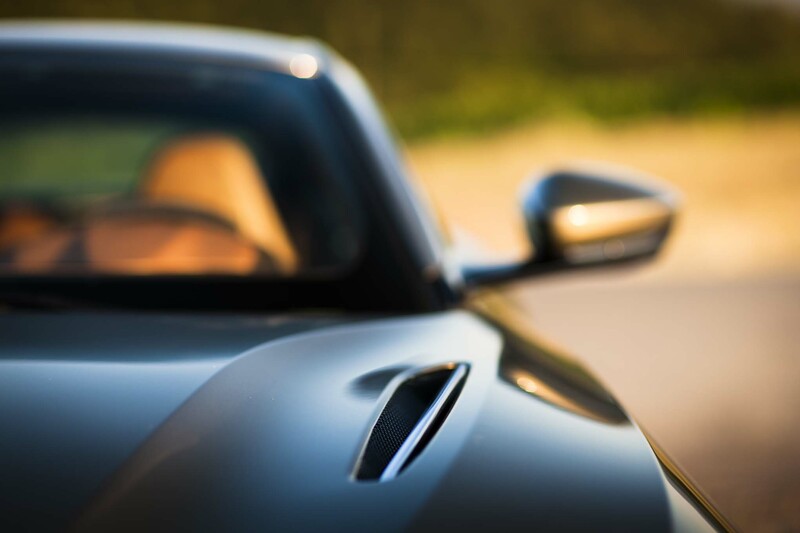 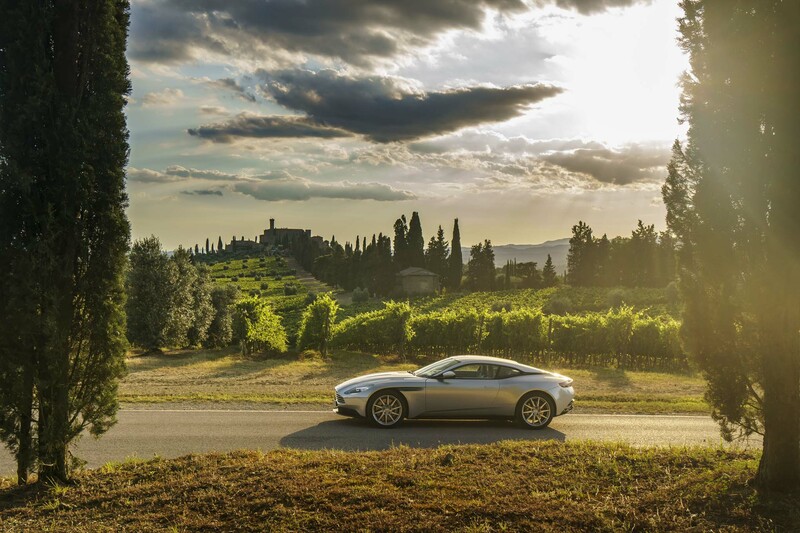 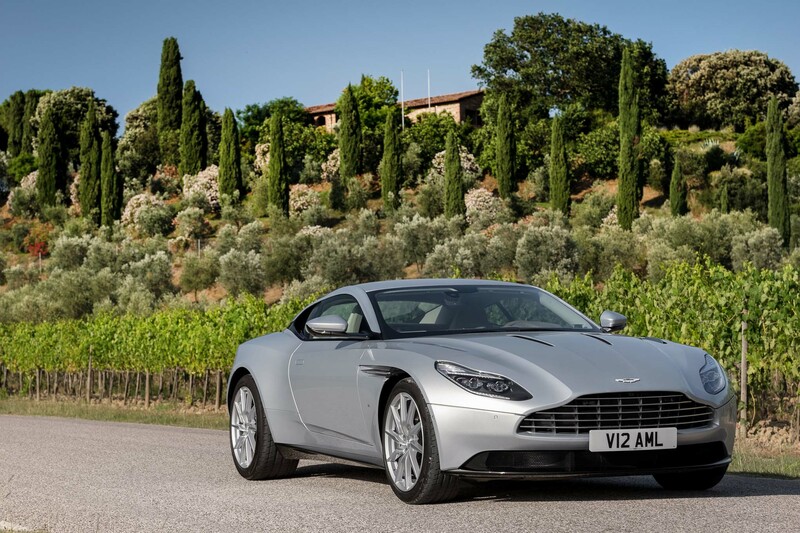 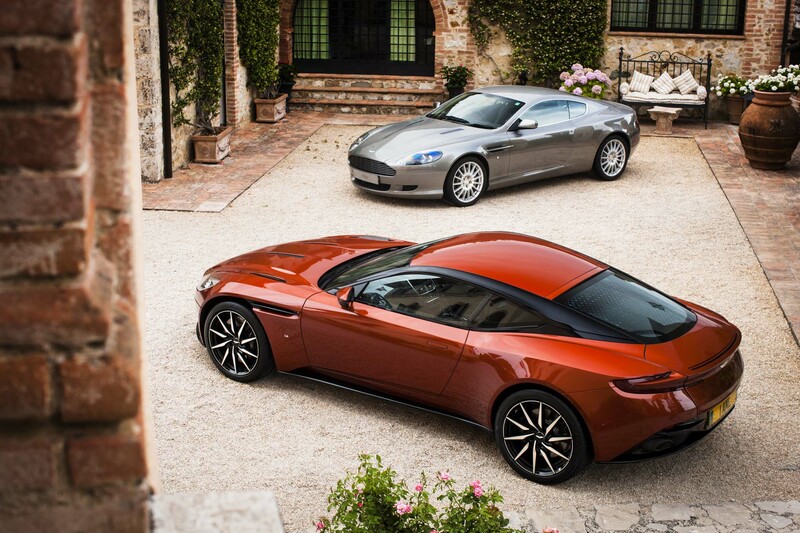 No more 12-year product cycles as with the DB9. 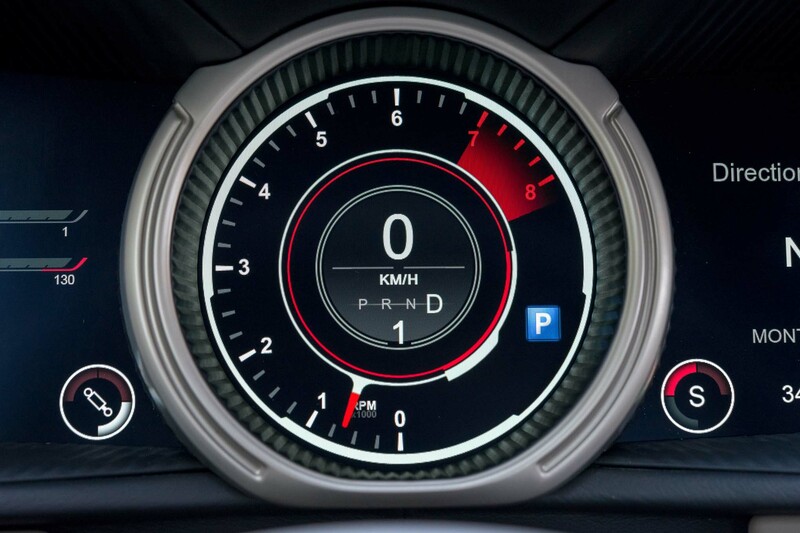 No more neophyte quirkiness in the product. 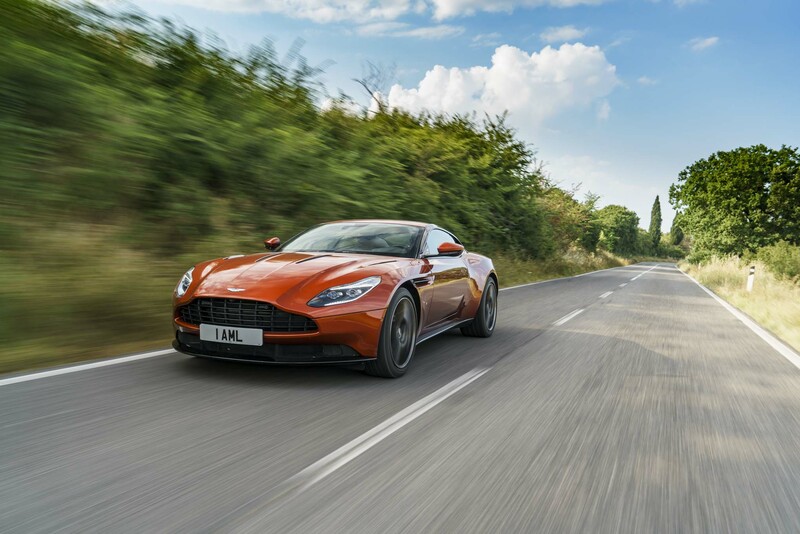 The DB11’s new, 529-pound bonded-aluminum platform, a construction Aston excels at, will support future sports-car offerings, and in a mechanical sense is the framework for the company’s six-year business plan that calls for a wholly revamped, seven-car model lineup (including an SUV) by 2020. 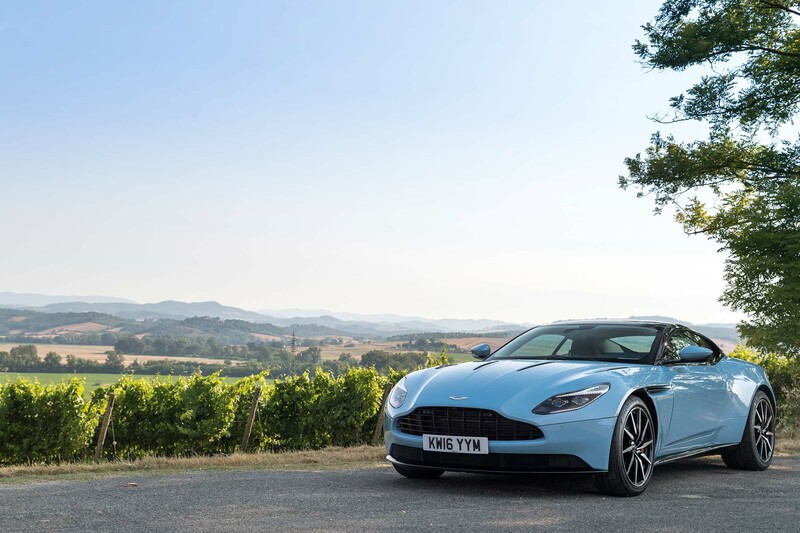 Add in special variants and stratospheric visions like the Adrian Newey-conceived, Formula 1-derived AM-RB 001, and you should expect something new from Gaydon approximately every nine months for years to come. 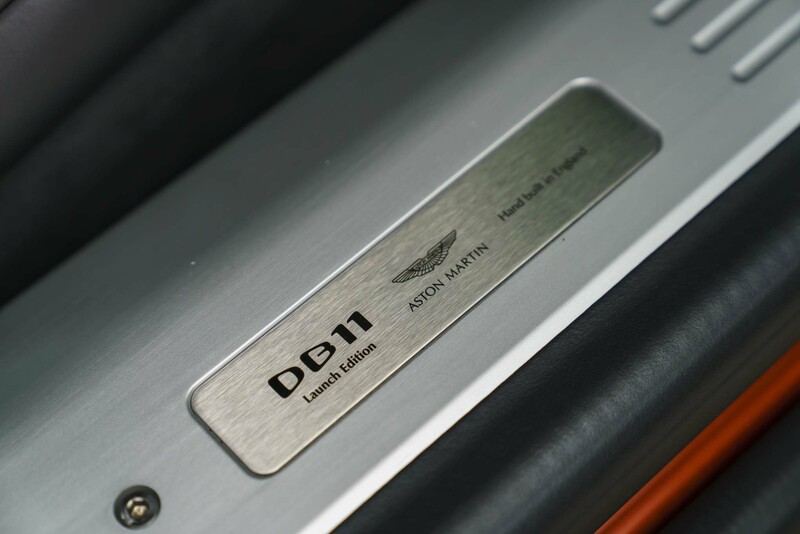 This in a snapshot makes the DB11 the Most Important Aston Martin Ever, as we pegged it earlier this year. 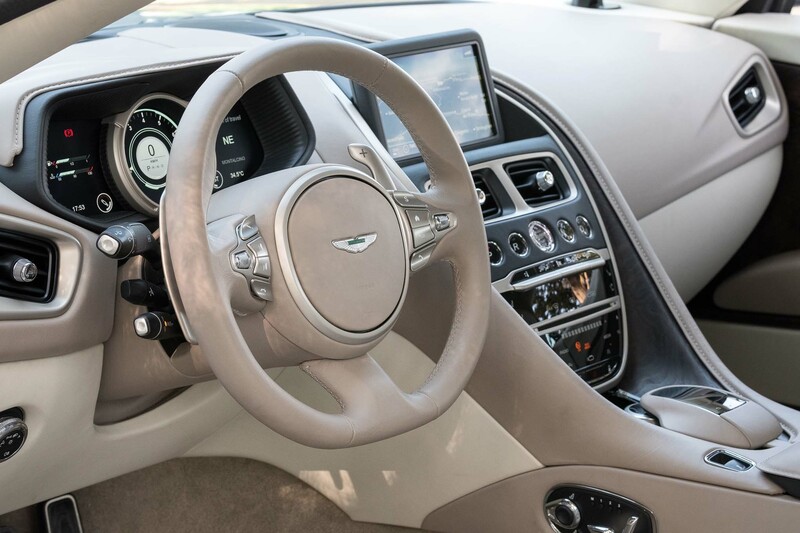 At 186.57 inches, the car is just three quarters of an inch longer than the DB9, but a wheelbase stretched by 2.5-inches works with the new chassis architecture to expand the cockpit significantly. 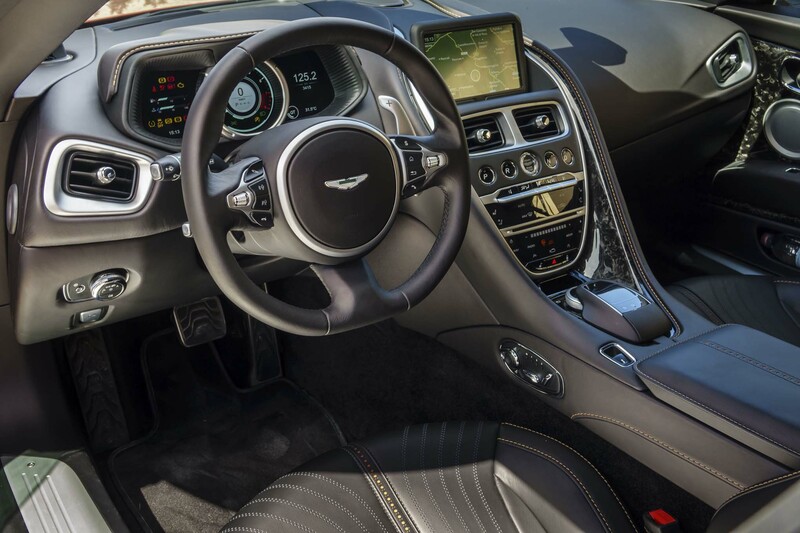 Six-foot-plus drivers and front-seat passengers enjoy more-than-generous leg- and shoulder-room. 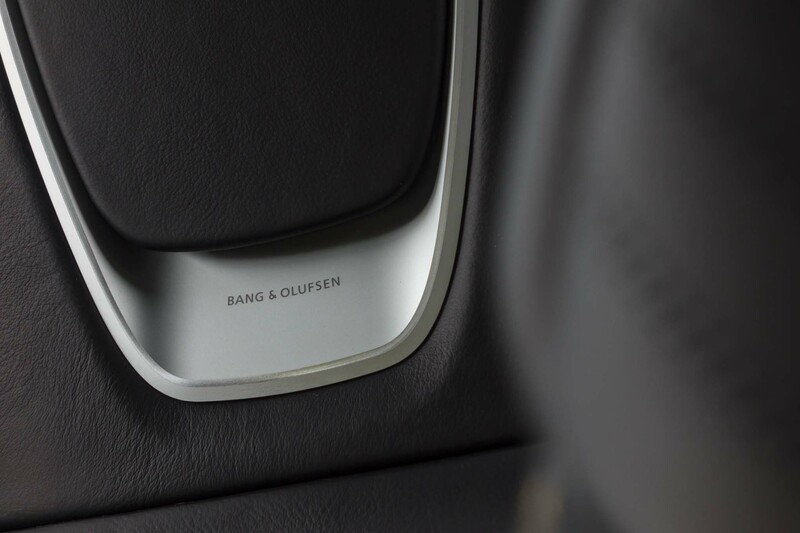 While the rear seats remain accommodating mostly to children and small adults, they will suffice for larger occupants on short journeys. 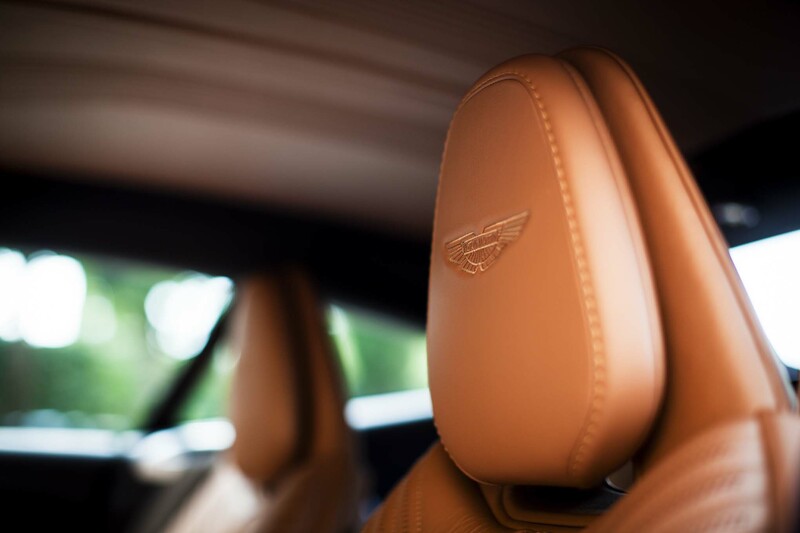 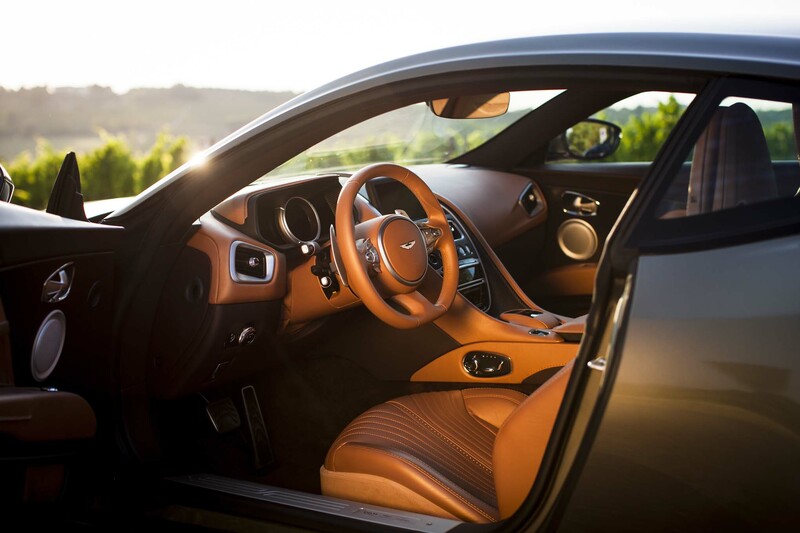 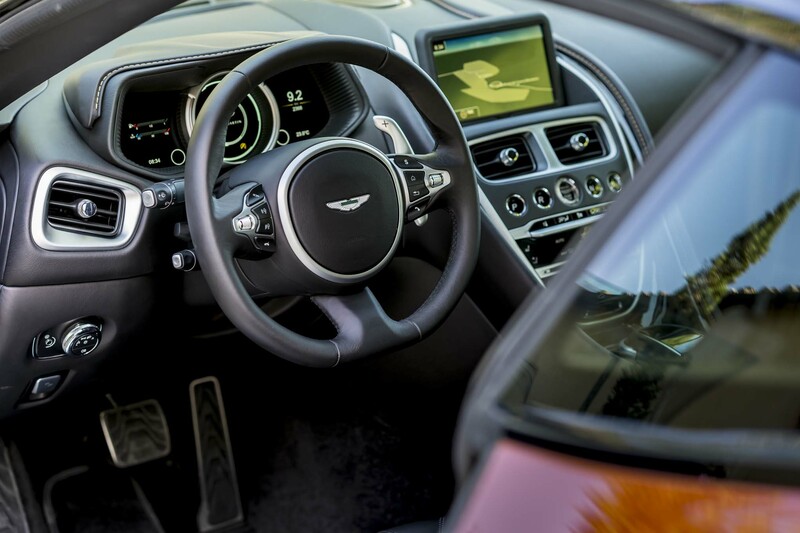 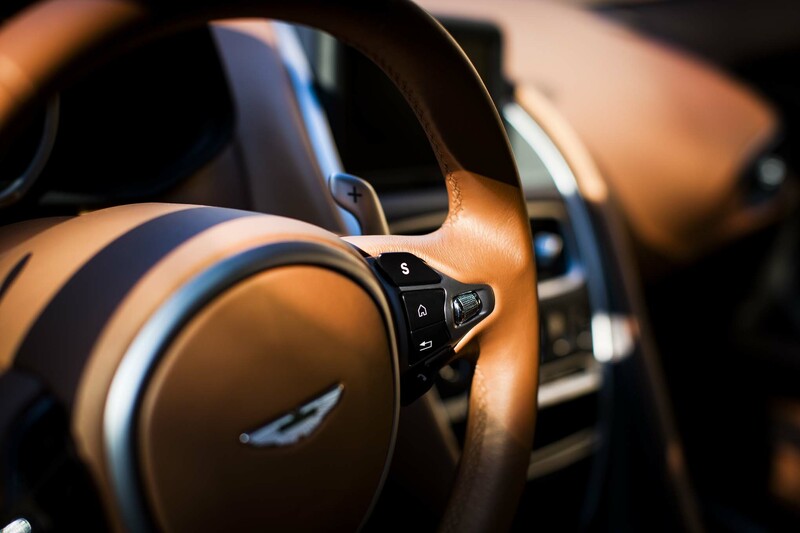 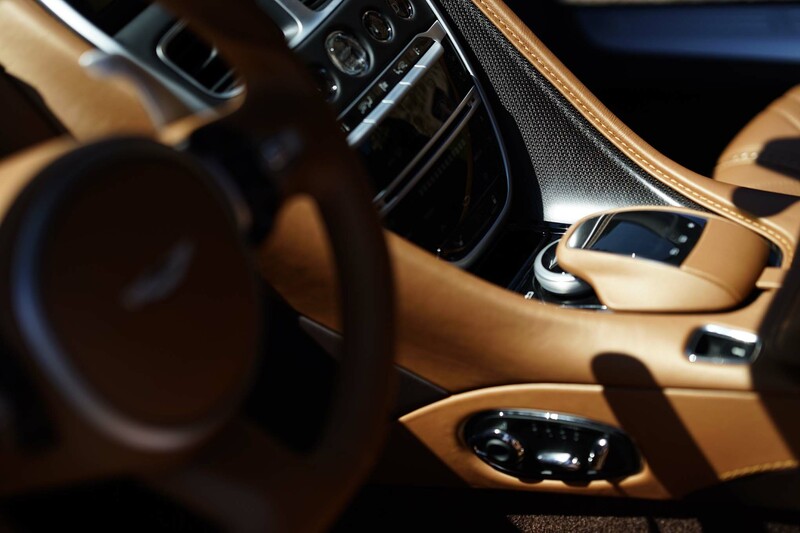 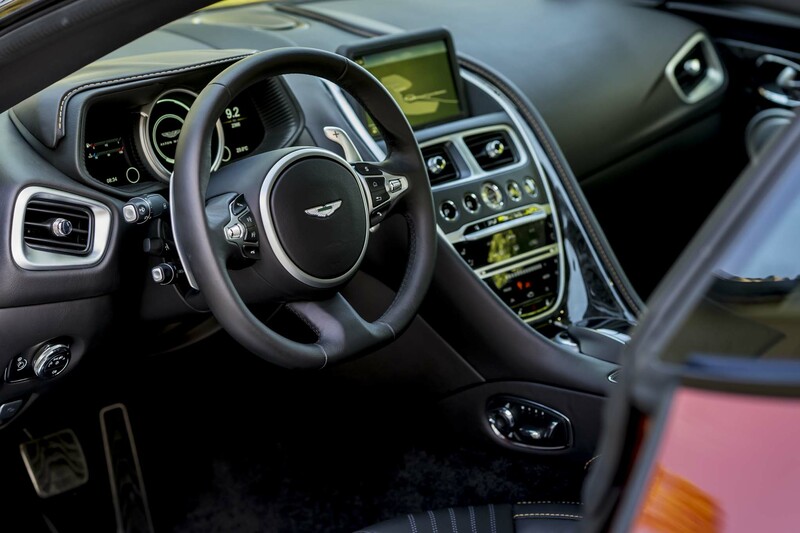 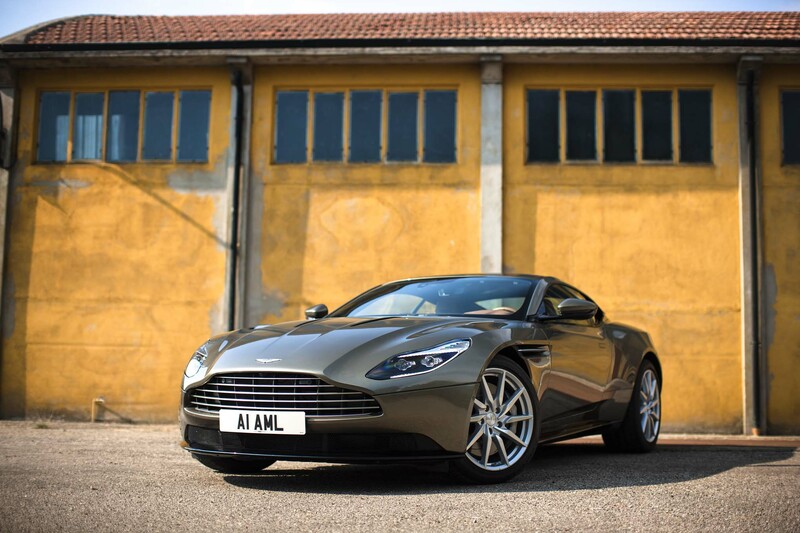 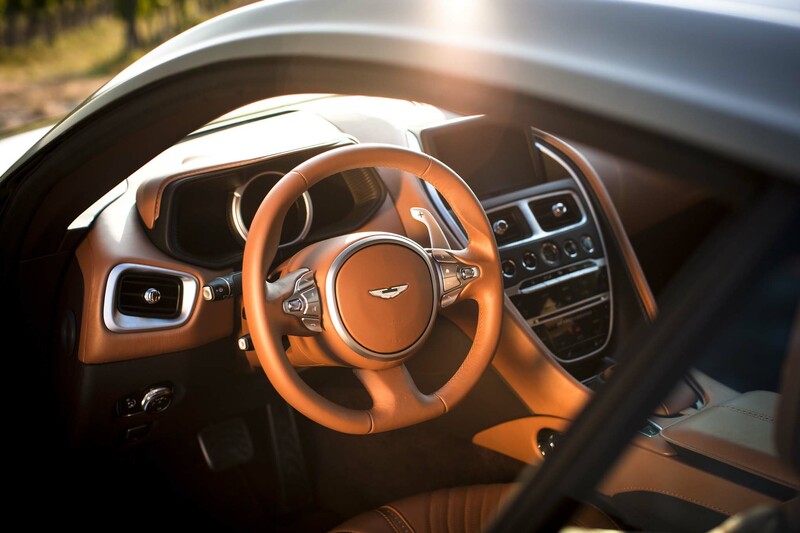 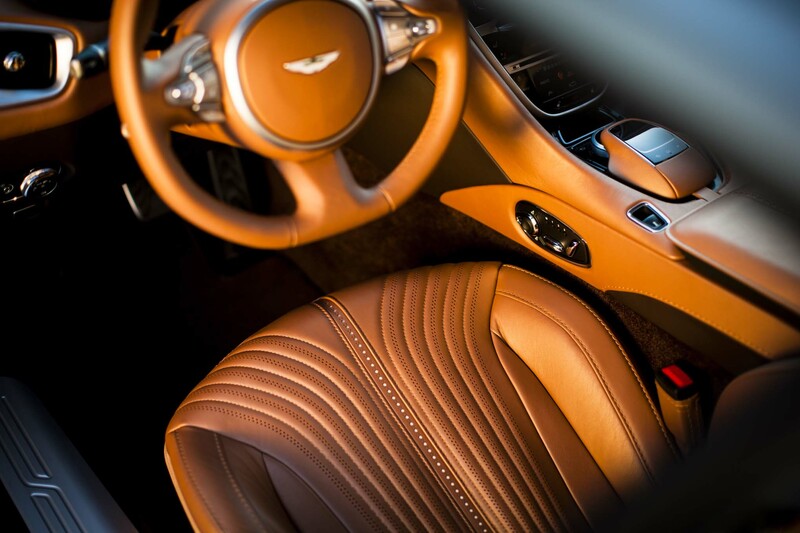 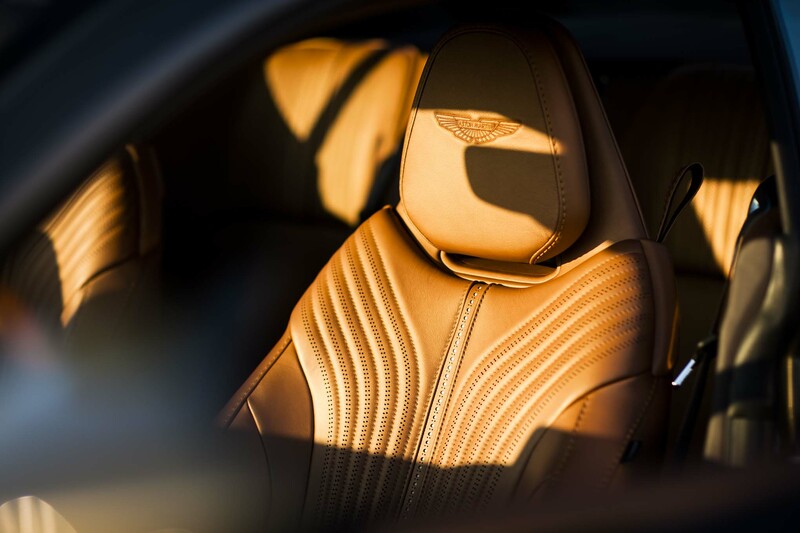 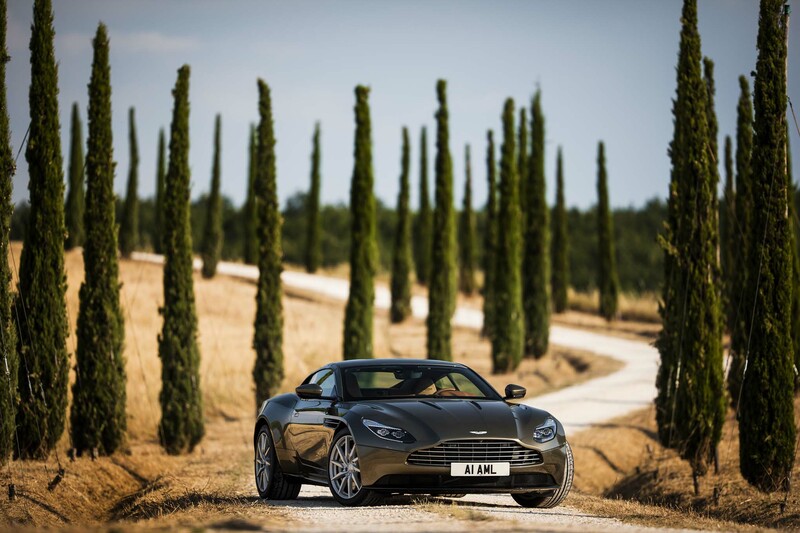 Beauty, both inside and out, remains Aston’s prime characteristic, Palmer affirms, and the hand-stitched cockpit leather provided by Scotland’s Bridge of Weir comes from cows raised on fields free of barbed wire. 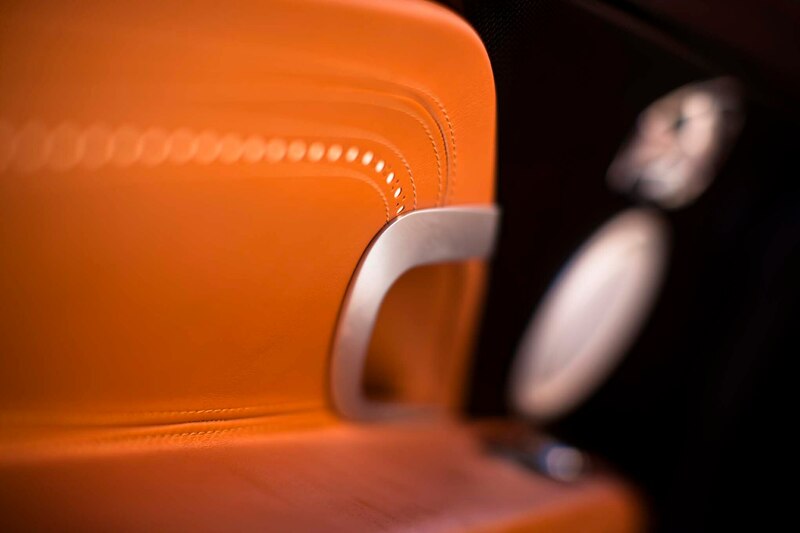 No nicks or lines that way, natch, and contrasting color visible through brogueing is a deft element. 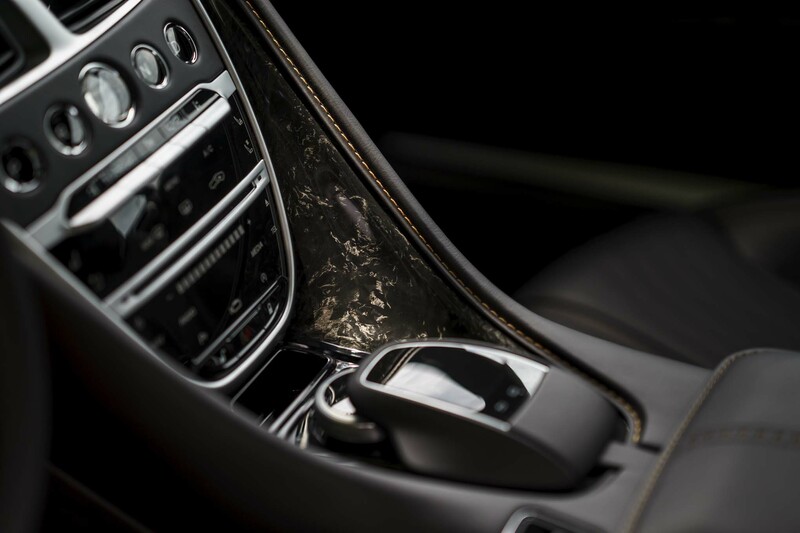 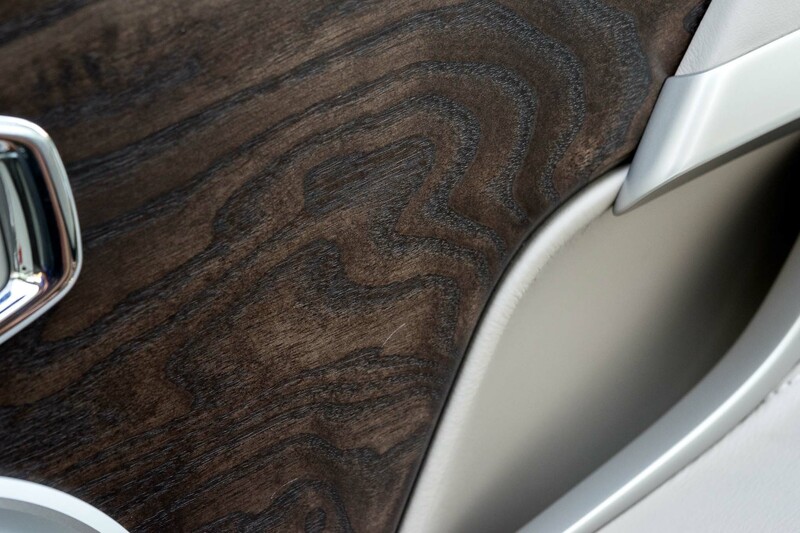 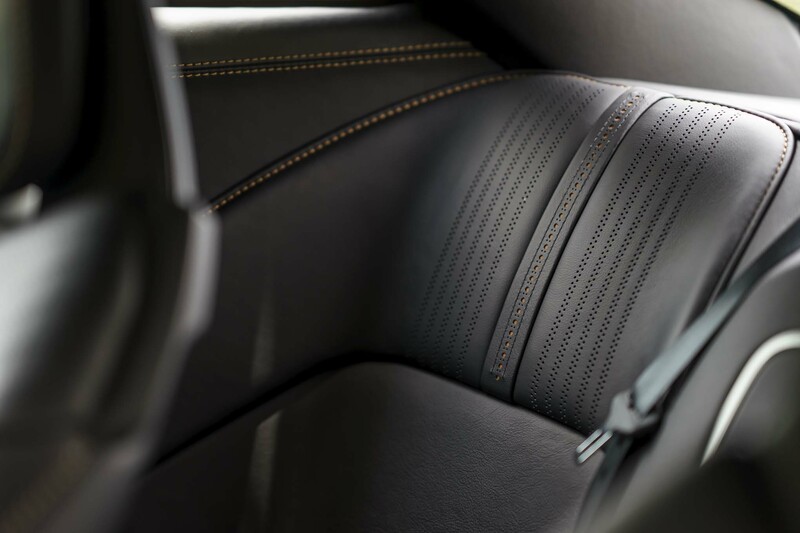 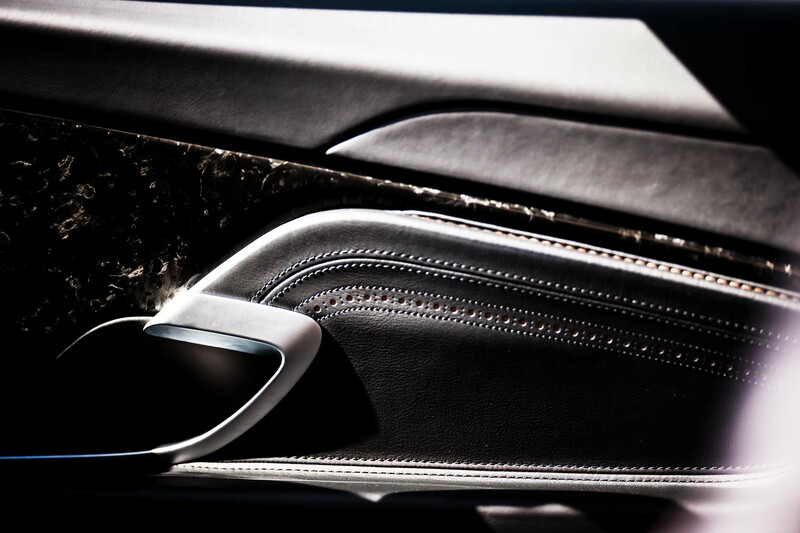 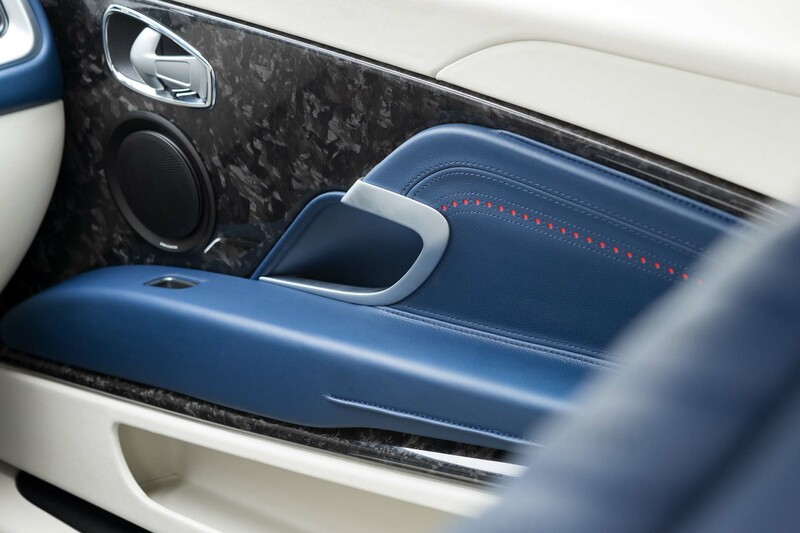 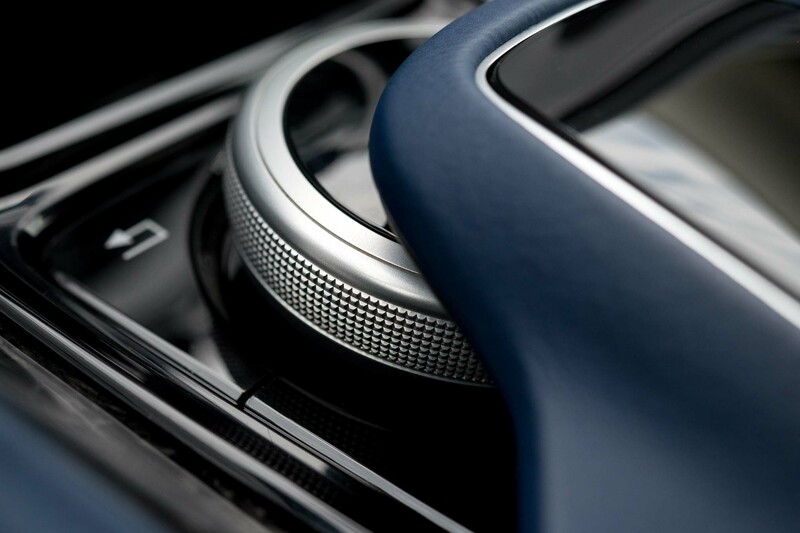 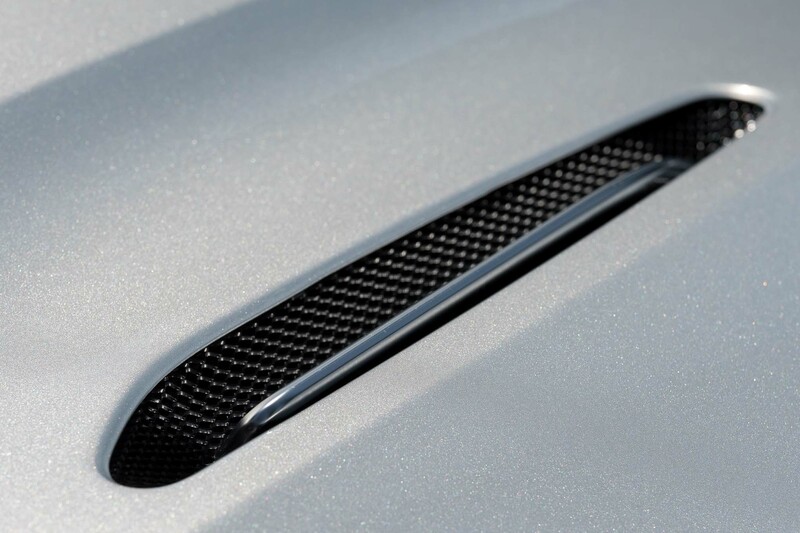 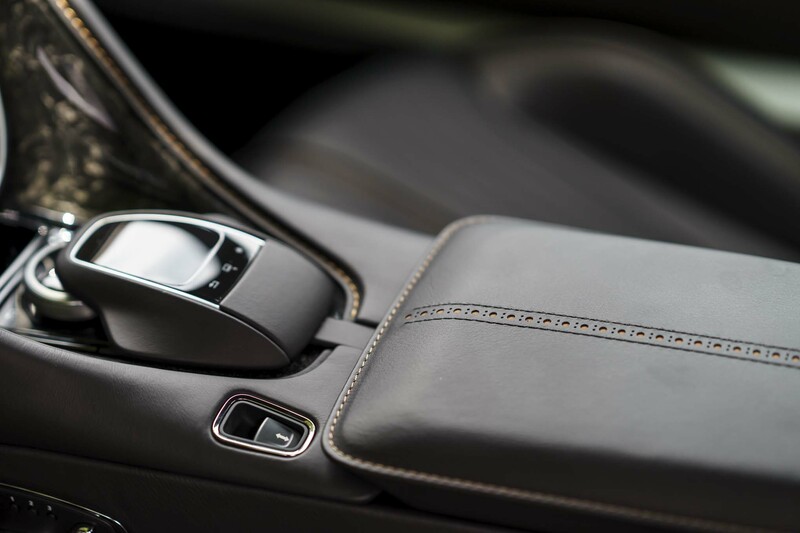 Optional carbon interior panels provide a random, chop-layered strand effect that’s more stone-like in appearance than traditional woven-fiber. 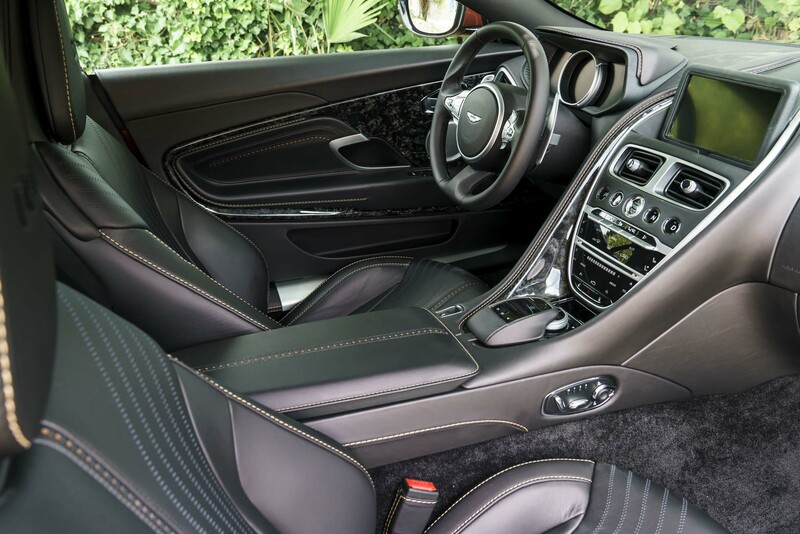 It’s a look that makes bits of standard piano-black trim seem like out of place low-budget pieces by comparison. 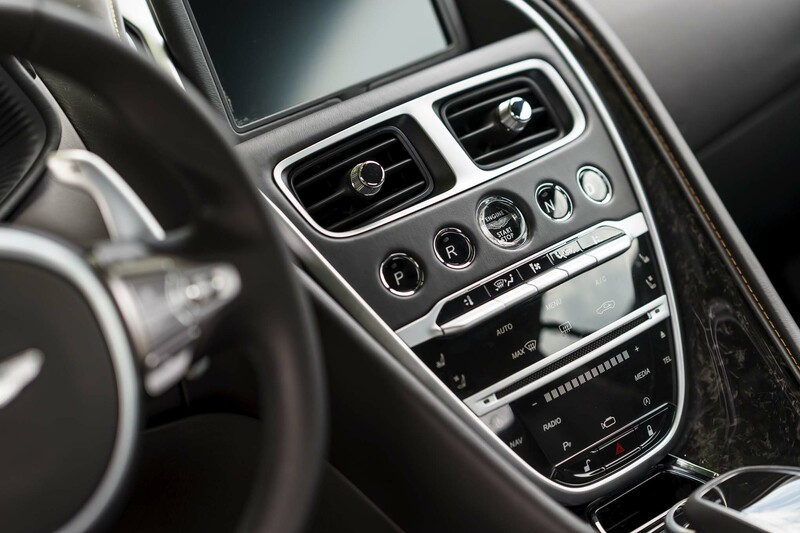 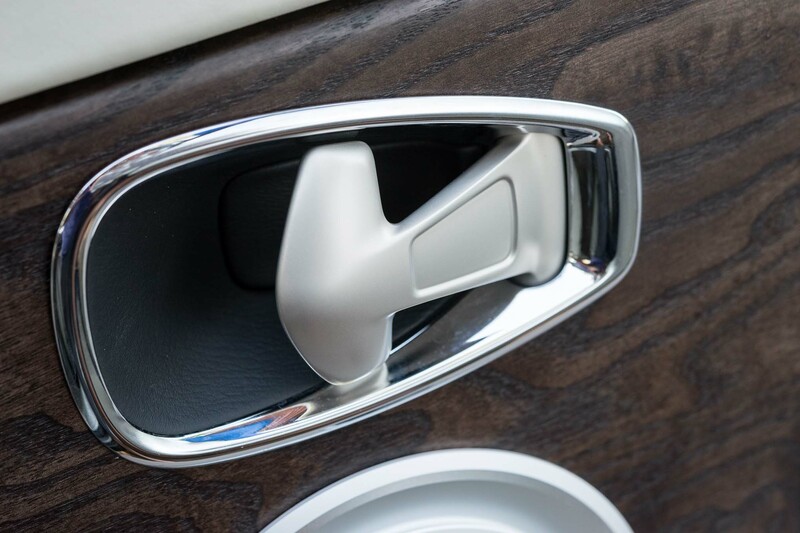 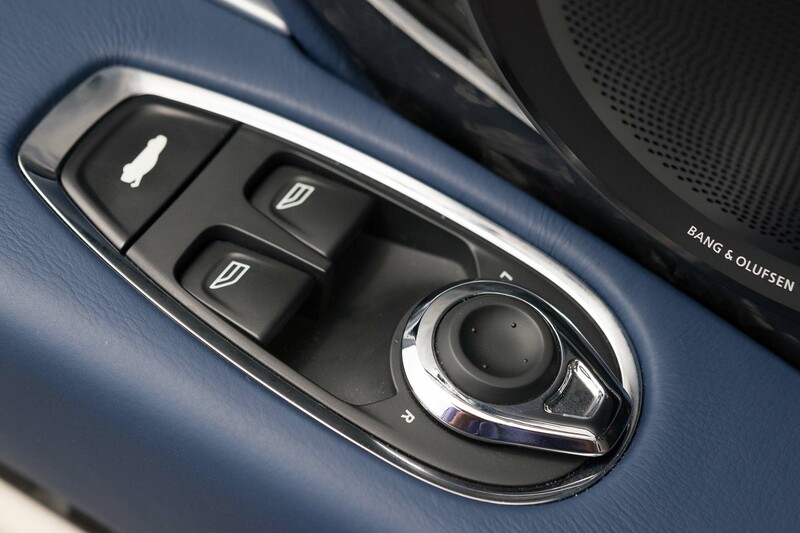 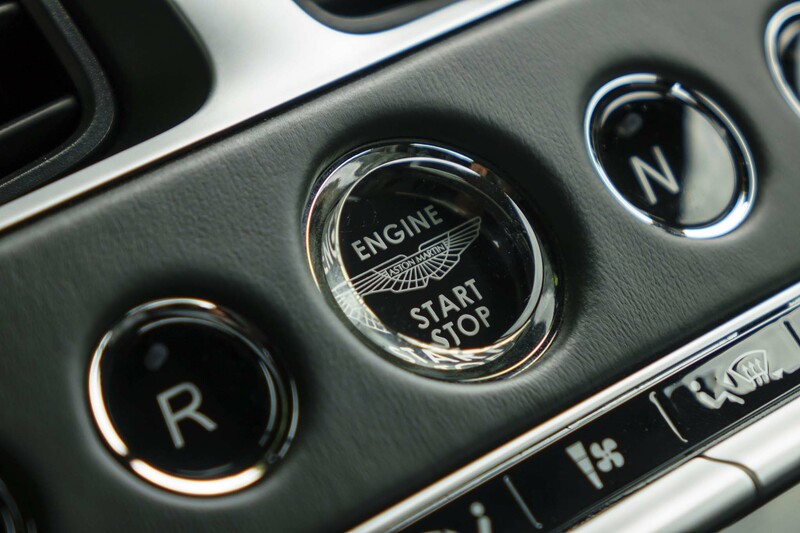 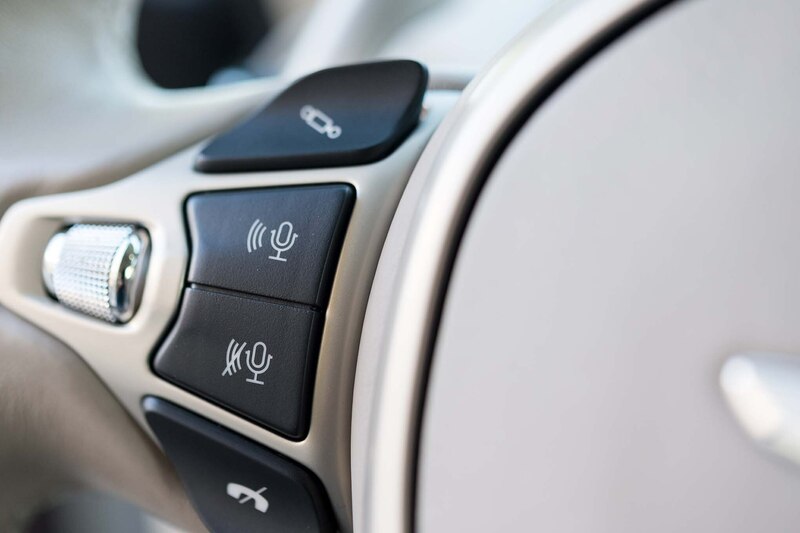 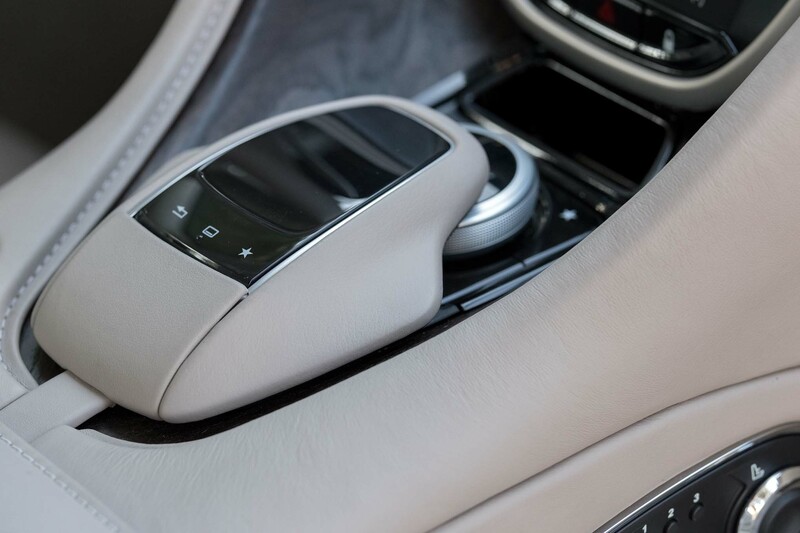 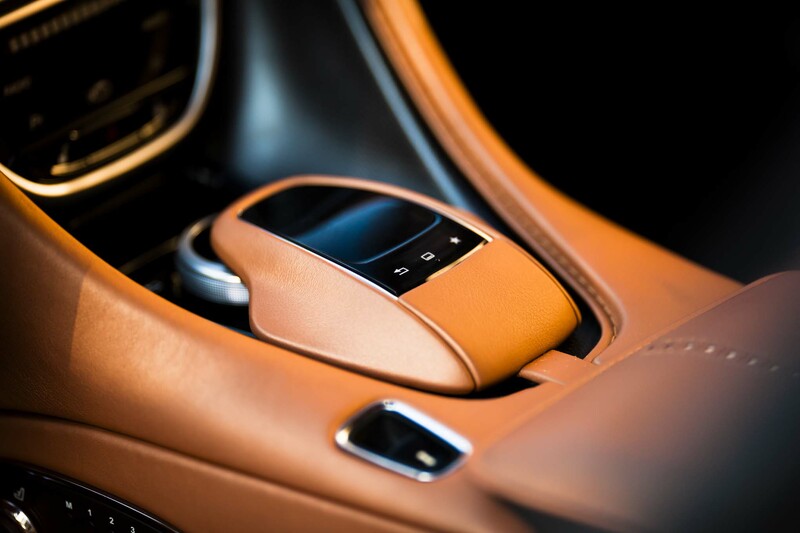 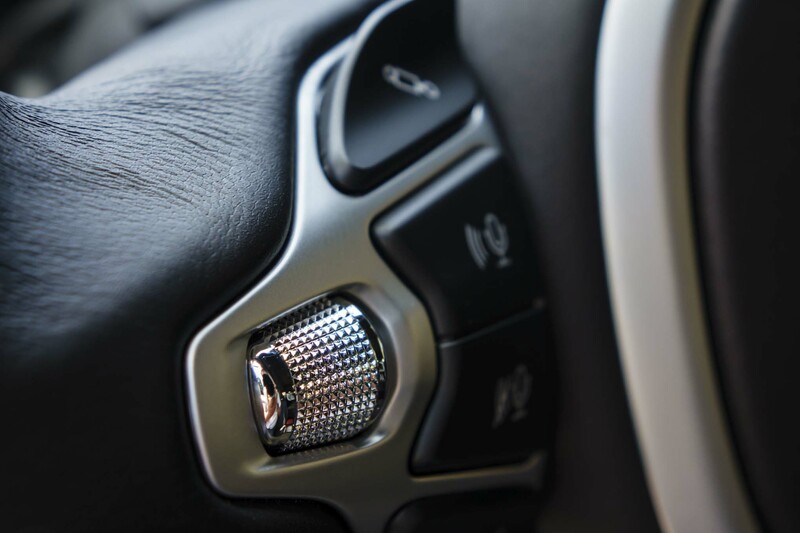 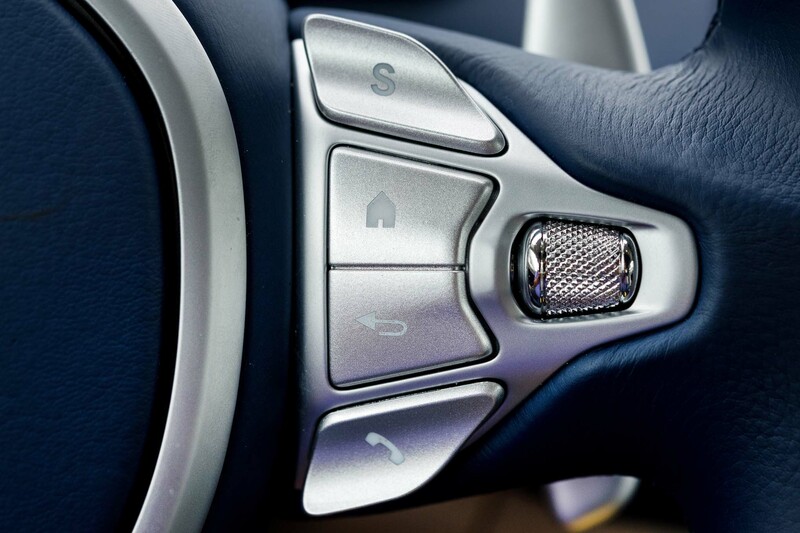 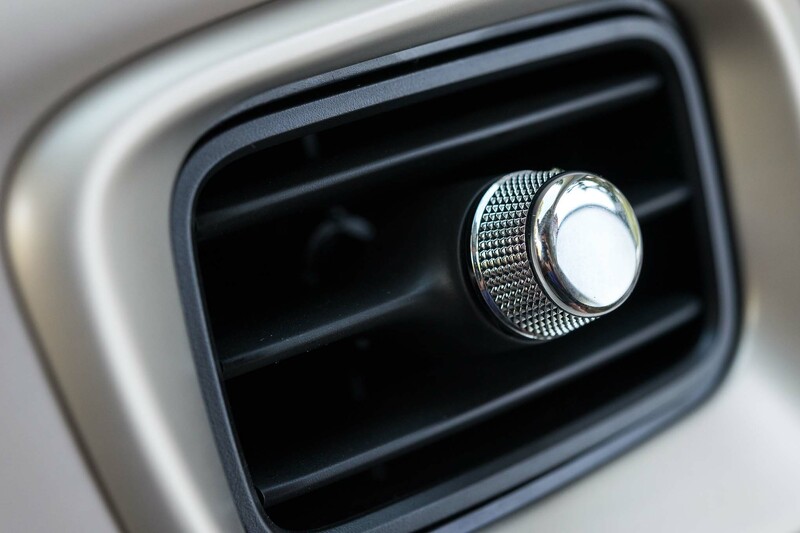 No longer is it necessary to insert the hefty key fob into a dashboard slot to fire up the twin-scroll, twin-turbo V-12 via the start button. 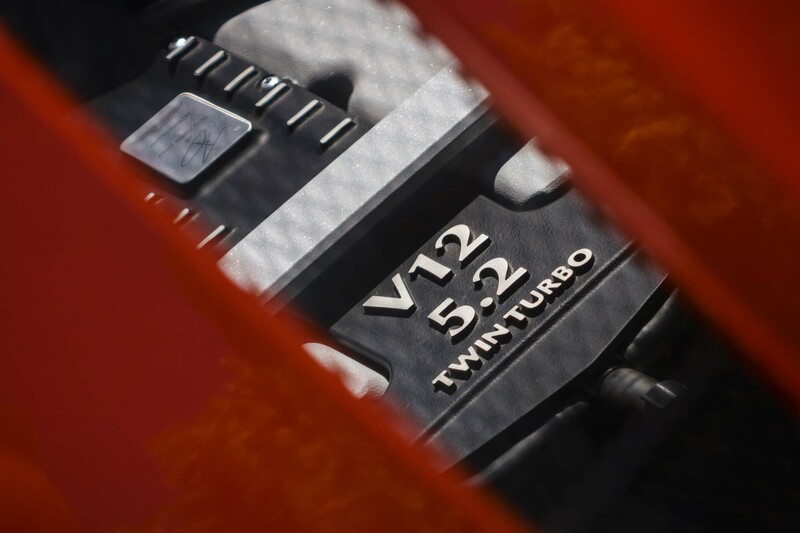 The all-new, in-house-developed engine — it shares only a few valvetrain parts with its predecessor — displaces 5.2 liters compared to the previous V-12’s 5.9, but sweats out 600 hp at 6,500 rpm, an 80-hp improvement. 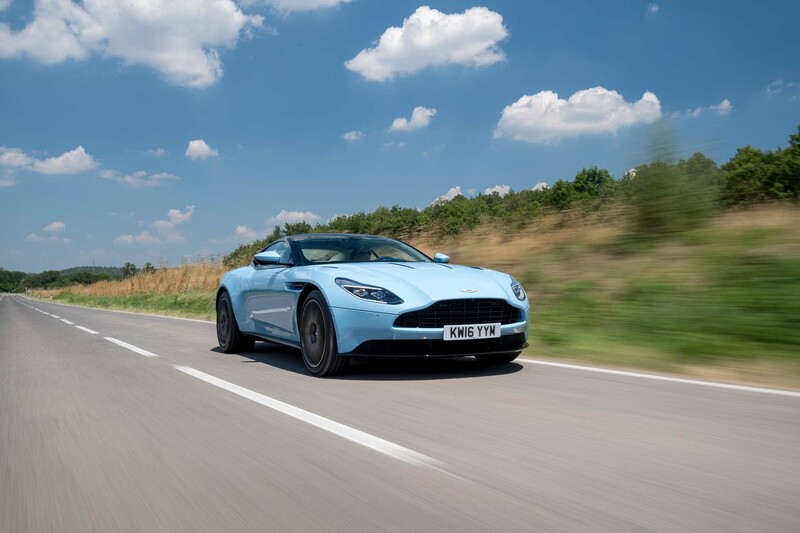 More relevant is the torque output and its curve, 516 lb-ft between 1,500 and 5,500 rpm compared to the previous 457 that came on in more peaky fashion. 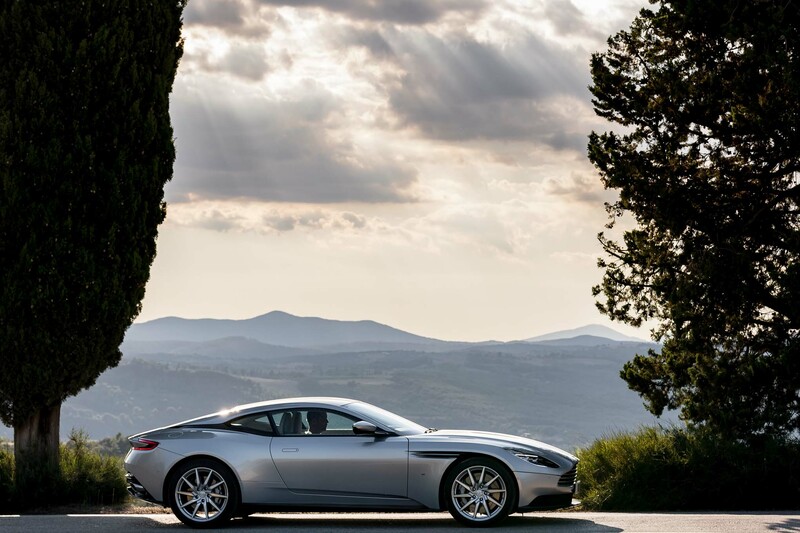 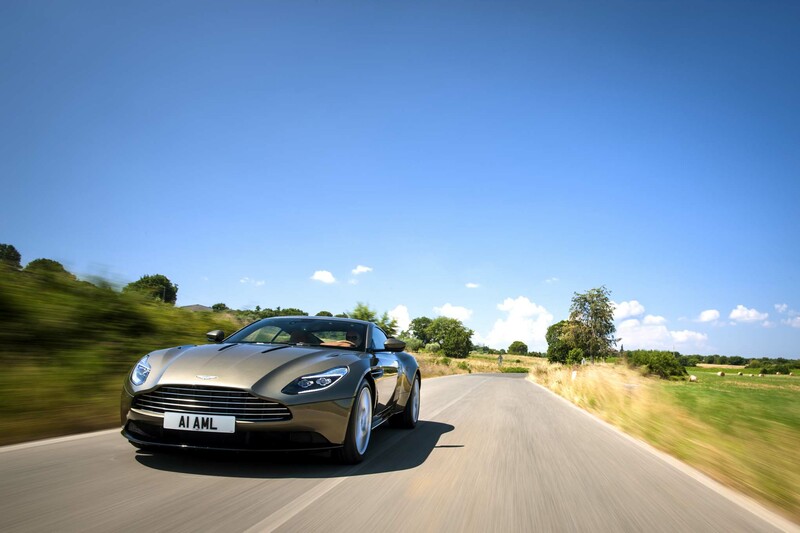 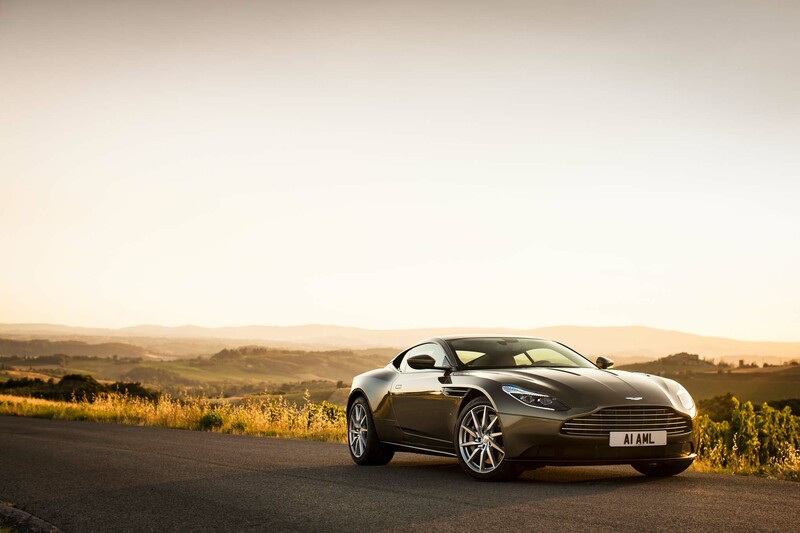 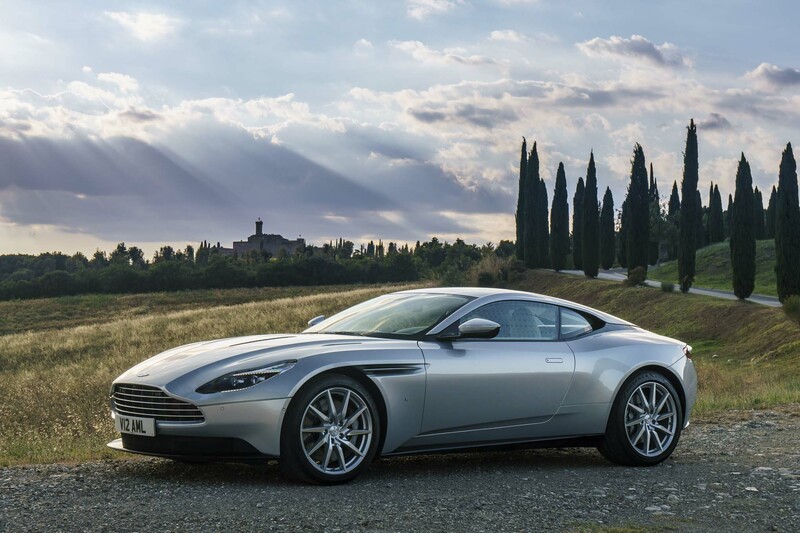 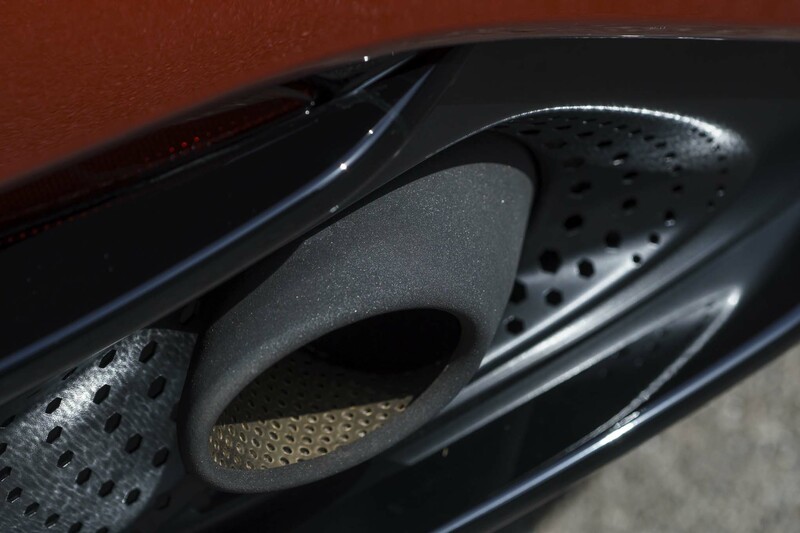 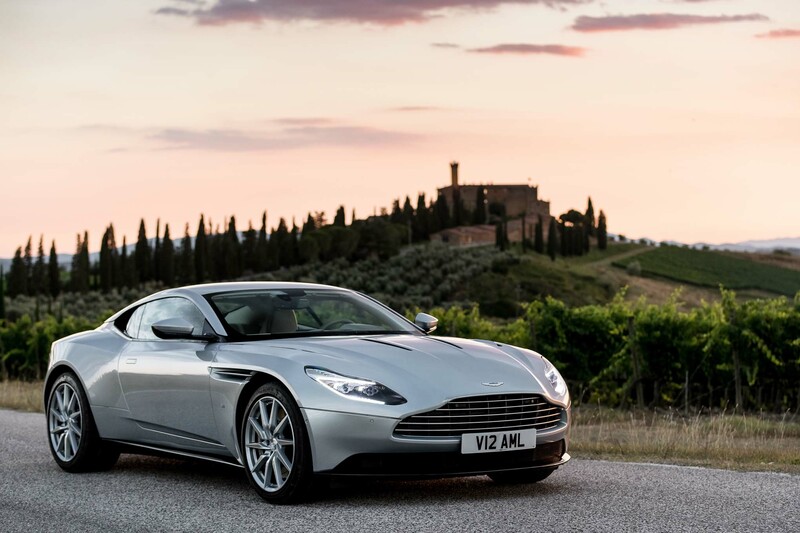 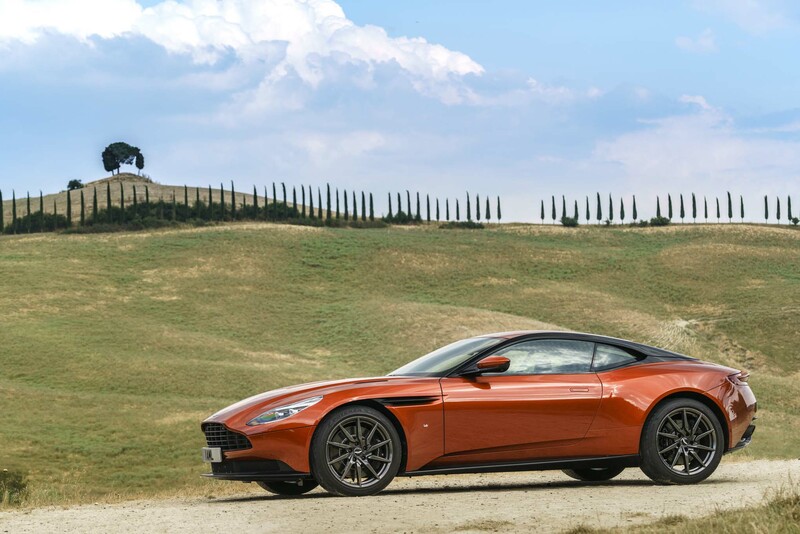 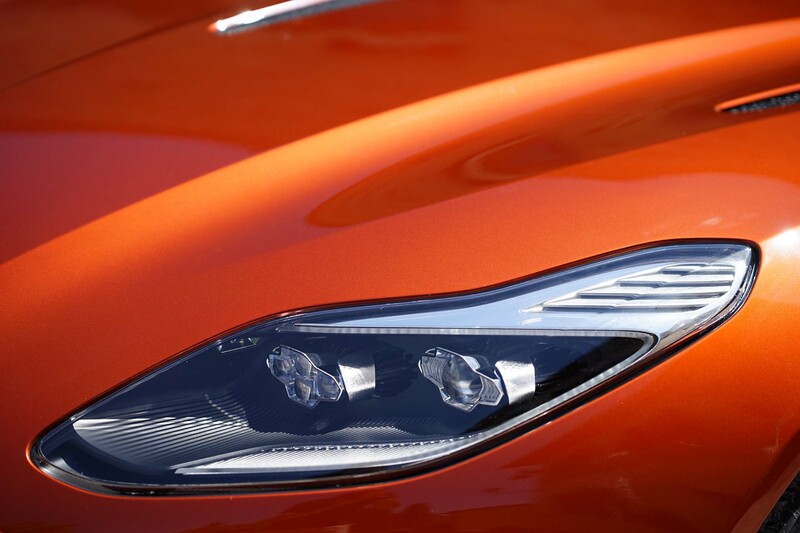 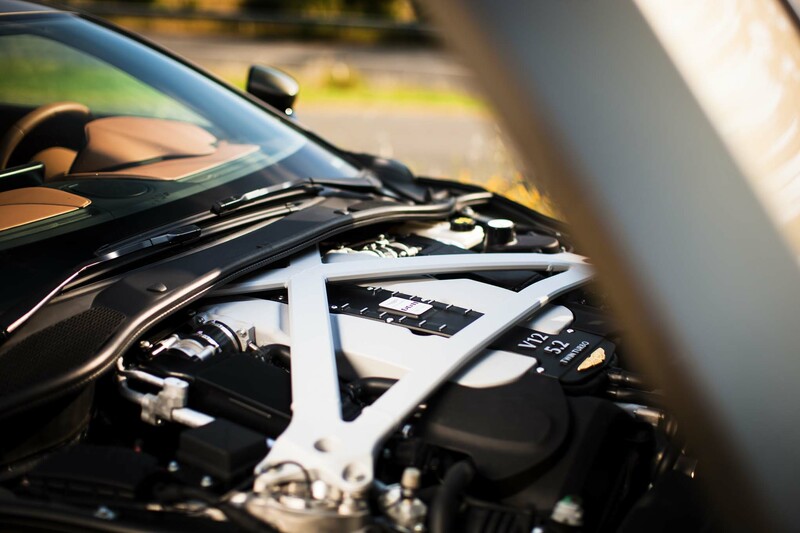 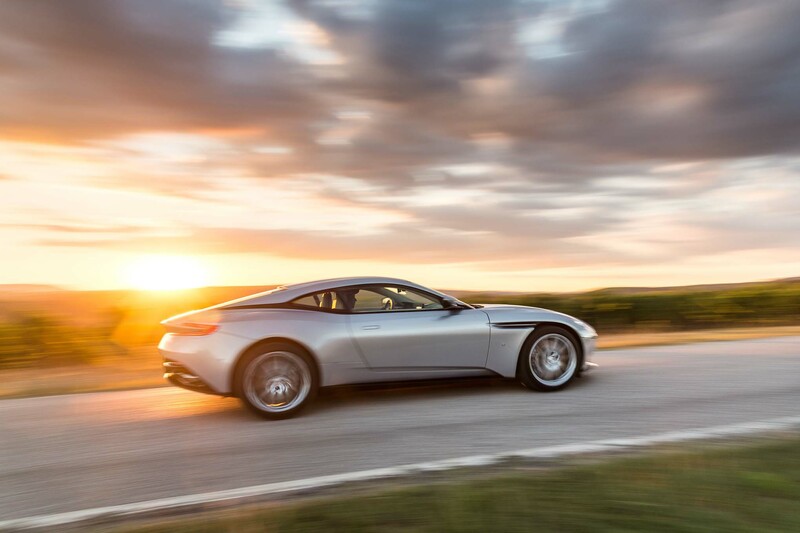 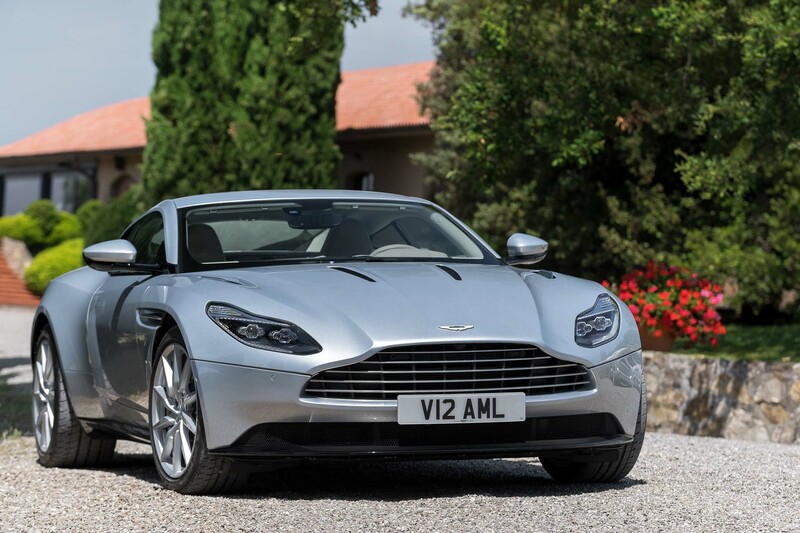 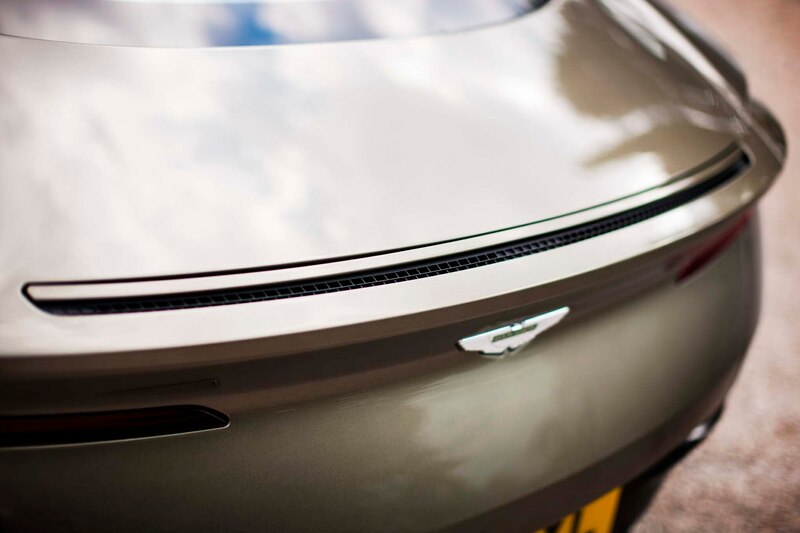 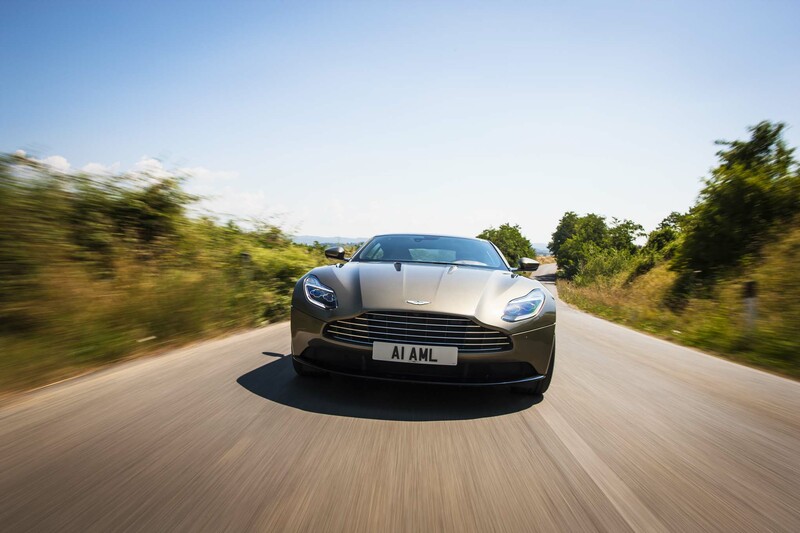 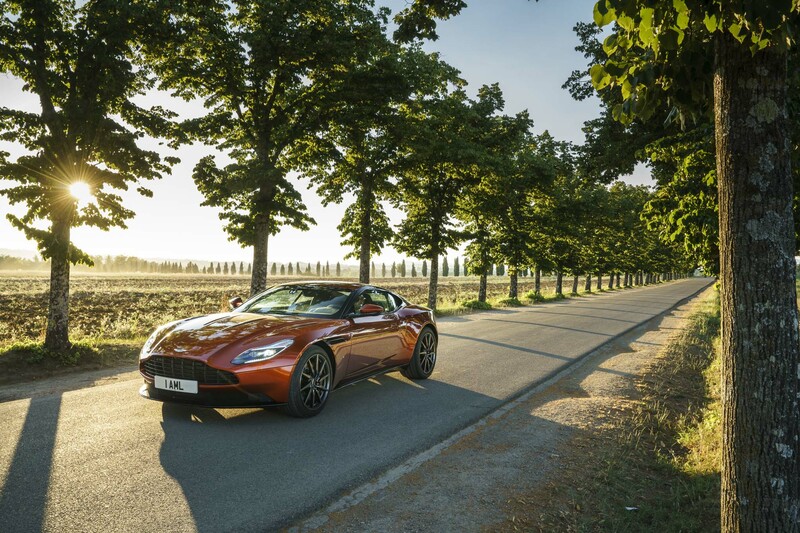 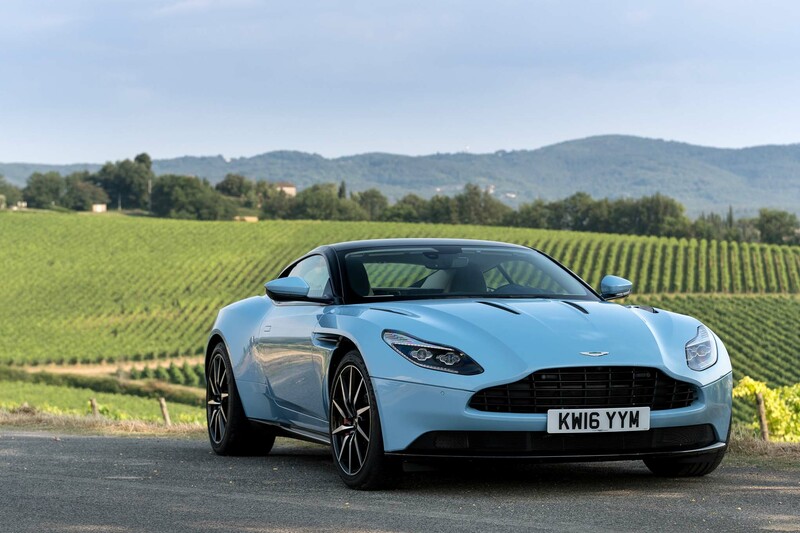 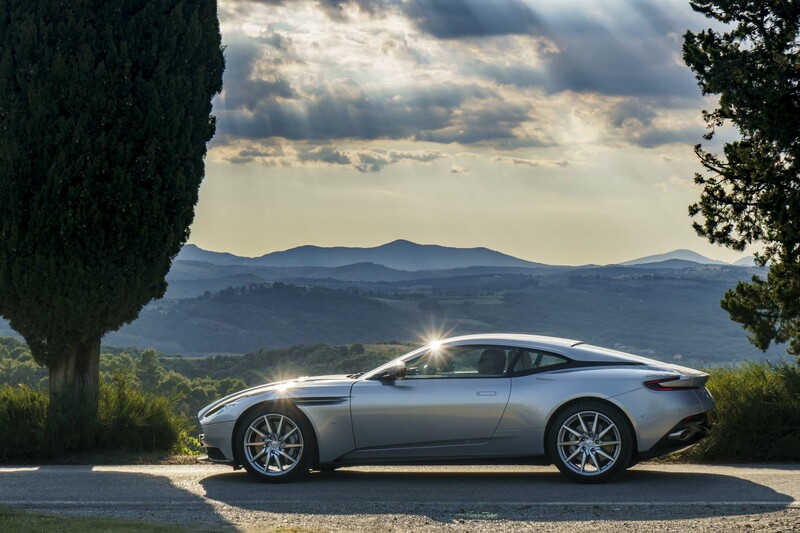 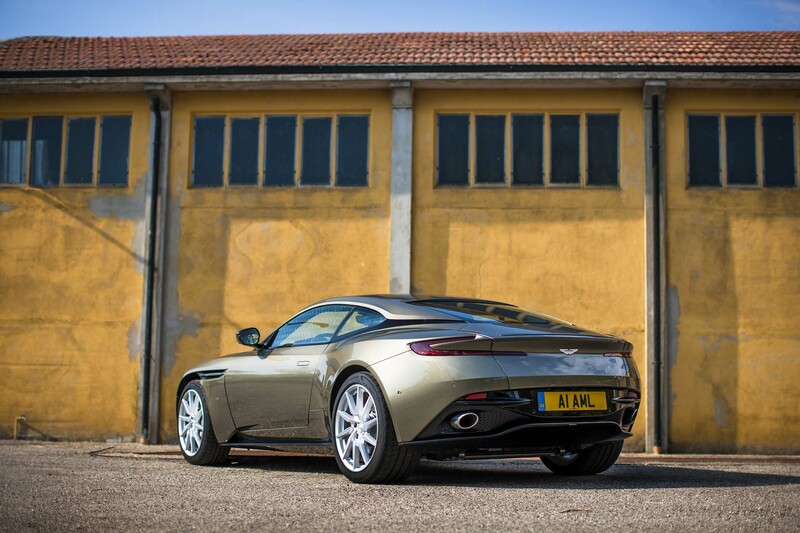 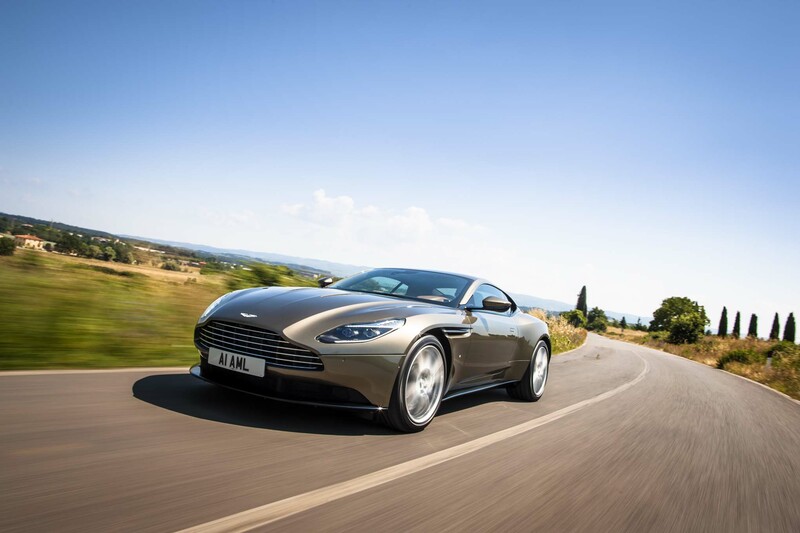 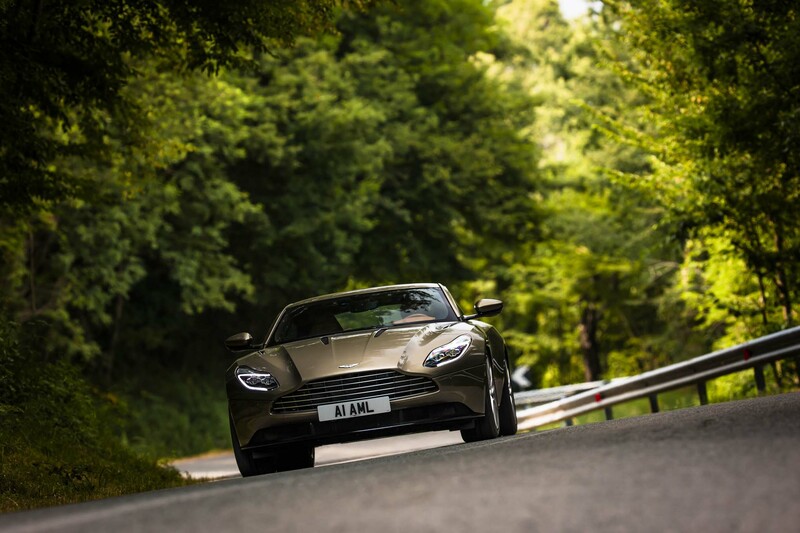 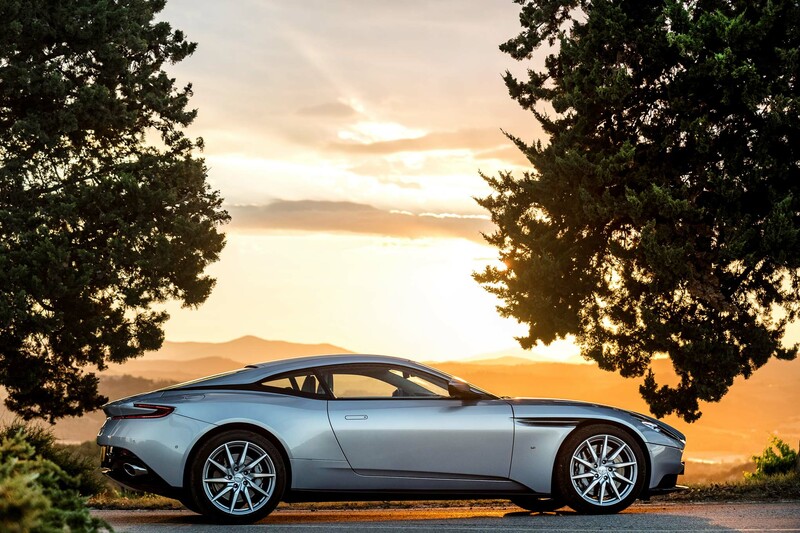 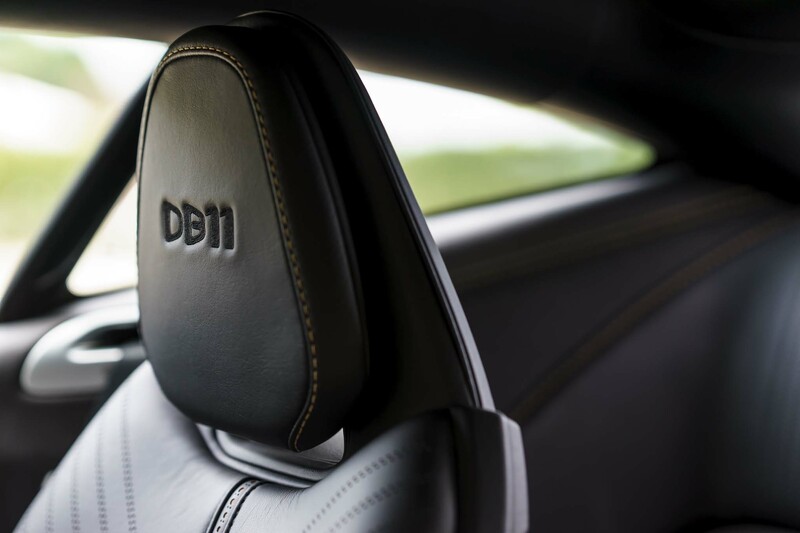 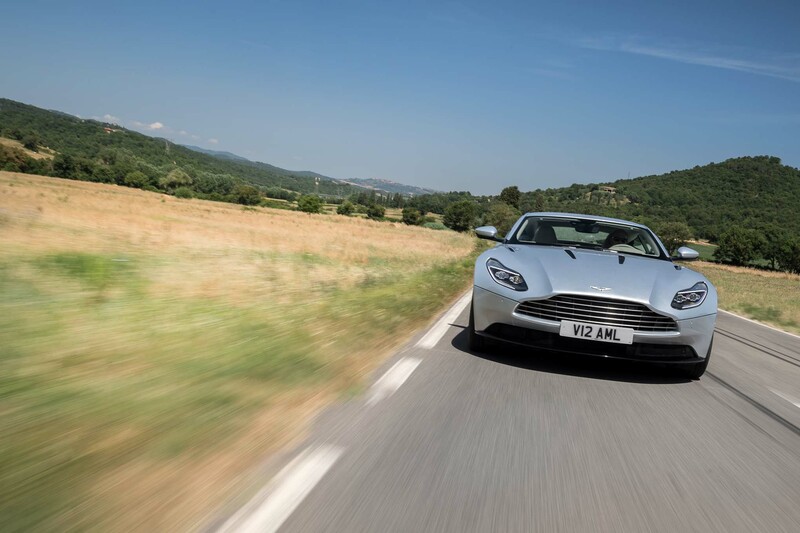 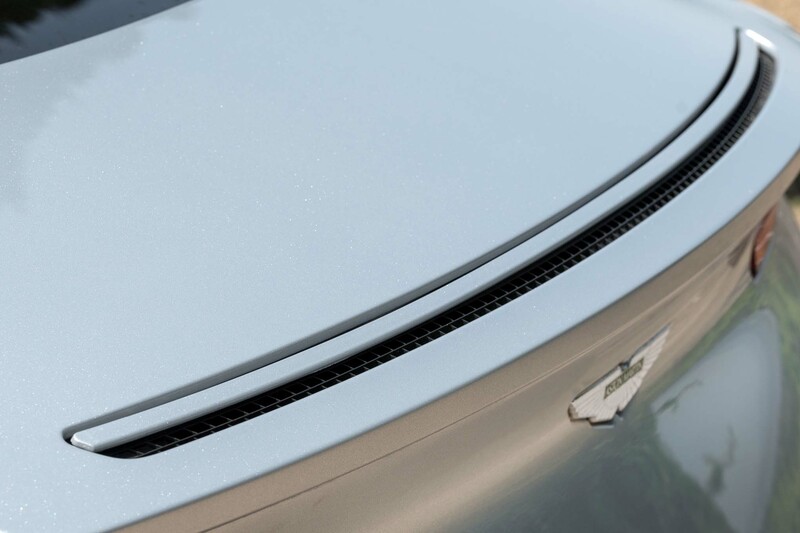 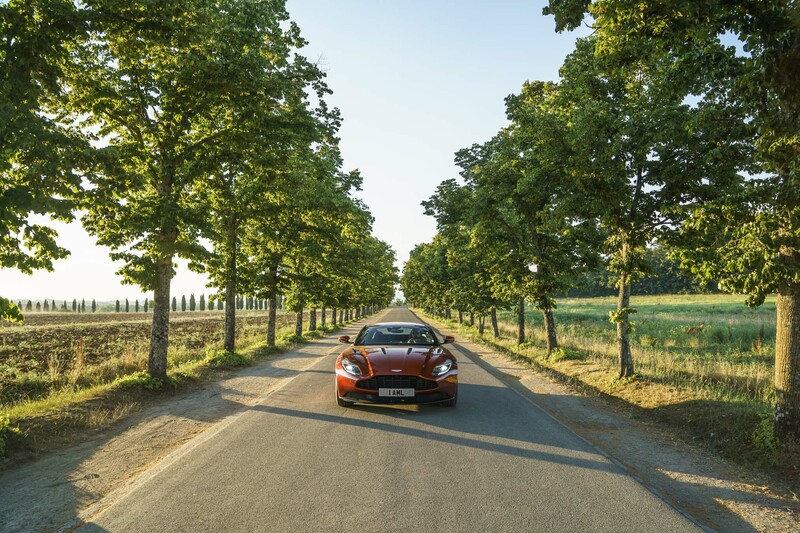 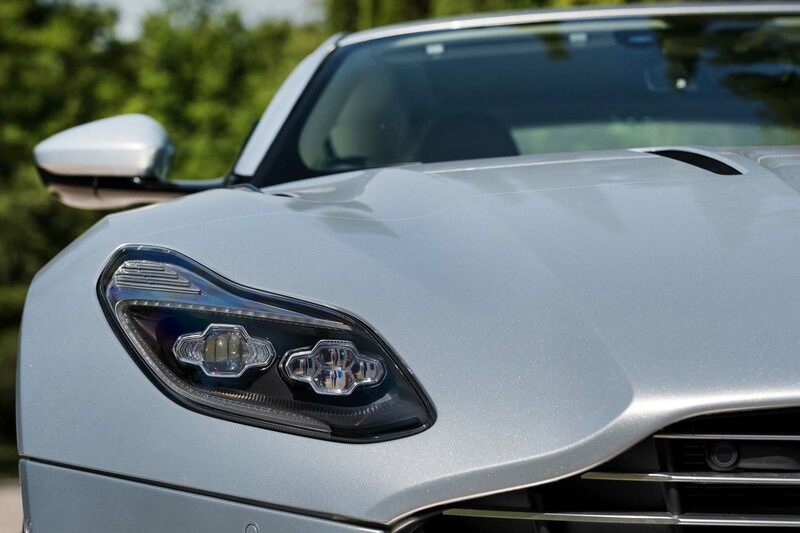 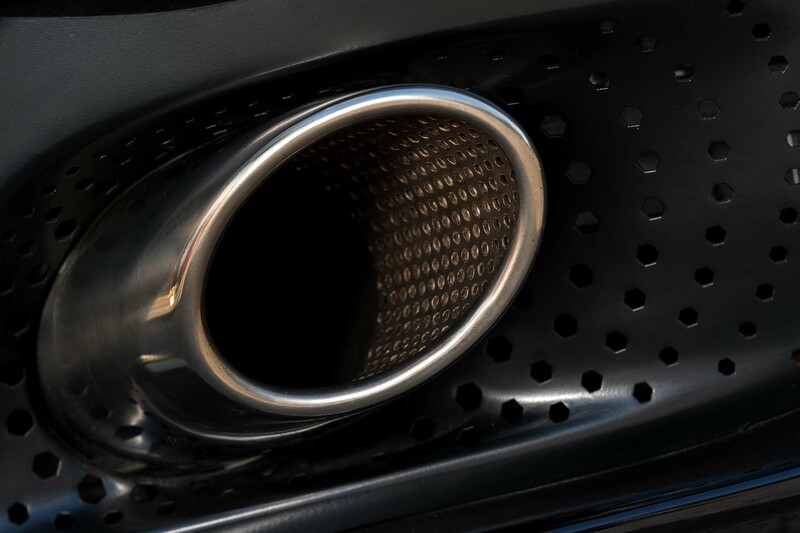 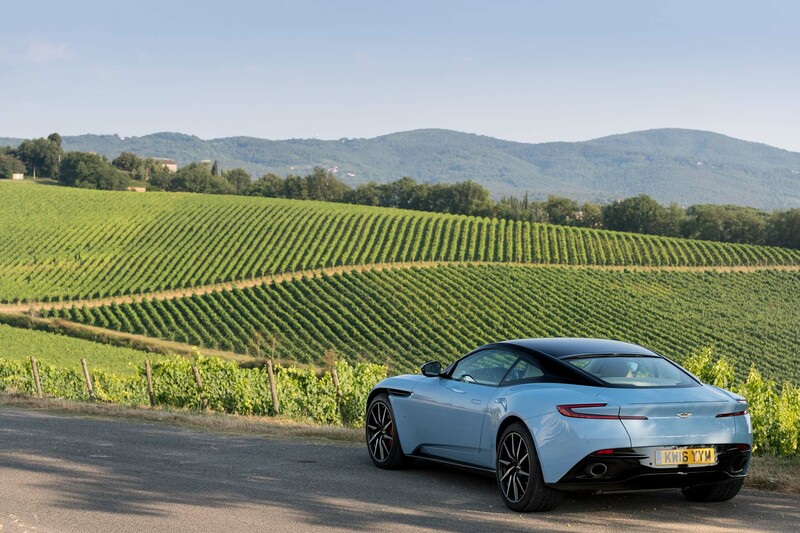 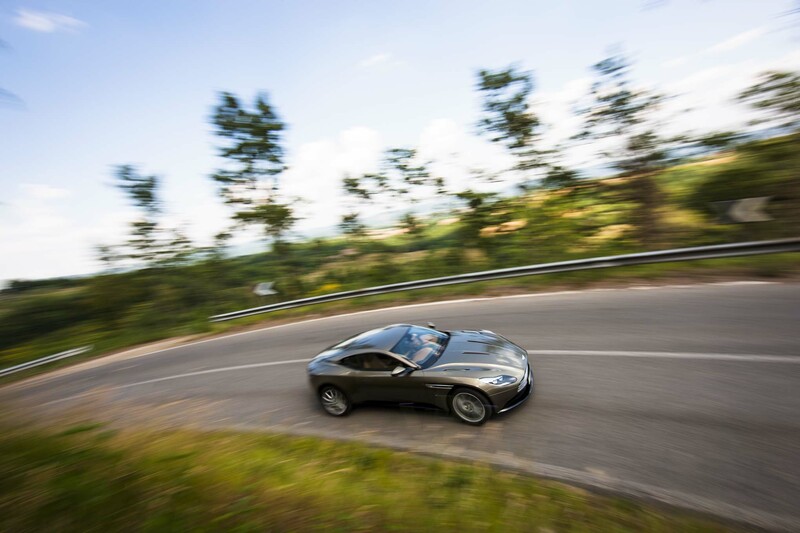 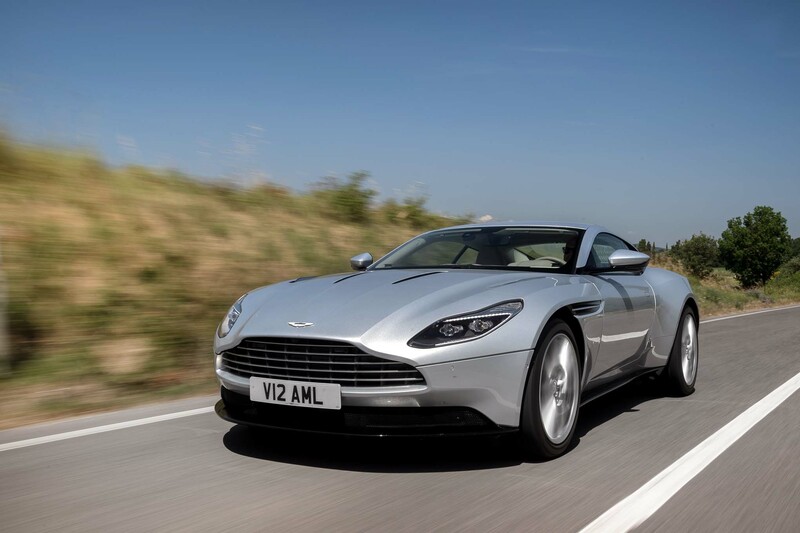 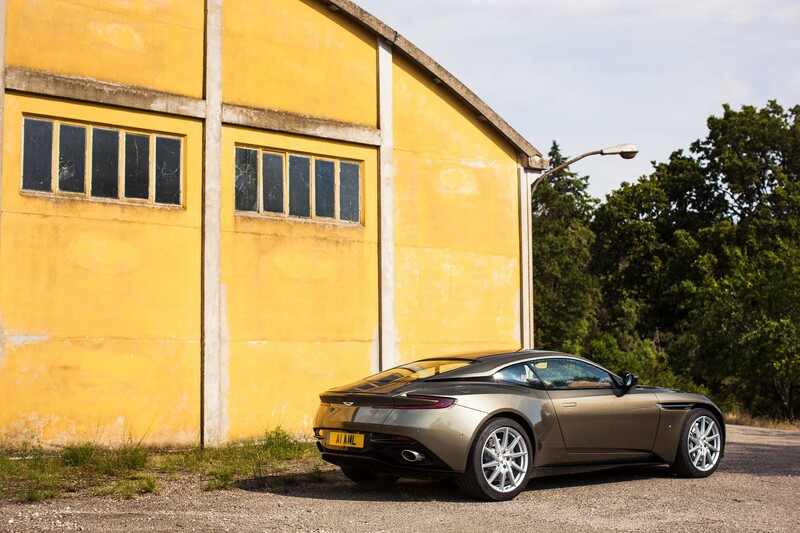 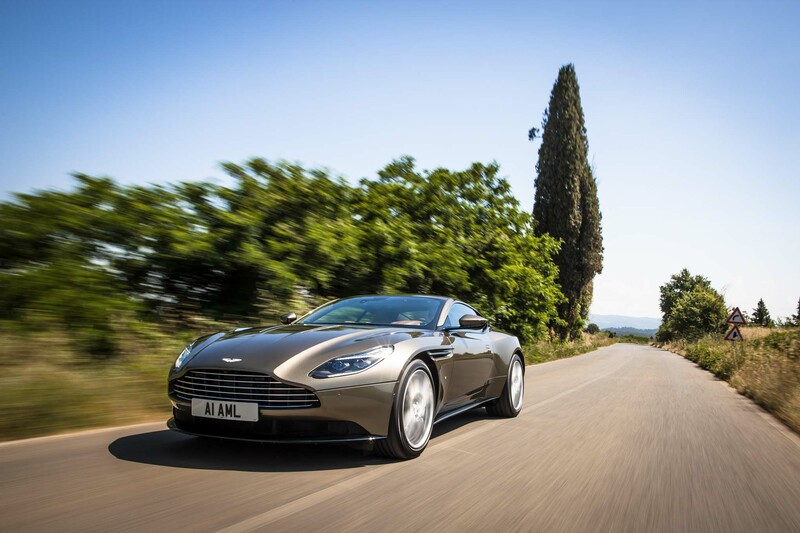 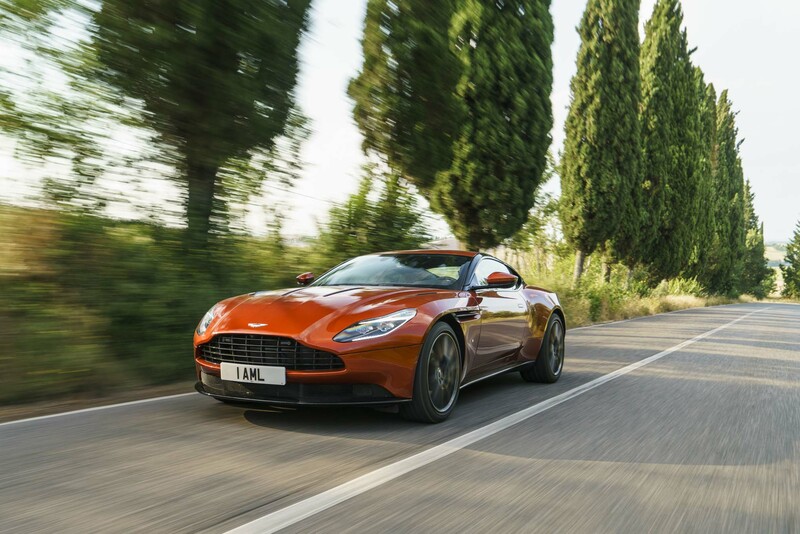 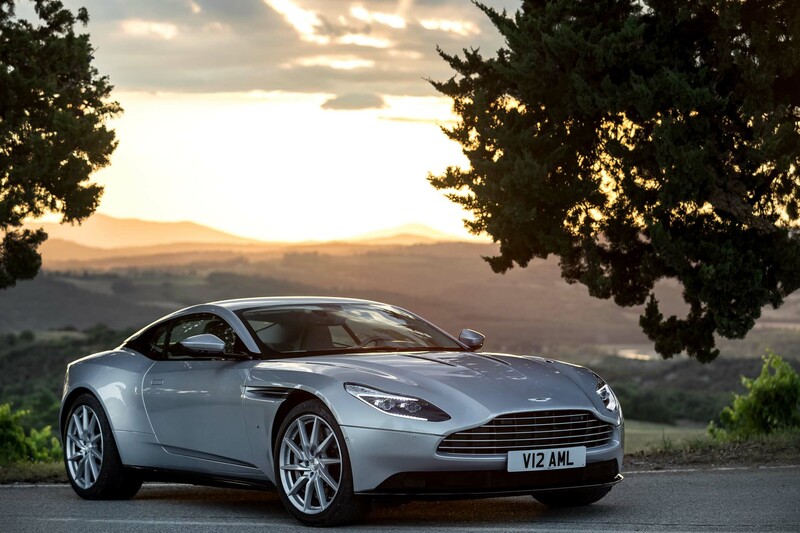 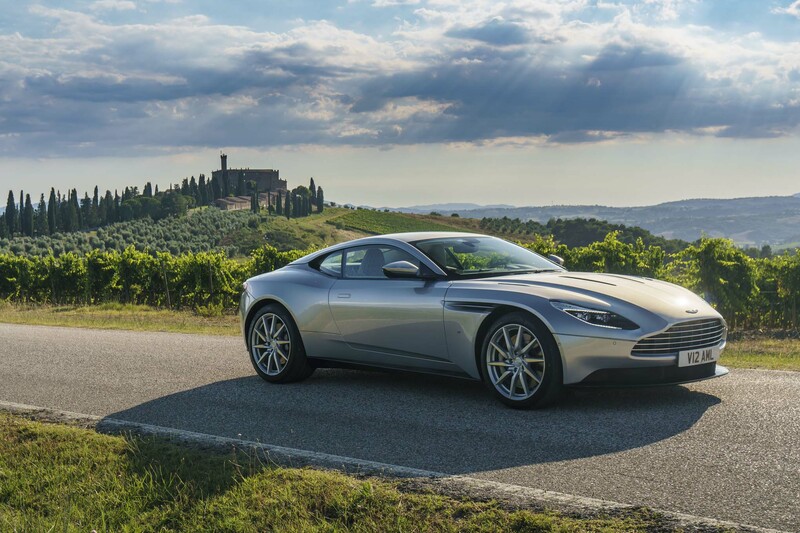 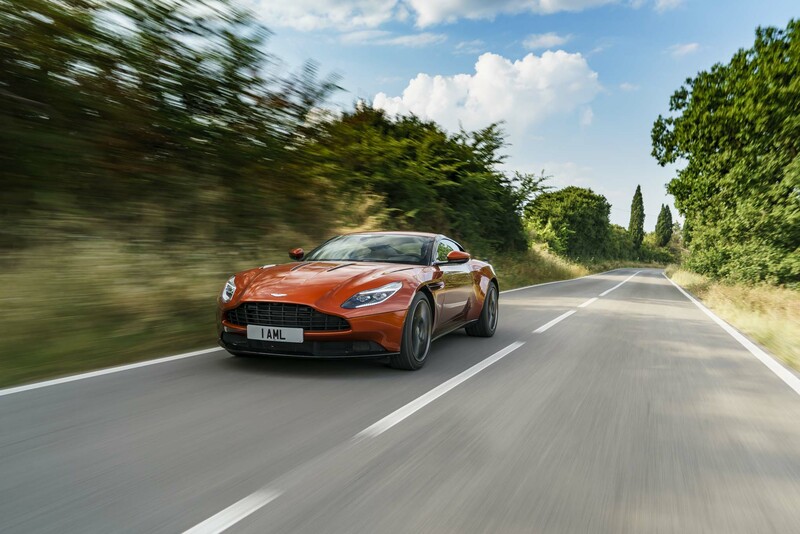 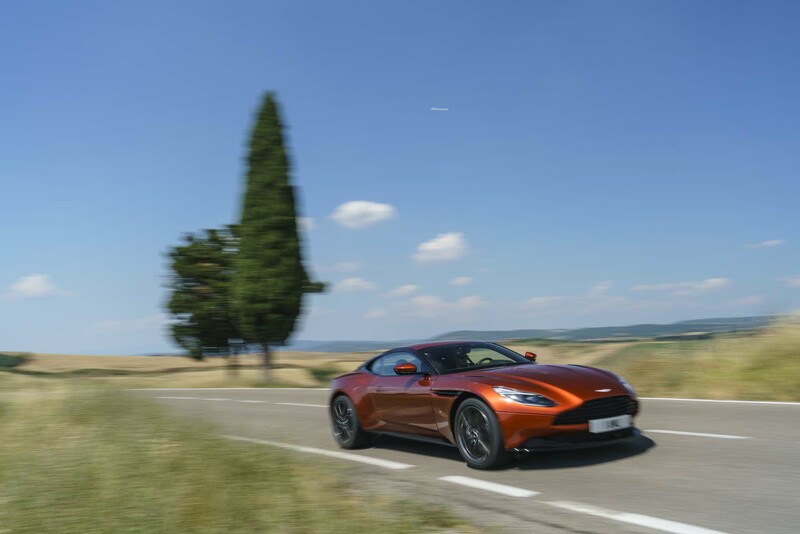 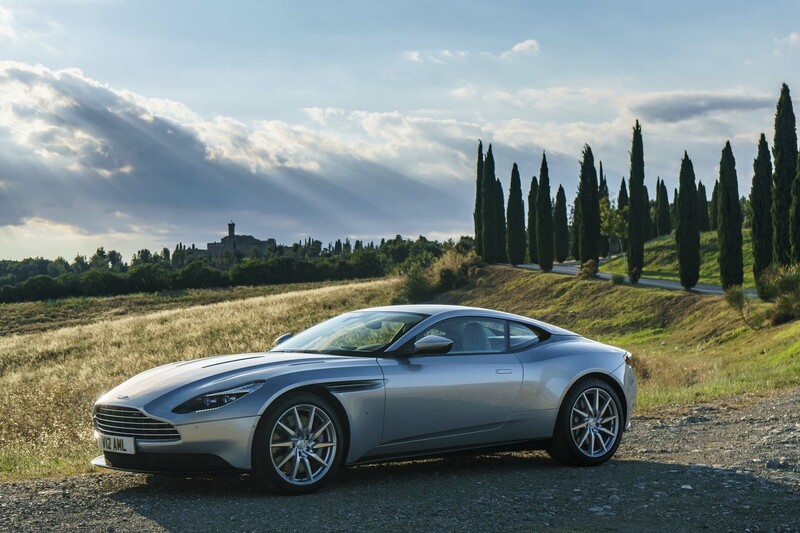 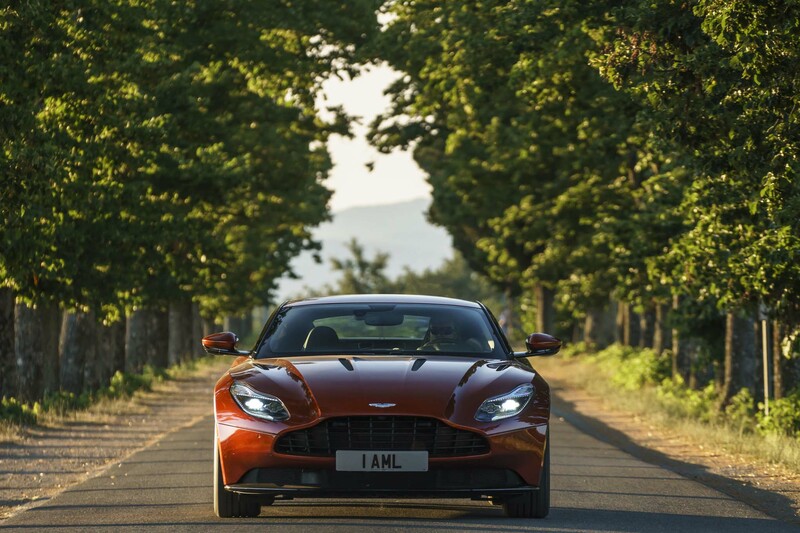 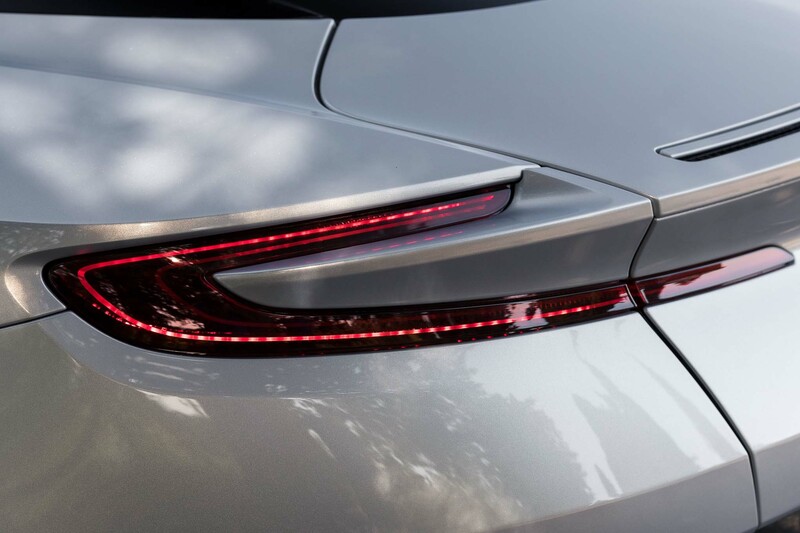 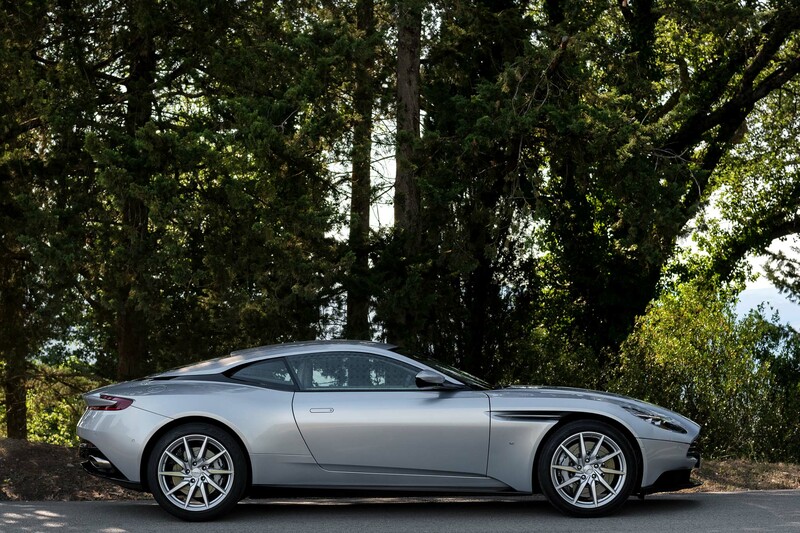 At either partial or wide open throttle, the DB11 responds quickly, its reactions rarely, if ever, raising the cover on the forced induction occurring beneath the long hood. 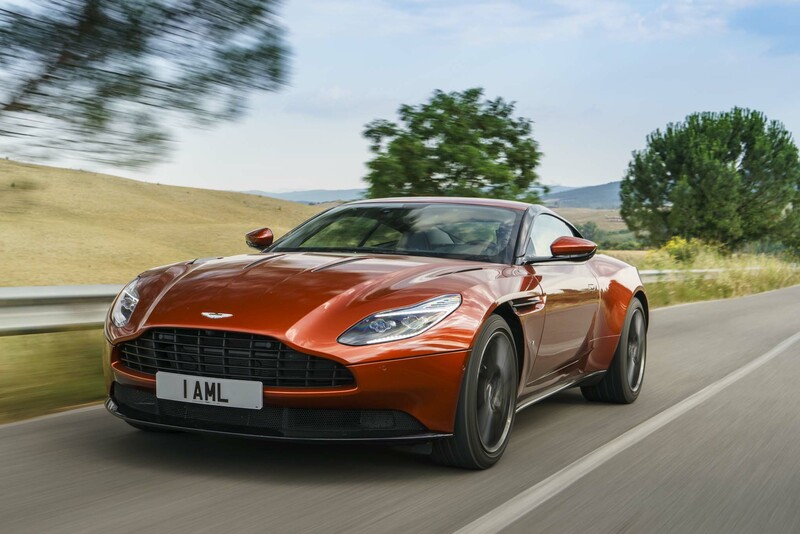 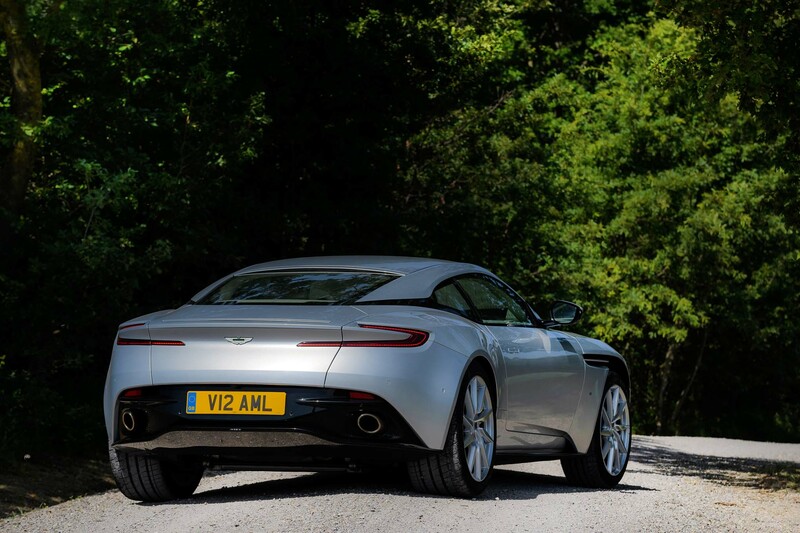 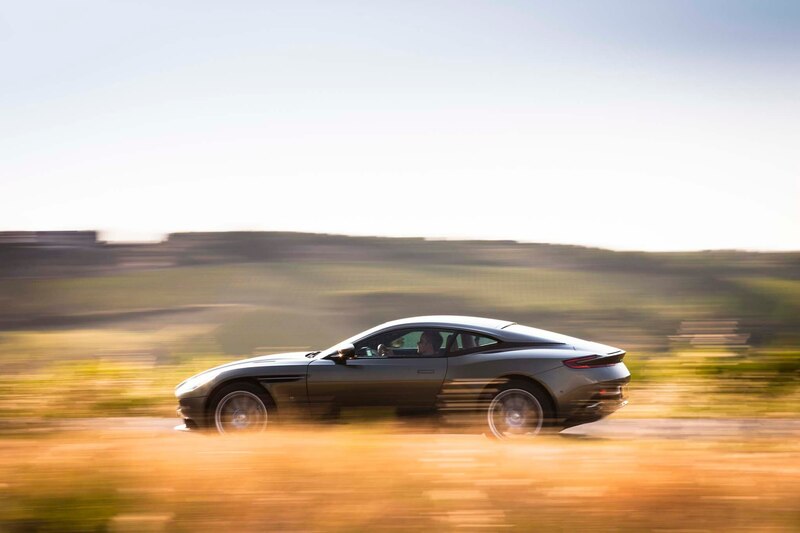 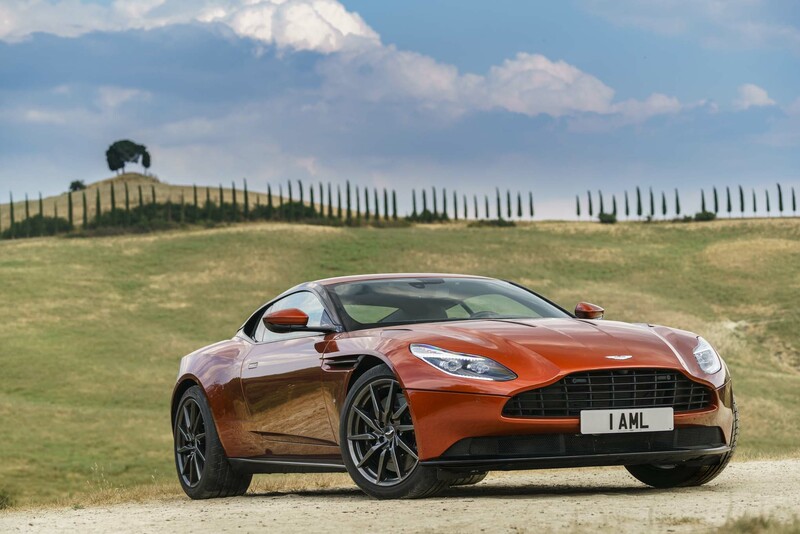 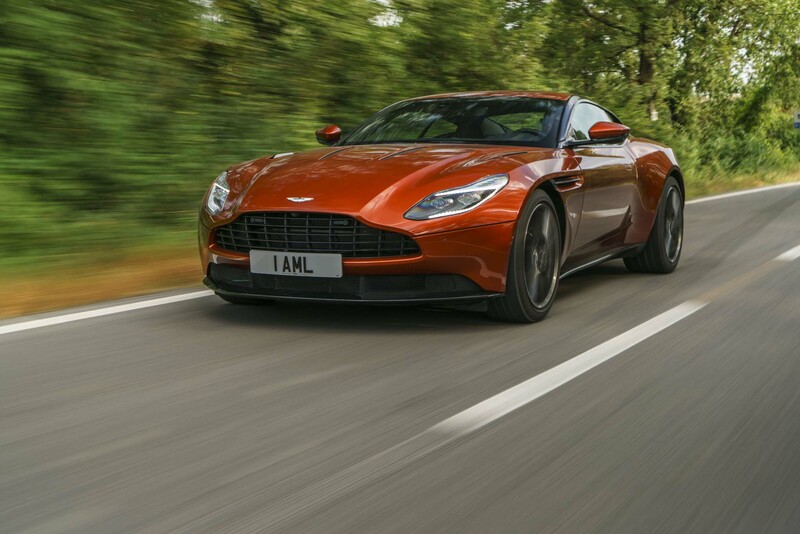 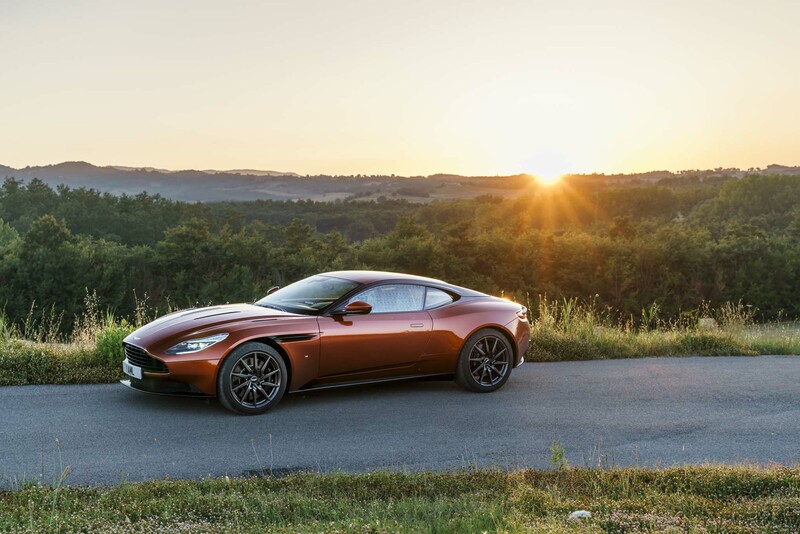 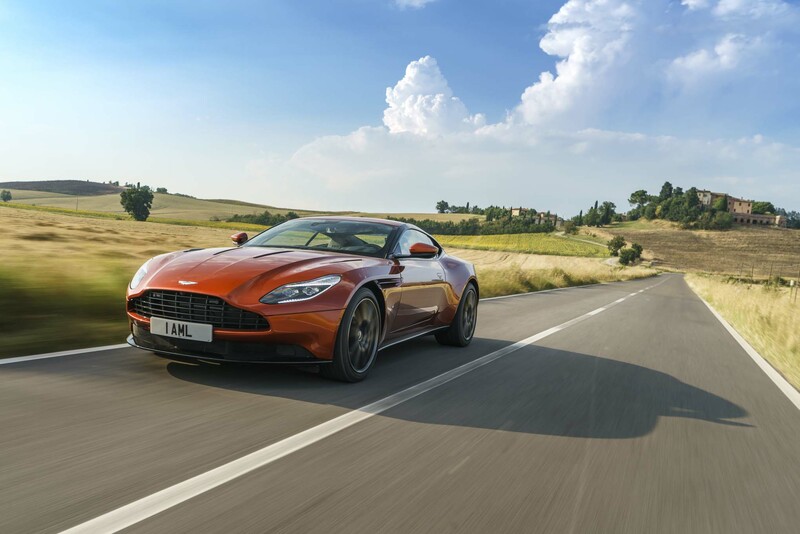 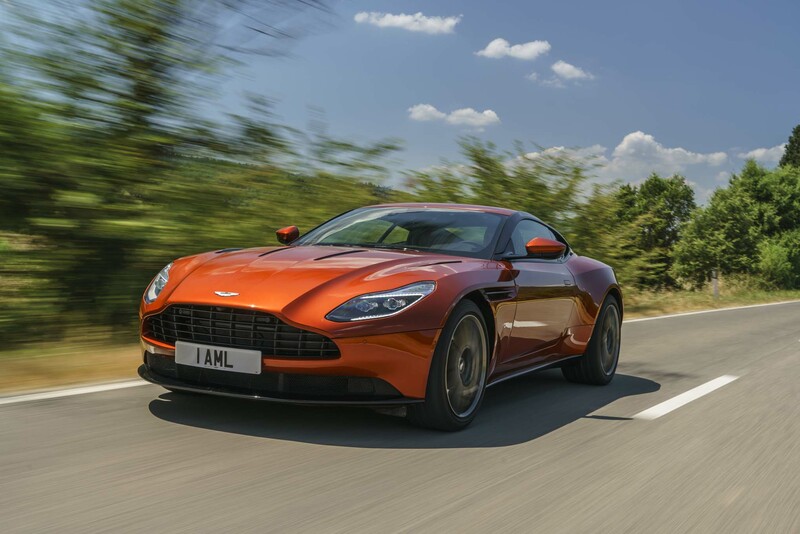 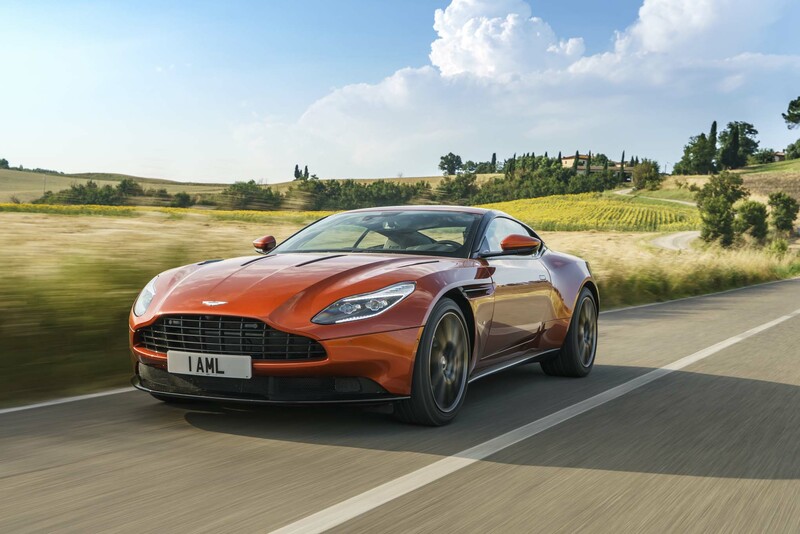 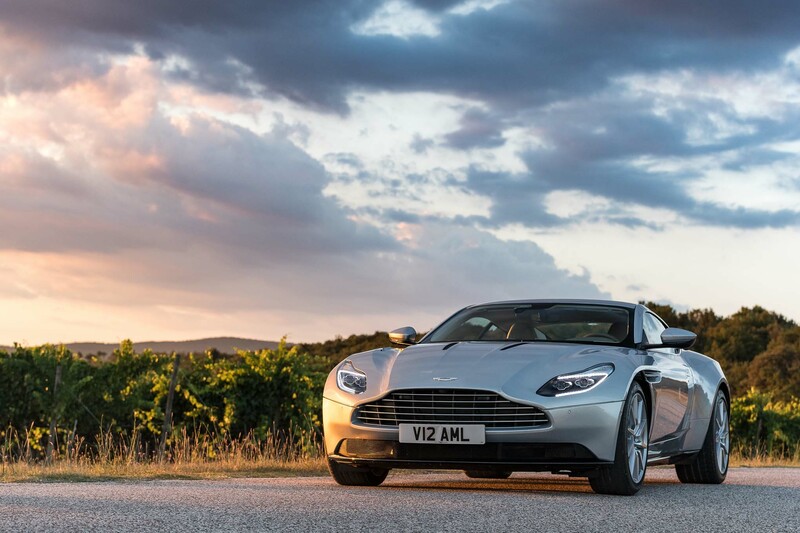 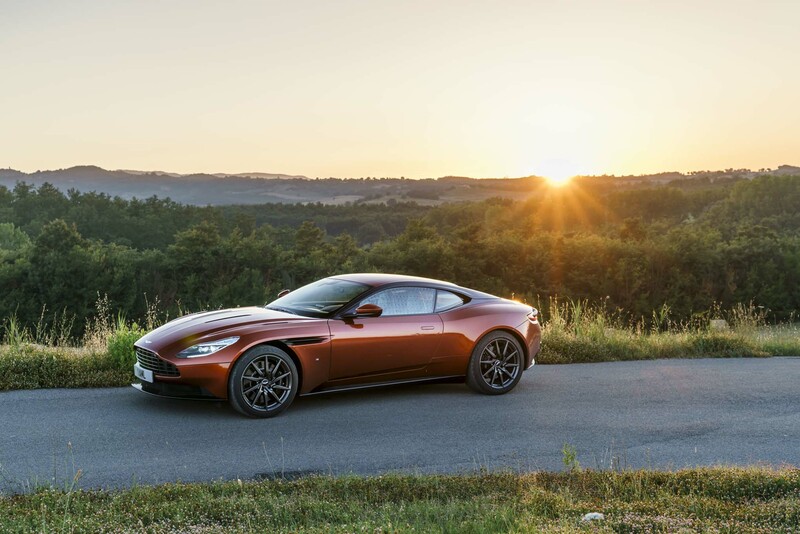 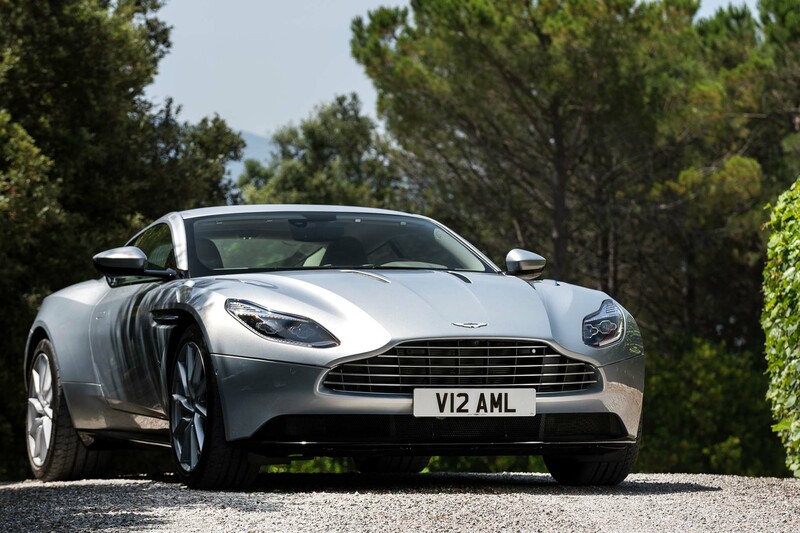 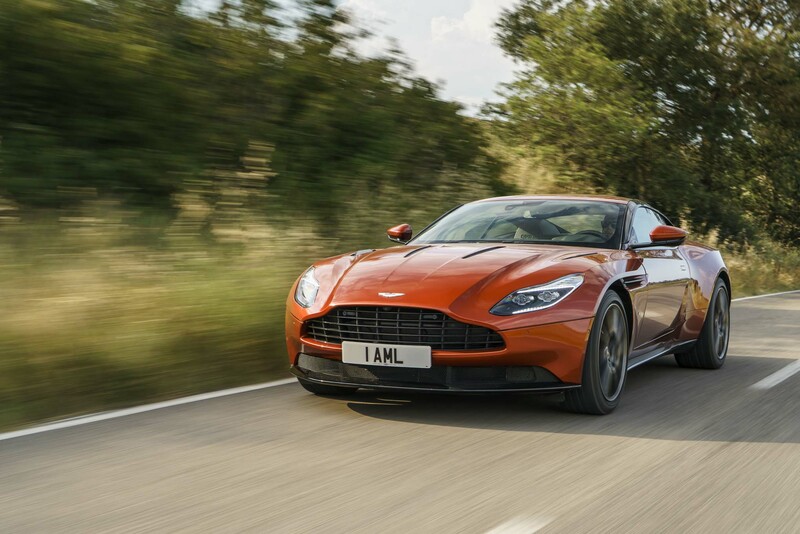 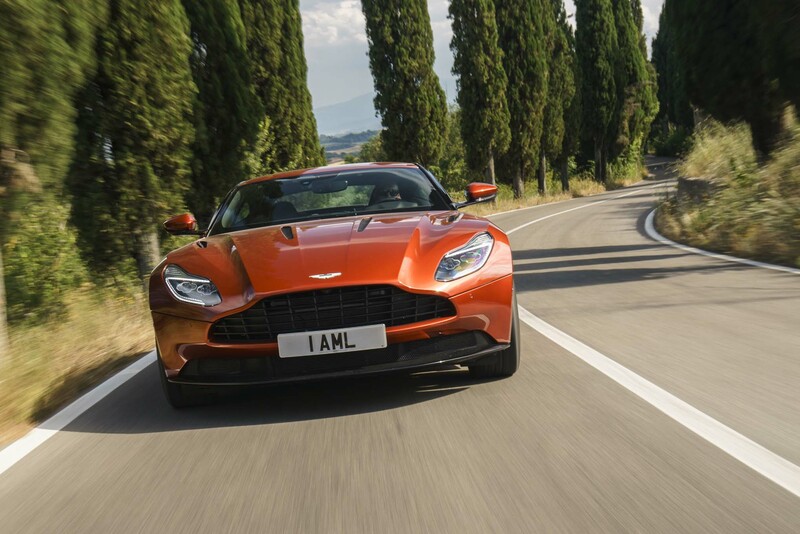 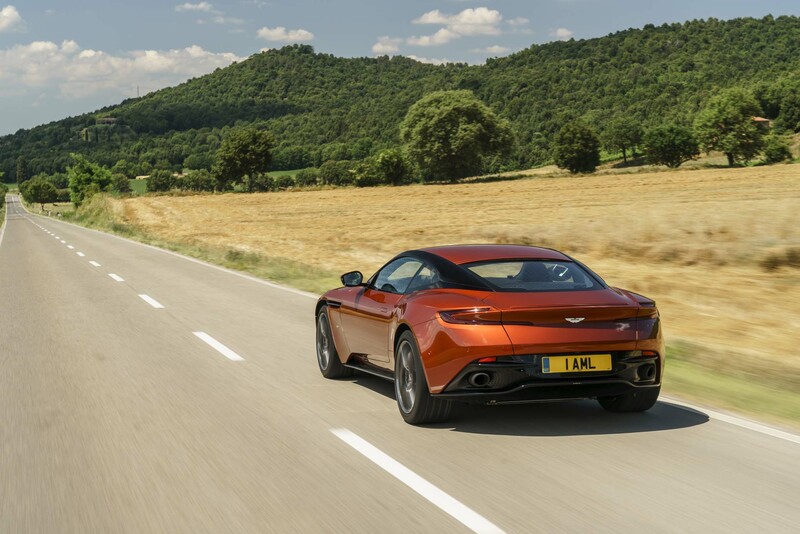 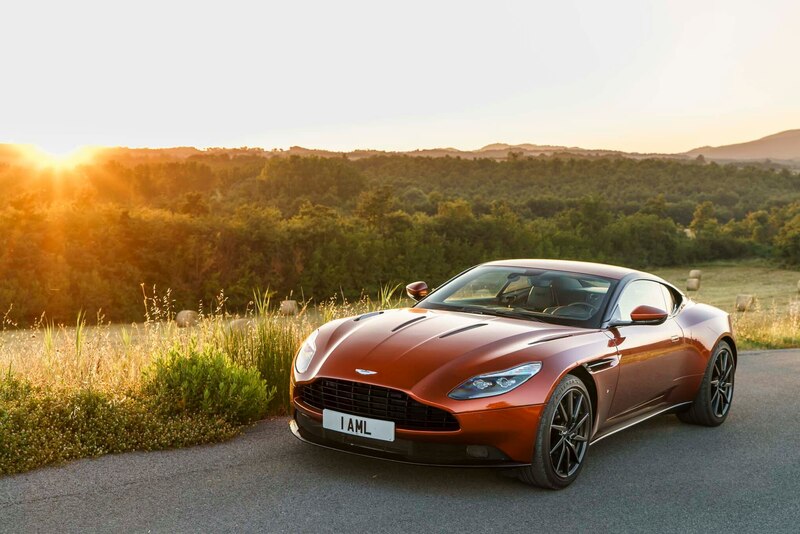 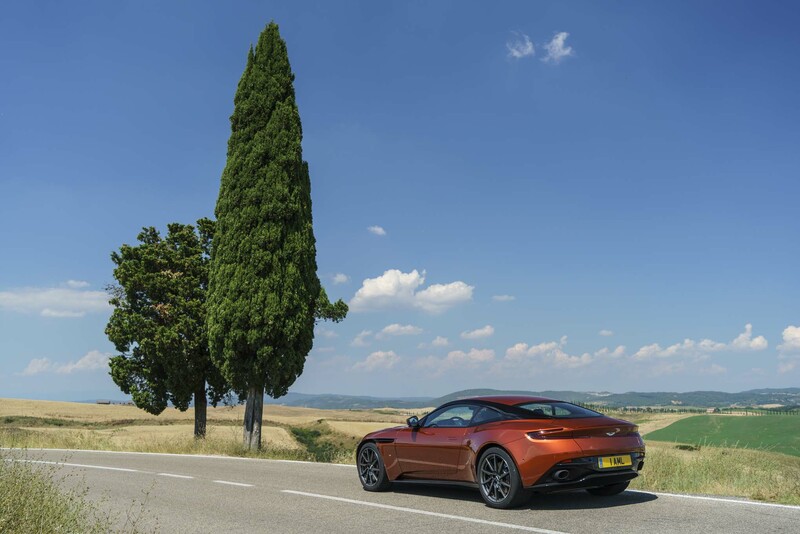 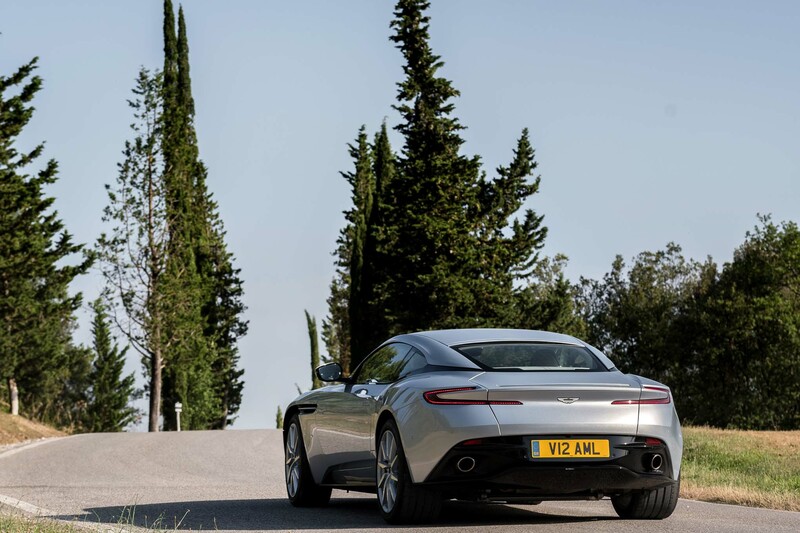 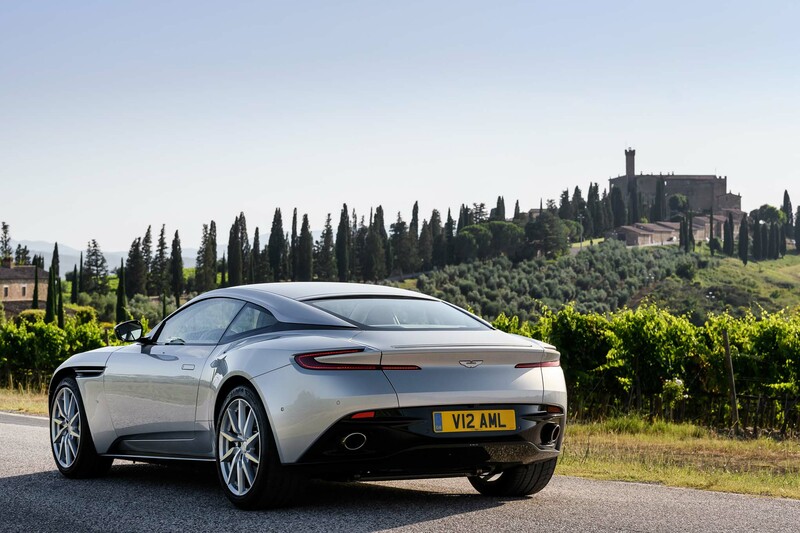 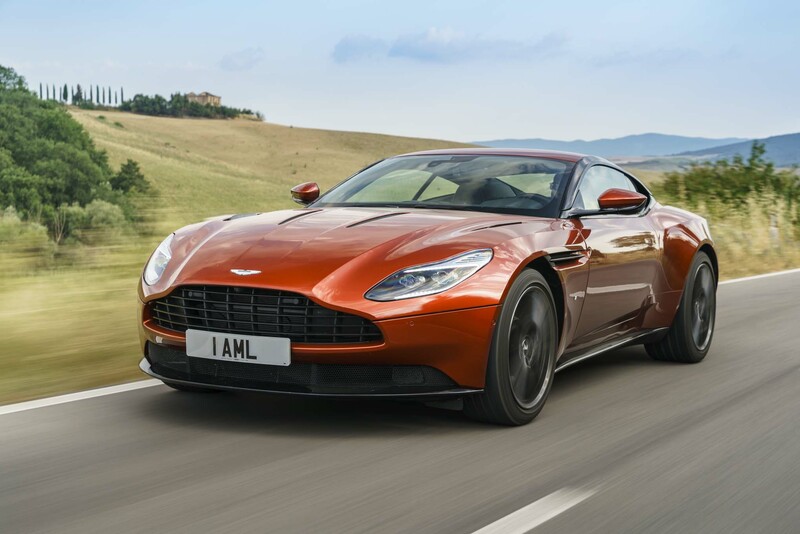 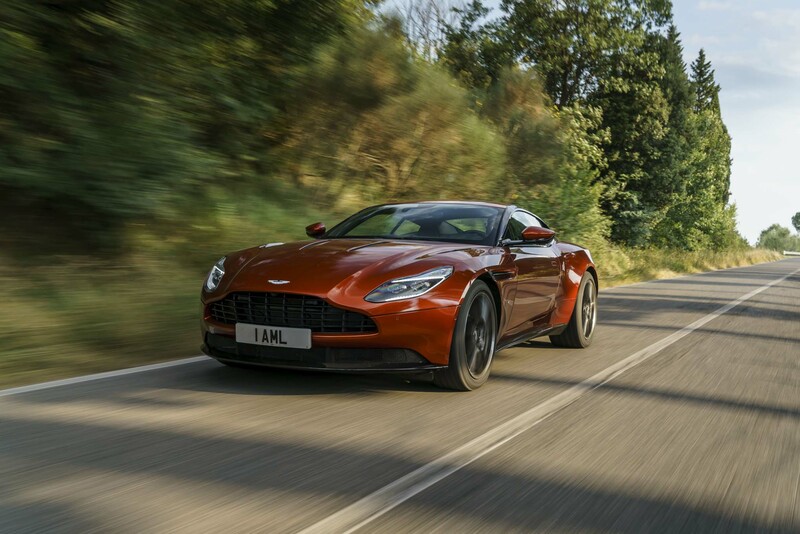 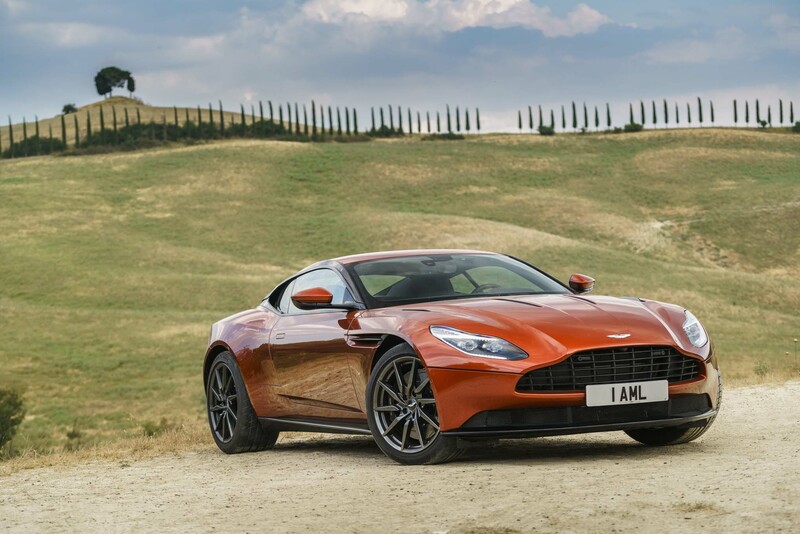 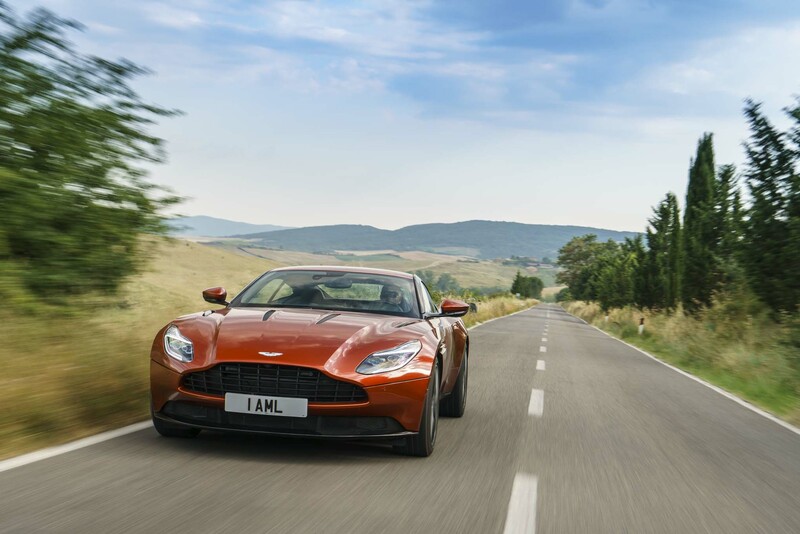 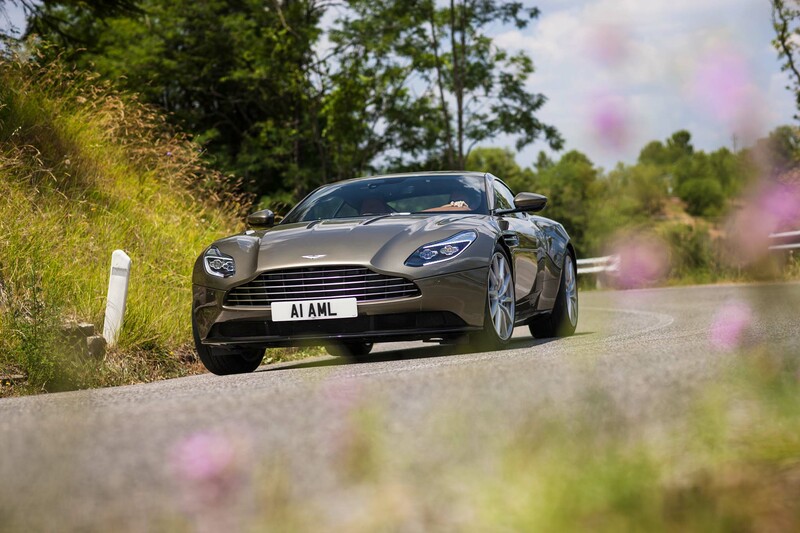 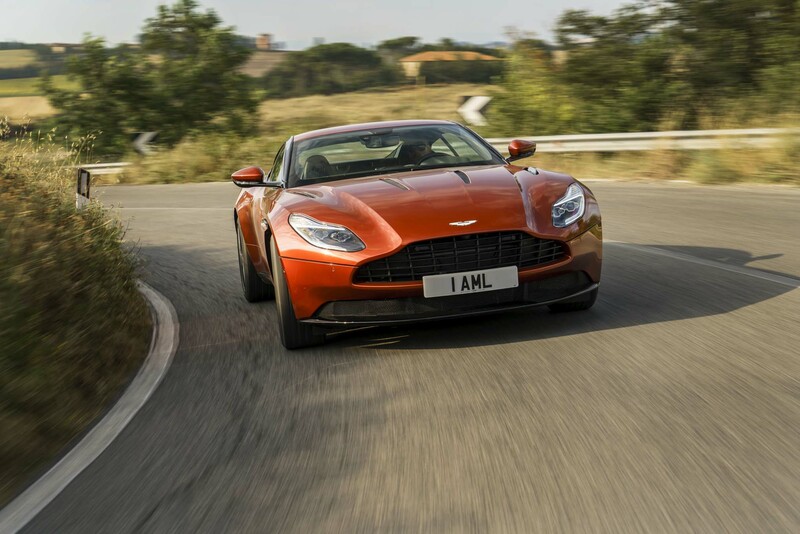 Rather than any perceived lag giving away the plot, it’s quite the opposite: normally aspirated V-12s traditionally need revs to deliver the goods, but the DB11’s mash-up of power and torque catapults the car down the tarmac unabated at any rpm, all the way to 200 mph, Aston says. 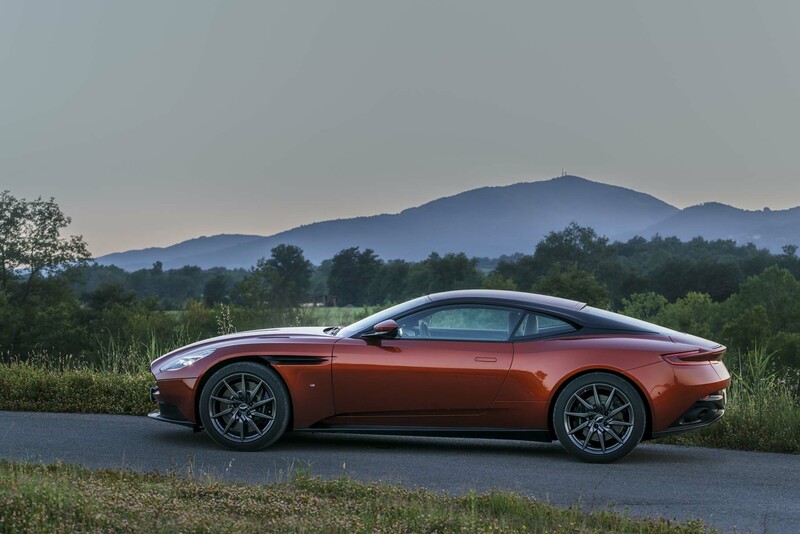 Get “used to” sub-4.0-second blitzes to 60 mph, and even while firing away using the ZF-sourced eight-speed automatic transaxle’s manual-mode, you might find yourself upshifting a few hundred ticks short of the 7,000-rpm redline with no loss in performance. 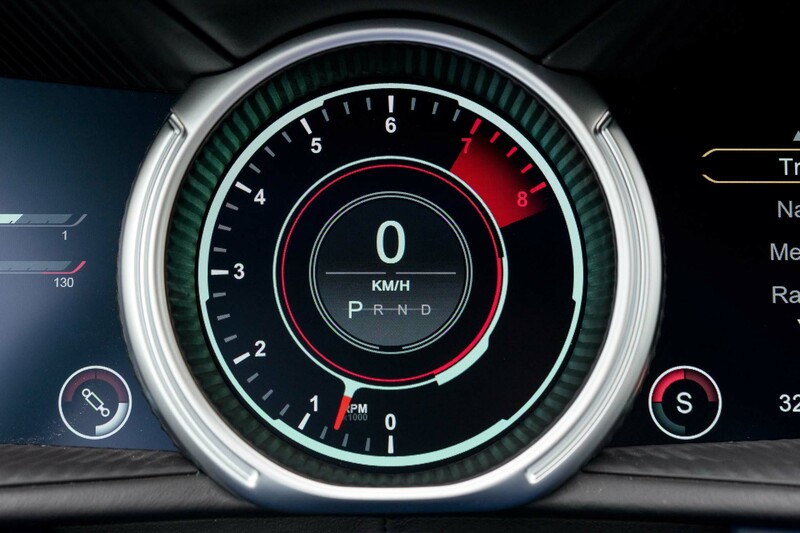 Keep the pedal stuck, however, and the cylinders continue to sing with little hint of accelerative drop-off. 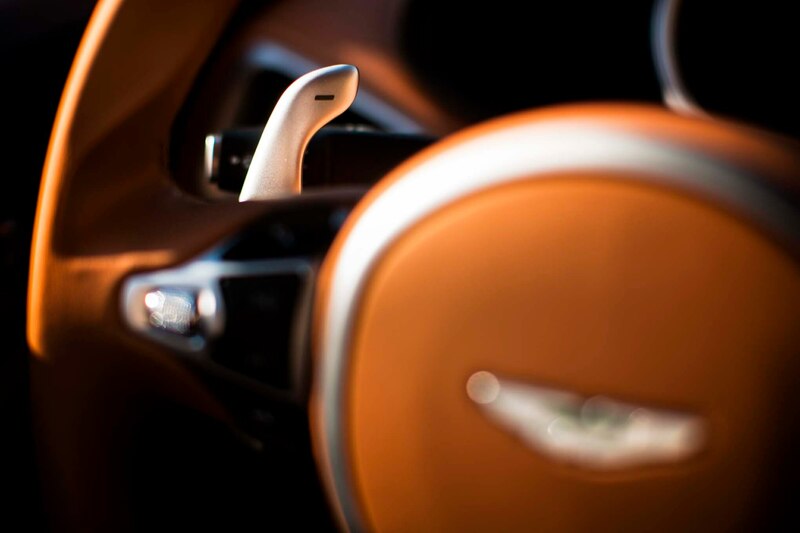 The small reward is worth the extra, if not necessary, revolutions. 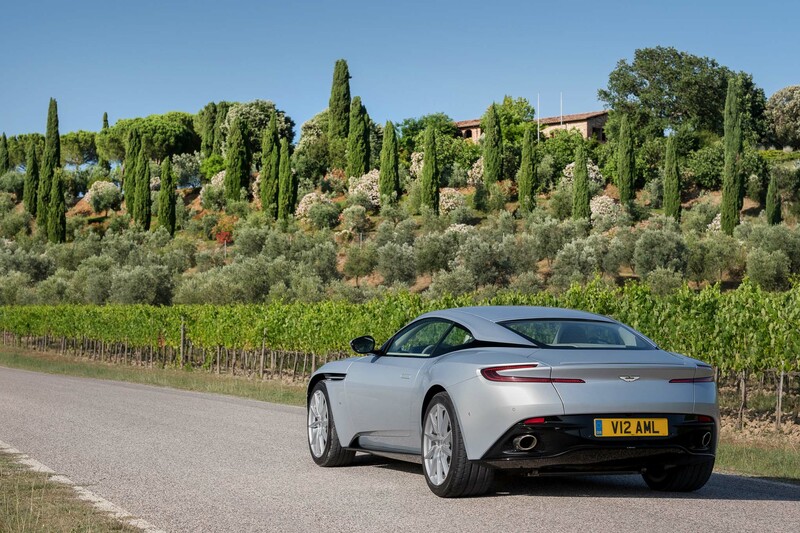 This engine delivers cracking mid-range bang but not the same shower-scene scream as a non-turbo 12, and certainly not a note akin to the powerplants built 85 miles to the north in Maranello, so the only thing for a committed driver to do is pile on the revs. 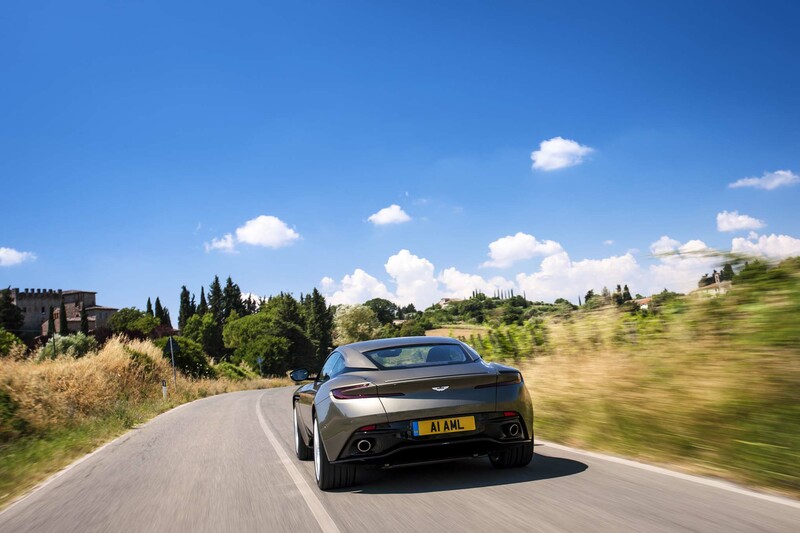 Even with windows down and gunning hard through tunnels, there is a calculated deepness to the tone that manages to satisfy while likely not offending less enthusiastic roadmates. 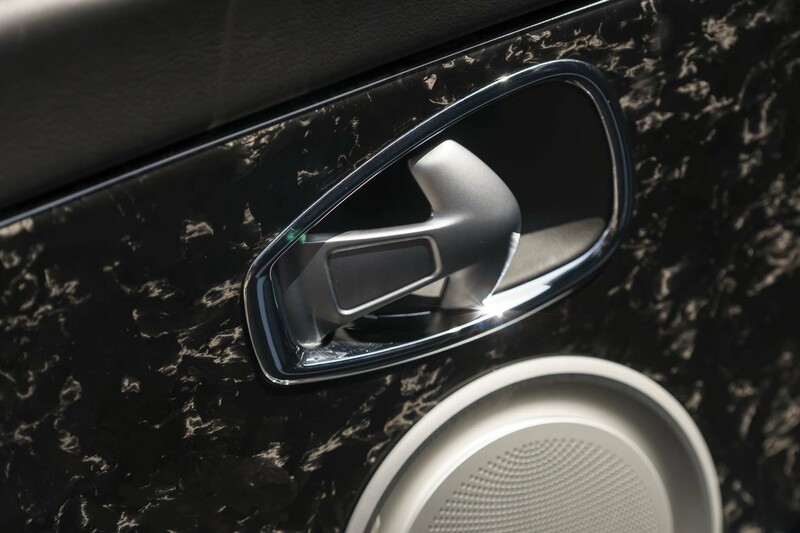 Sport and Sport + modes improve the racket, while a quiet-start feature is intended to keep your neighbors happy in the morning. 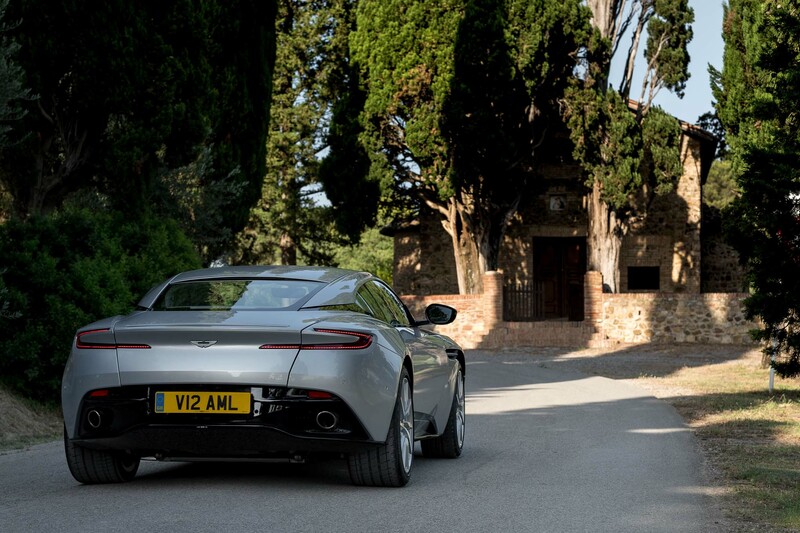 The latter seems unnecessary out here in Tuscany’s wide-open ranges, but gated-community residents might not concur, particularly when you push the start button at 6 a.m. on Monday. 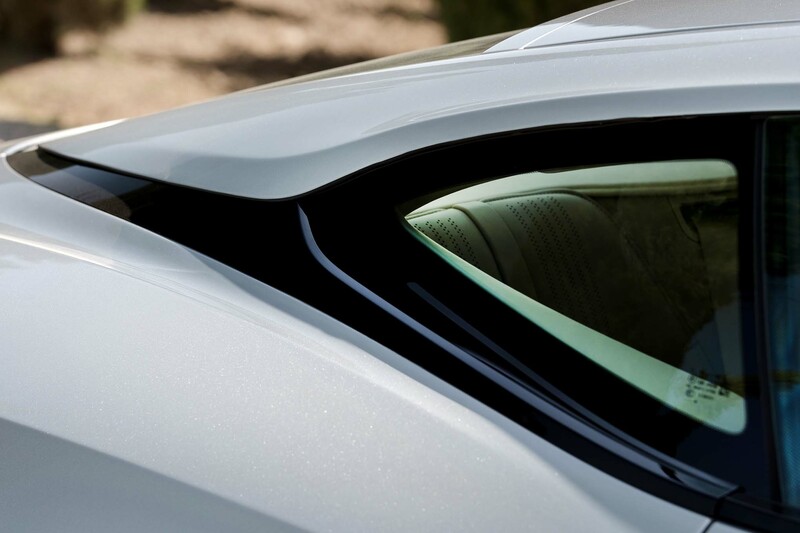 Shattering windows with sonic shockwaves isn’t the point of this car, anyway. 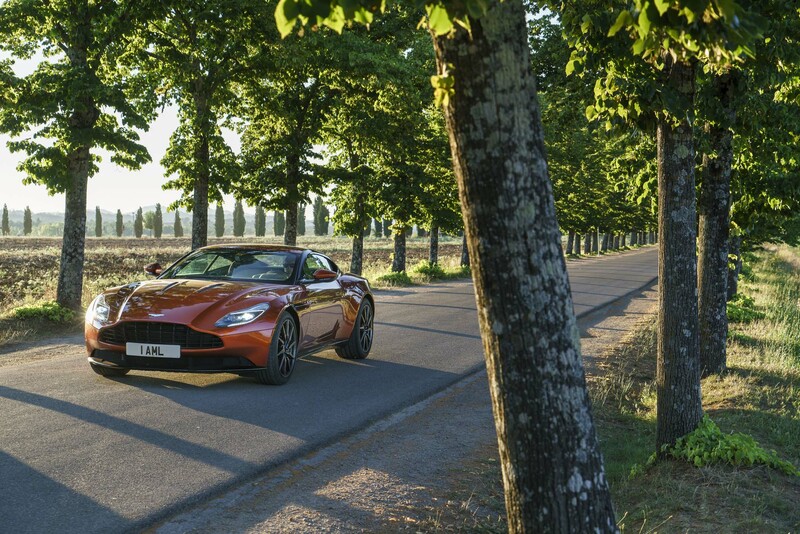 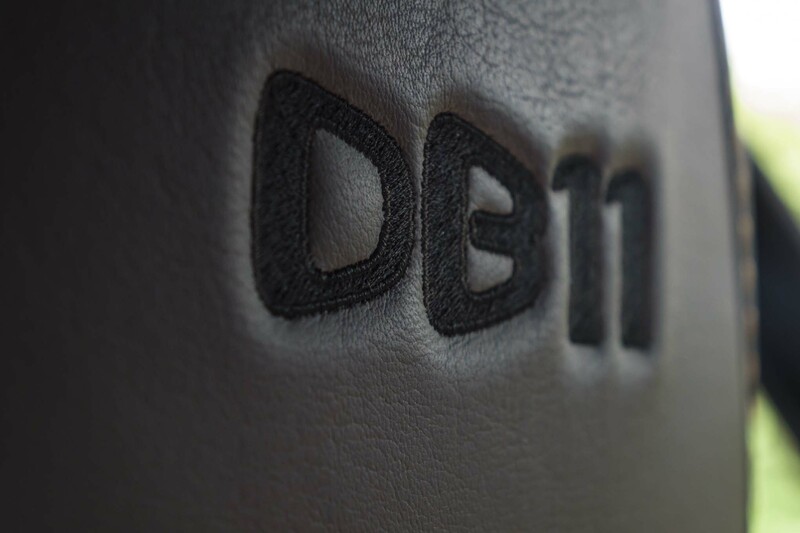 The DB11 is a GT at its core, and it is comfortable and engaging rather than spine-rattling stiff. 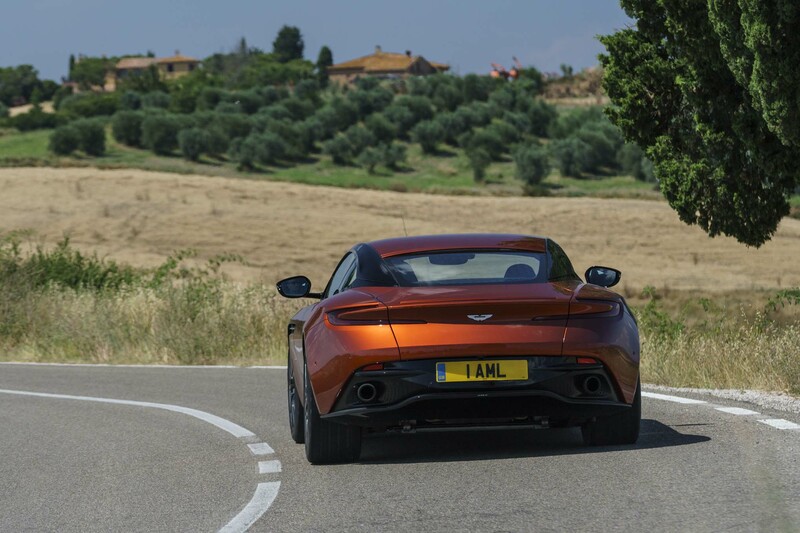 The front suspension remains a double-wishbone layout, but the same is gone in the rear, binned in favor of a multi-link design that delivers less longitudinal stiffness. 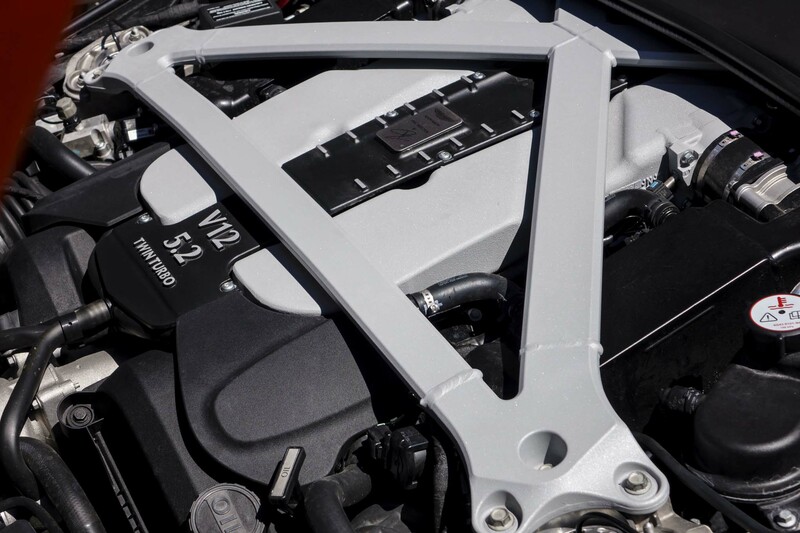 The result is a well-damped ride over bumps and heaves while avoiding a setup that falls over itself as soon as you pitch into a corner, aided further by active torque vectoring. 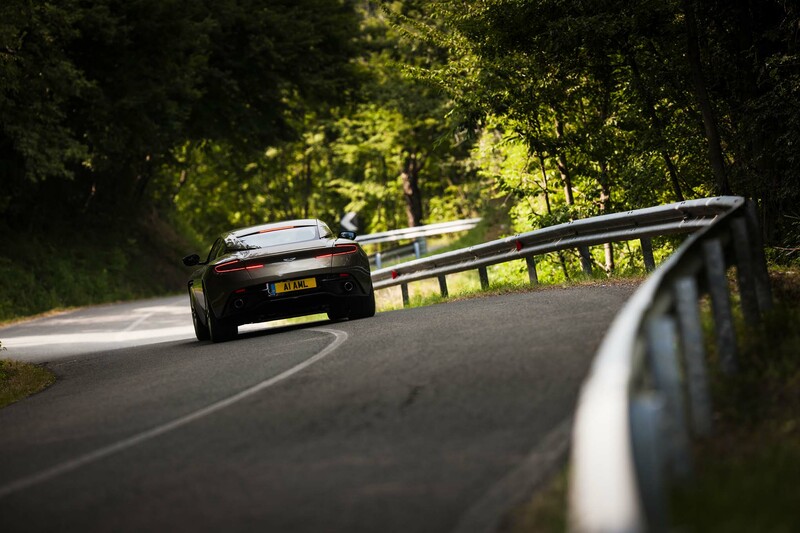 Barrel into a curve too hot and you might slide the front tires a bit, but the handling balance is indeed engaging, especially for a car pushing 4,000 pounds. 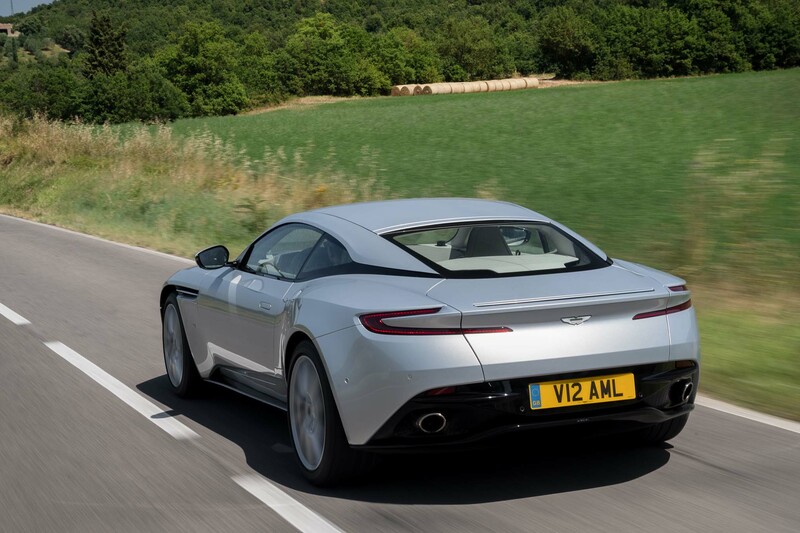 It’s great fun to hustle the DB11 through strings of country-road sweepers that might see its significant mass coming at triple-digit speeds and think, “What the hell?” You’ll be long gone before they figure out what just happened. 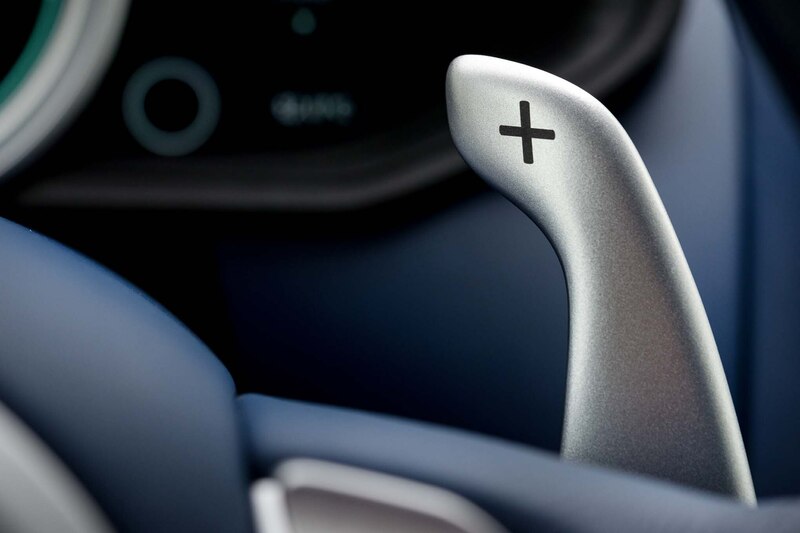 Brake feel is outstanding and the pedal is well positioned for left-foot attacks. 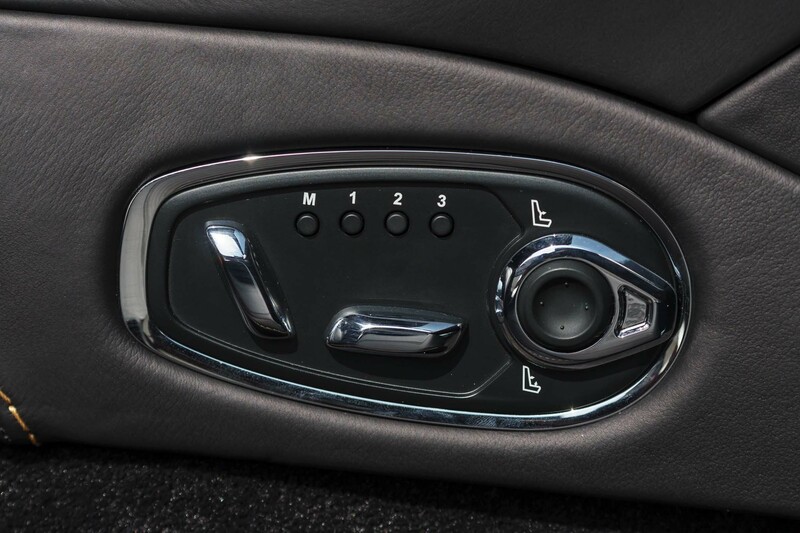 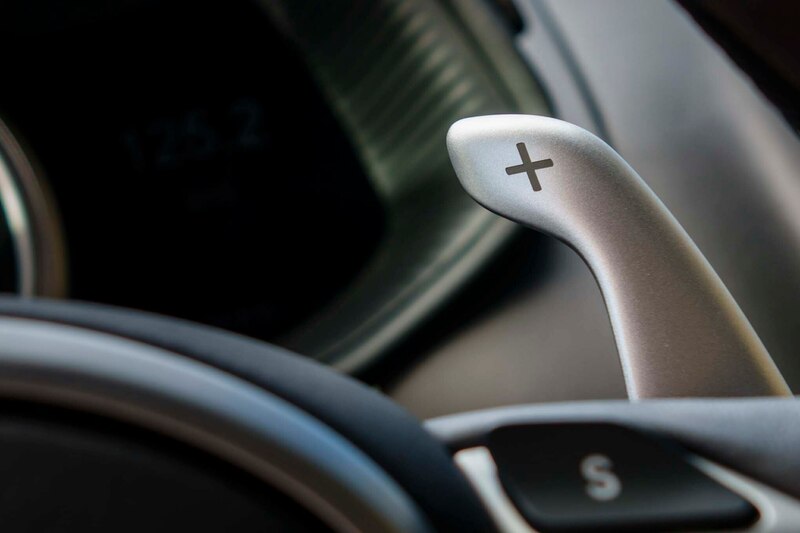 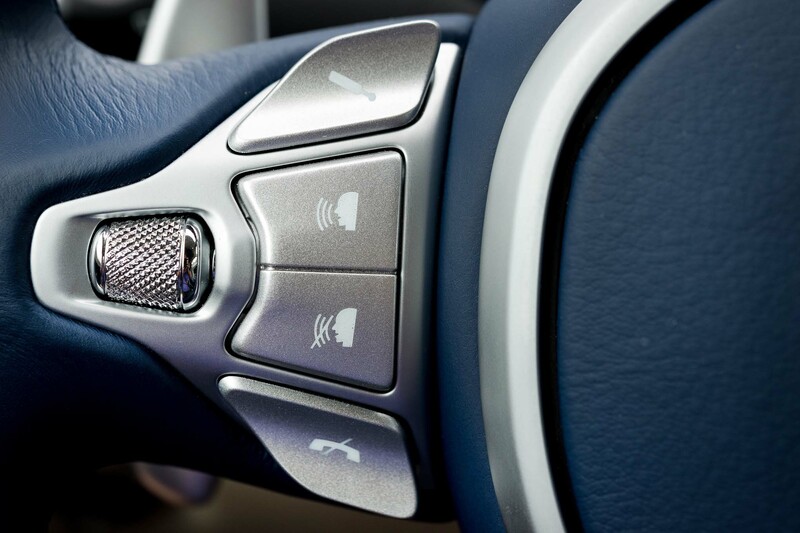 The automatic transmission responds adroitly in Sport mode, even when left to sort out downshifts for itself on aggressive corner approaches. 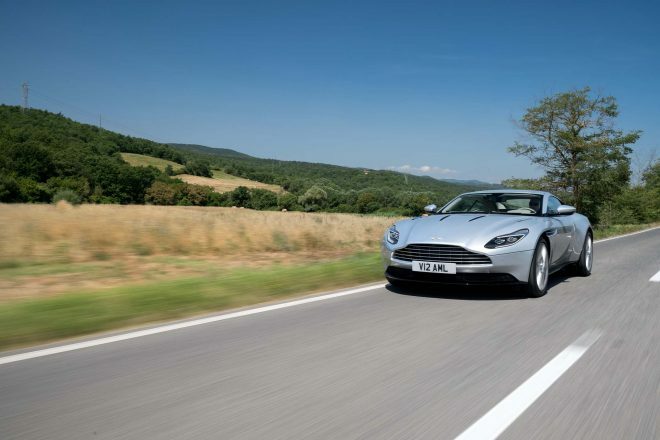 One hundred miles into the drive, I find myself sticking to auto mode because the gearbox generally knows when to stretch the revs and when to blip its way down through the gears under braking, keeping the engine smack in the middle of its expansive powerband. 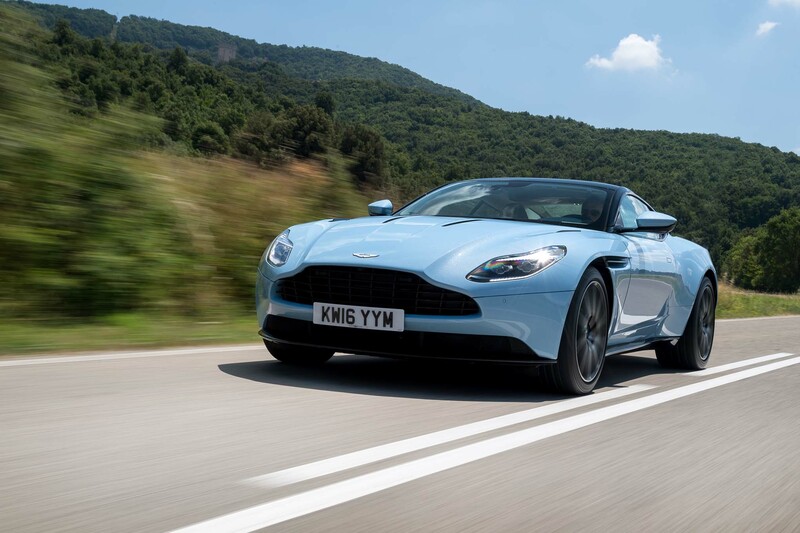 One caveat: these are preproduction cars with some wonkiness to their software tuning, at times causing lazy or imprecise shifts and a very noticeable delay in response when coasting, say at 10 mph in second gear, and then jumping back on the throttle. 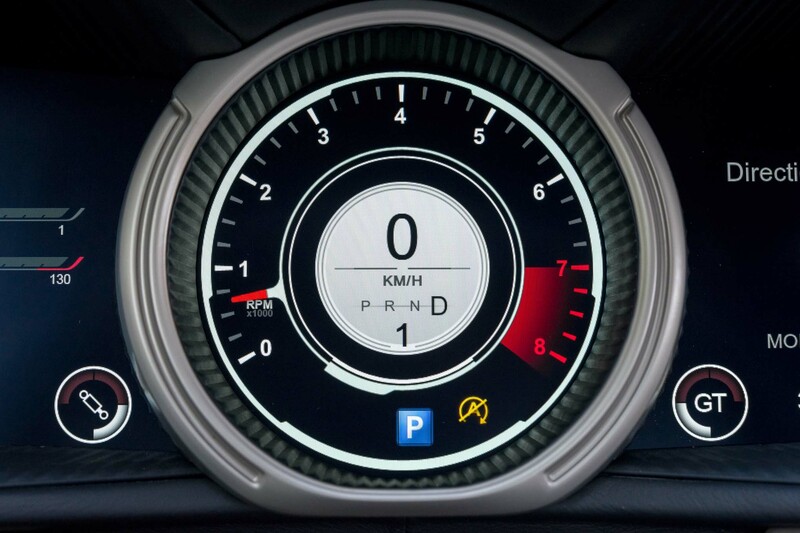 There’s also a hint of gear whine. 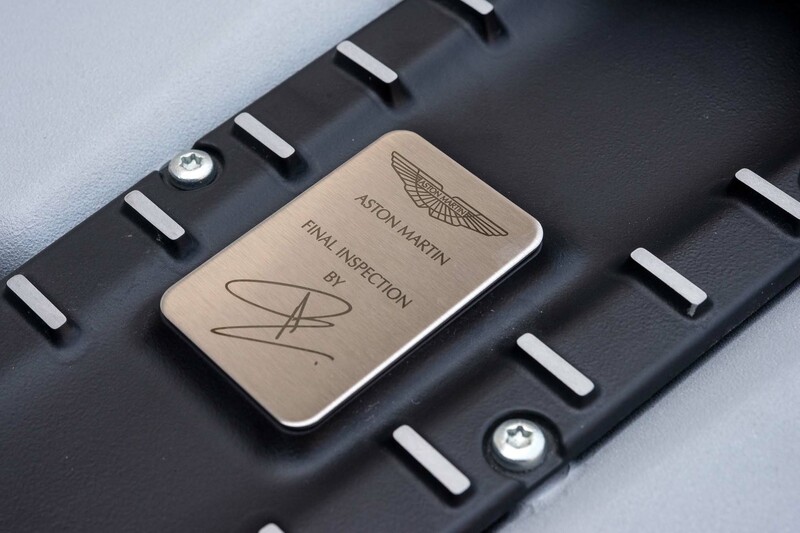 I expect Aston to sort this out before it delivers final-spec cars. 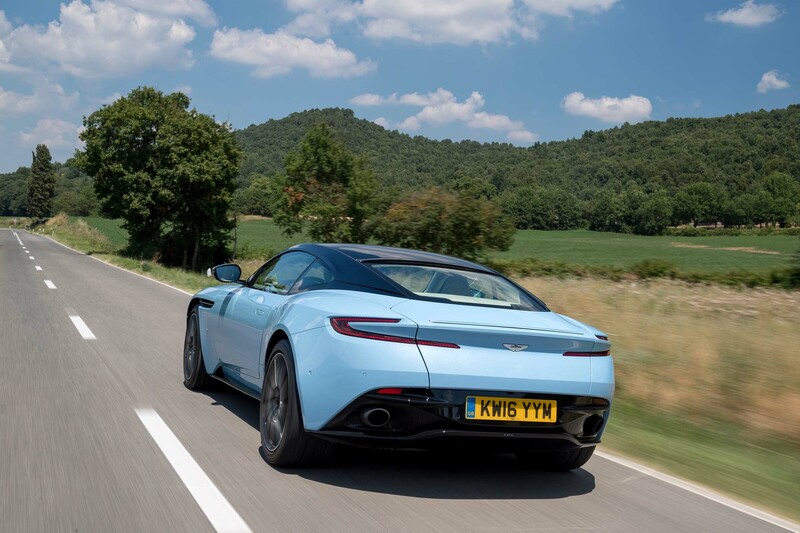 Some will bemoan the change to electric-power-assisted steering — the previous hydraulic system was magic in terms of feel—but the 13:1-ratio rack, the quickest yet in an Aston, is predictable and communicative. 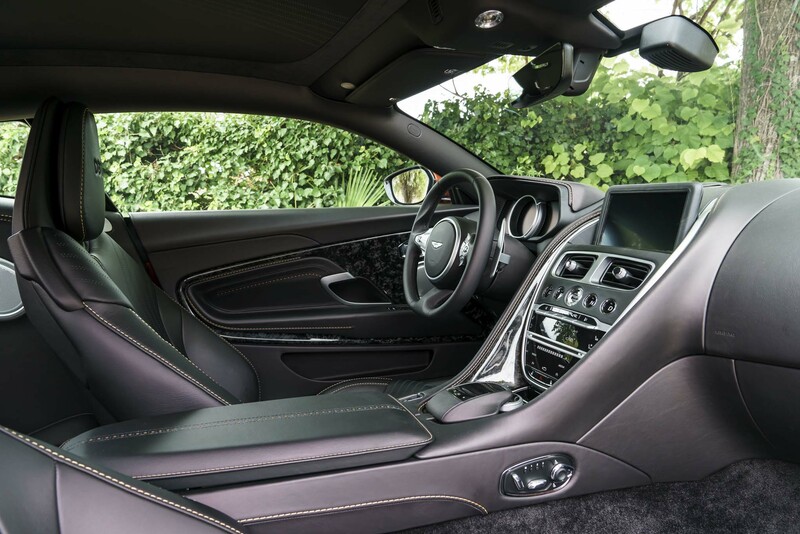 It’s a difference anyone looking for a true luxury GT car will appreciate. 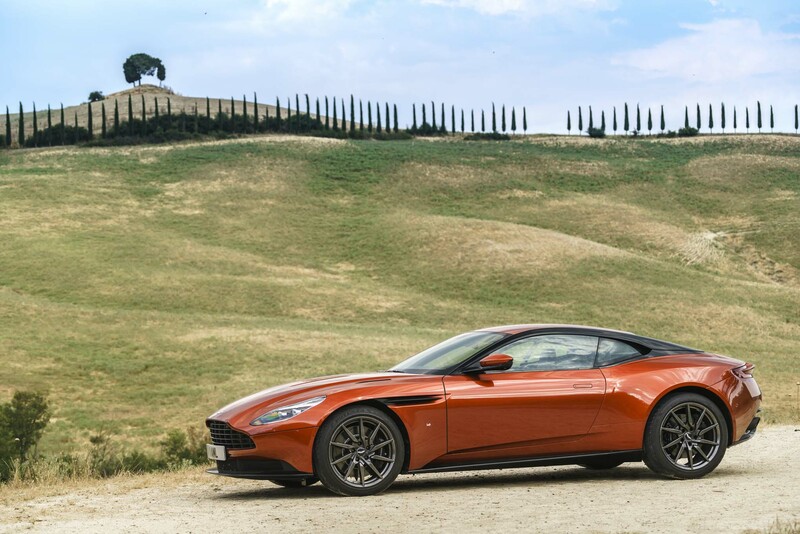 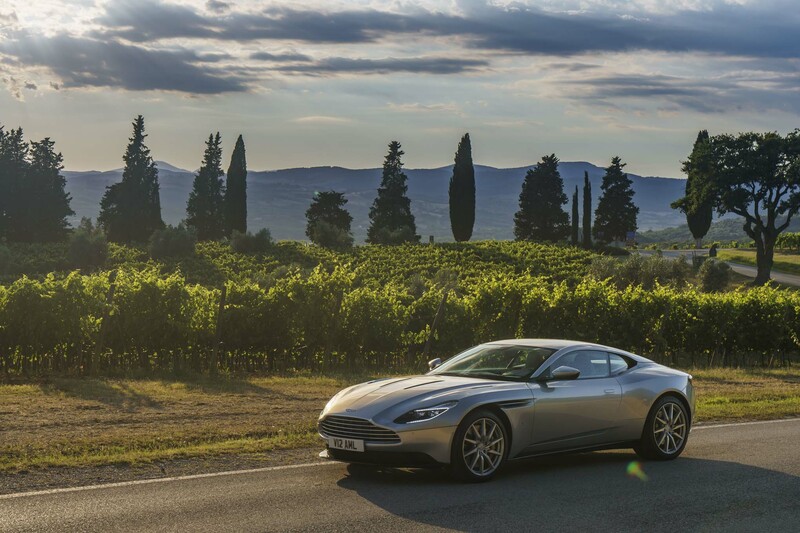 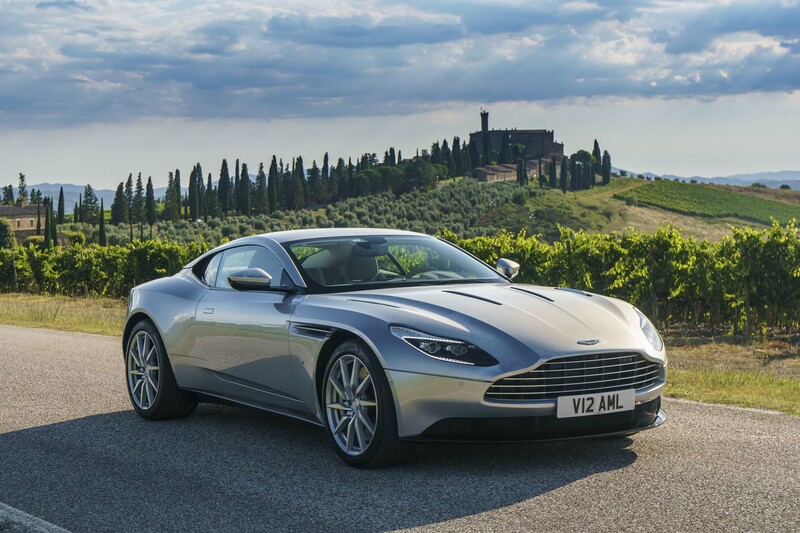 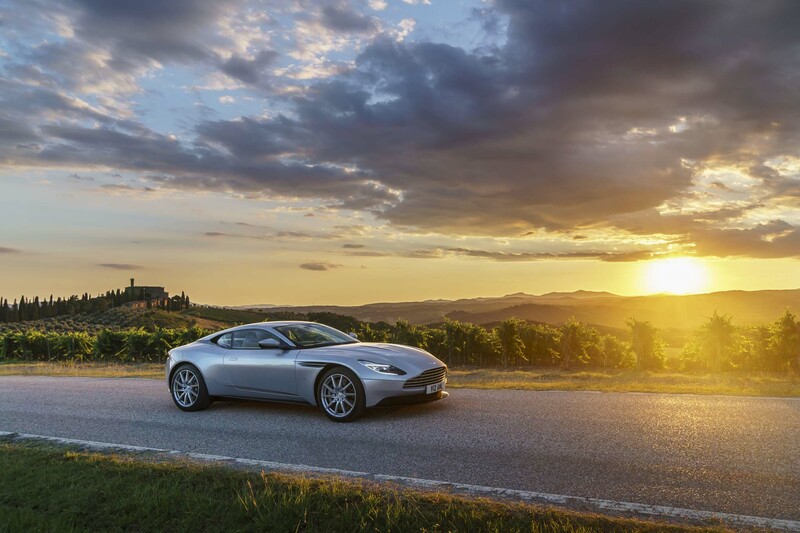 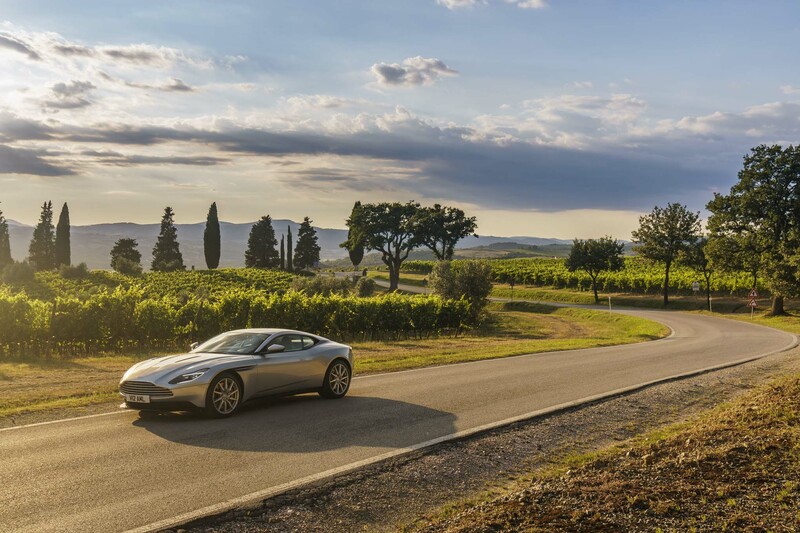 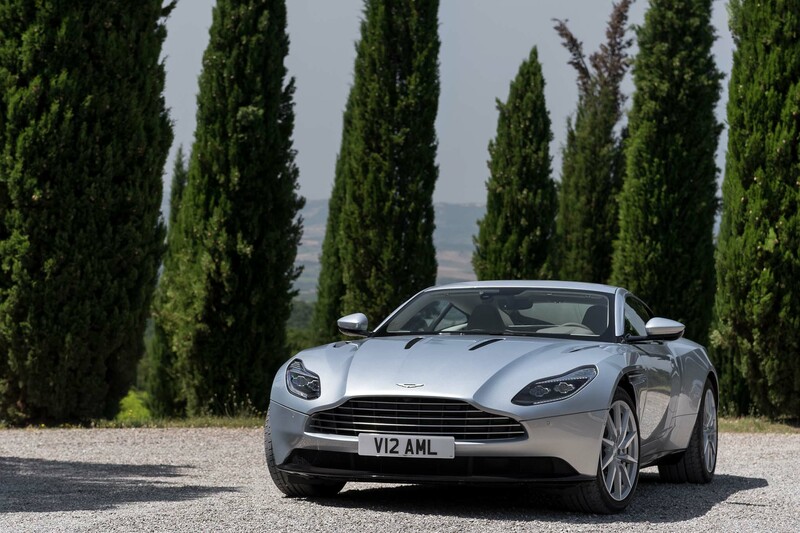 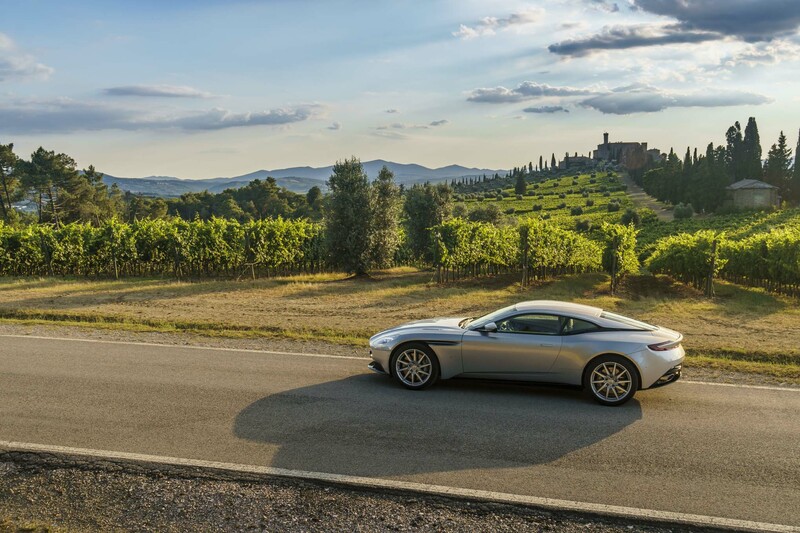 There are faster cars and there are more luxurious cars, but the DB11 stakes claim to a different space. 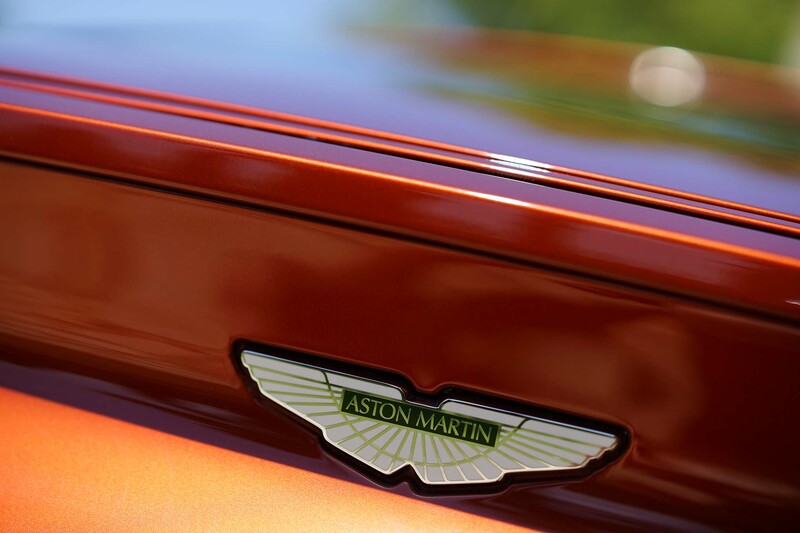 Call it a strong first salvo in Aston’s near-term game plan.